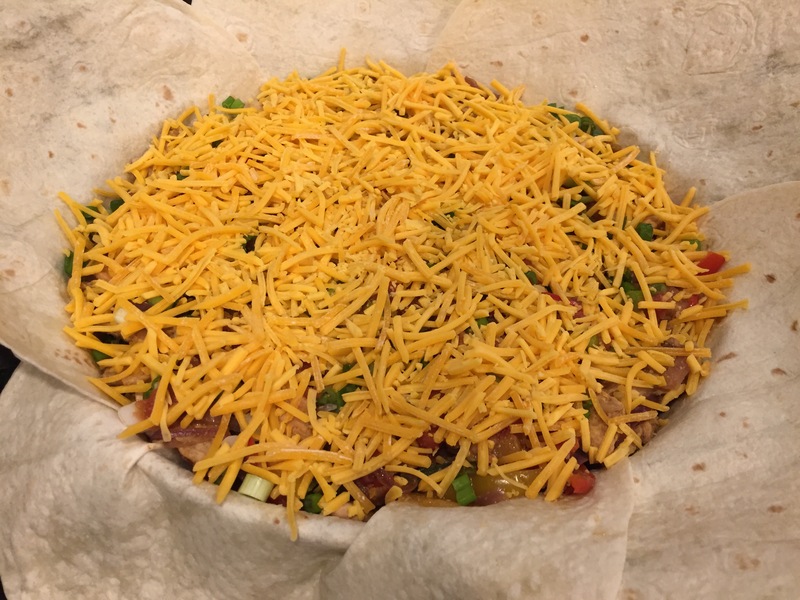 My husband saw this video on Facebook and recommended it as good food for watching bowl games. 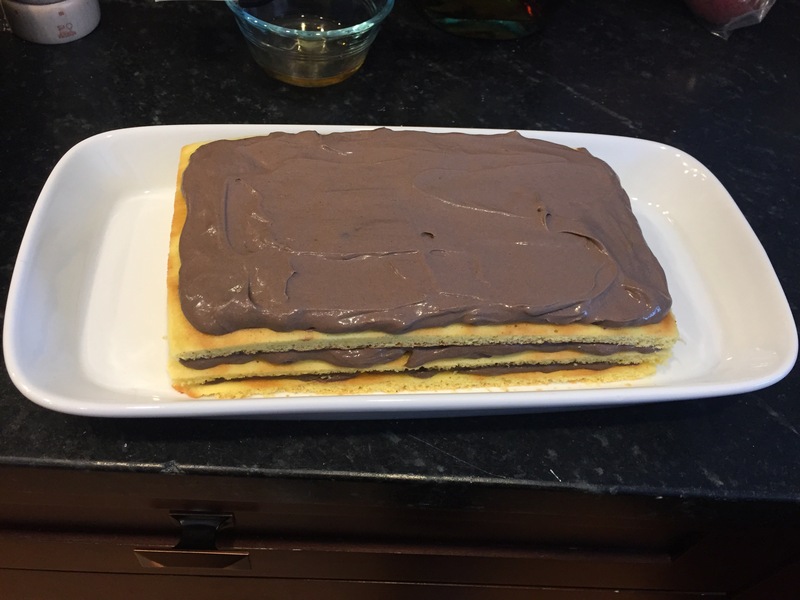 I decided it was most of a good recipe and went with it. 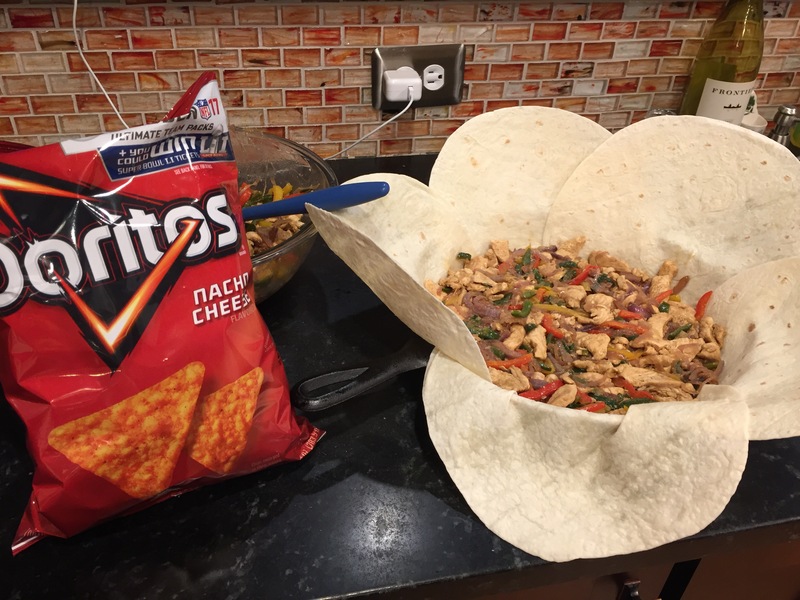 I got out most of my ingredients (managed to forget to put the Doritos and paprika in the pic). 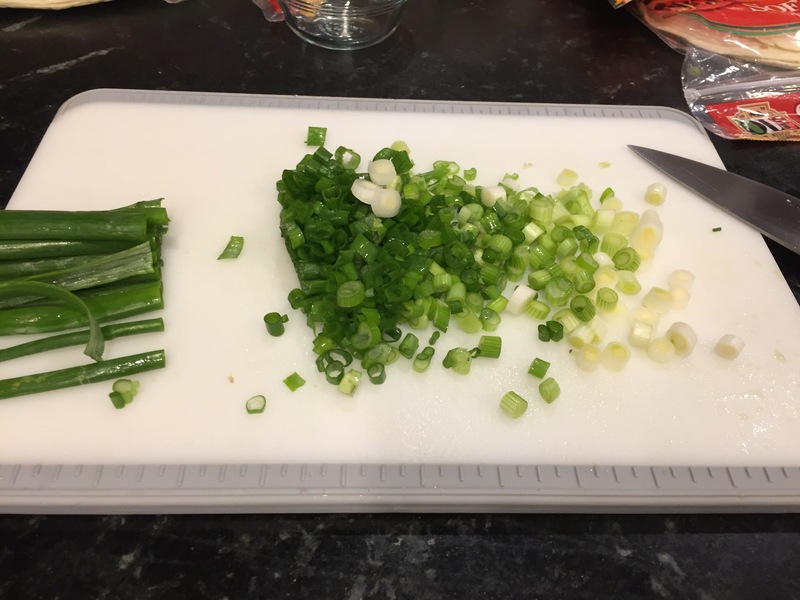 And started chopping my vegetables. 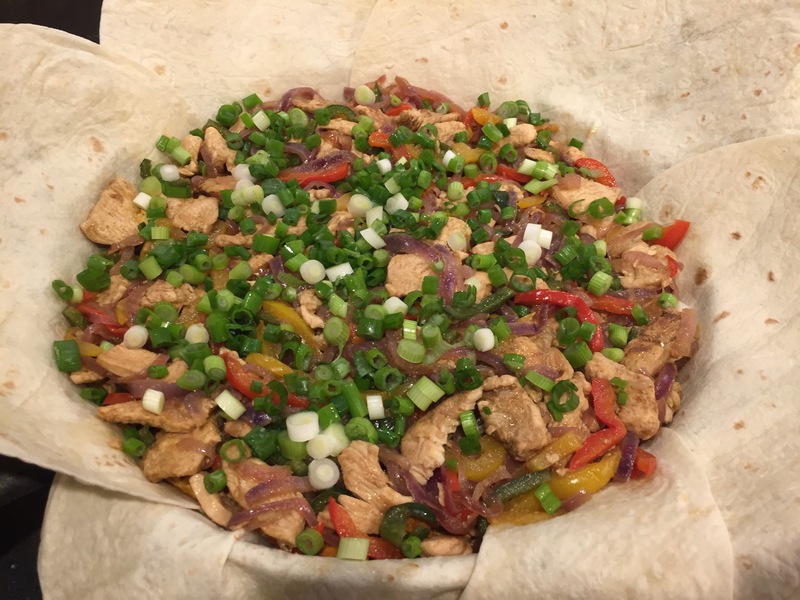 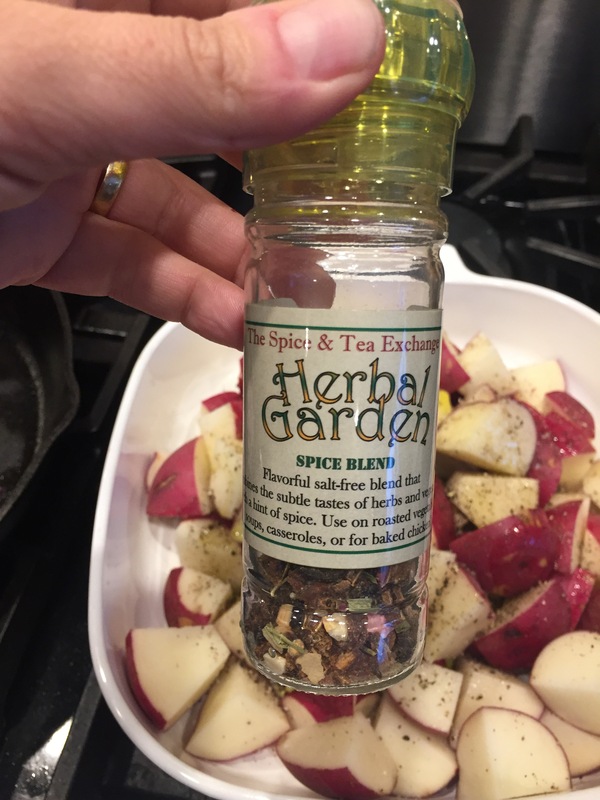 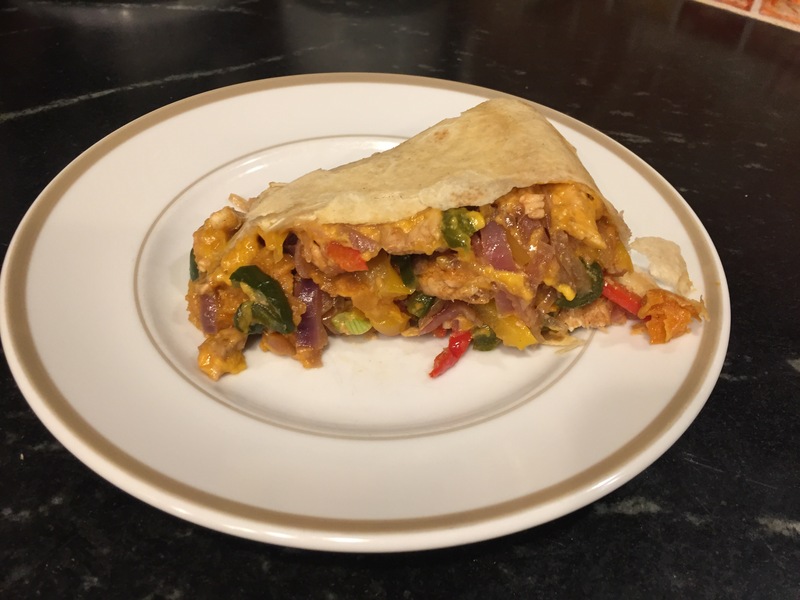 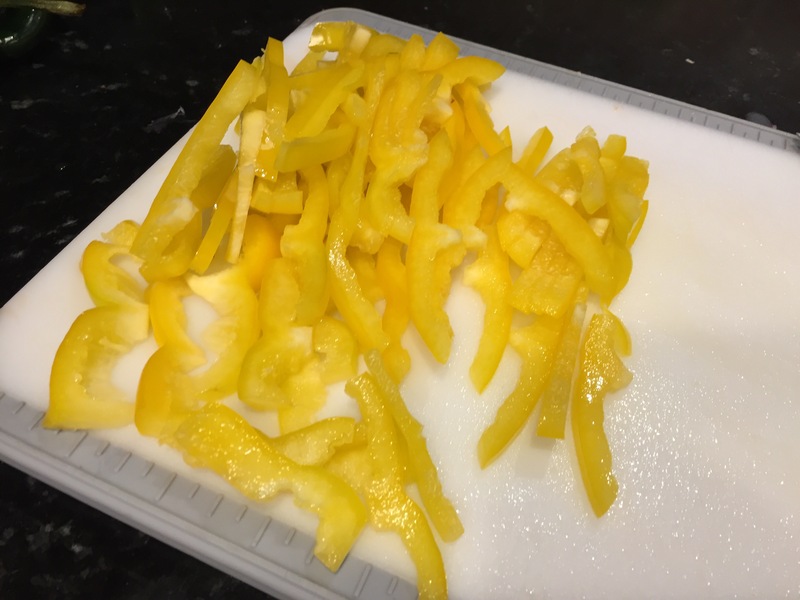 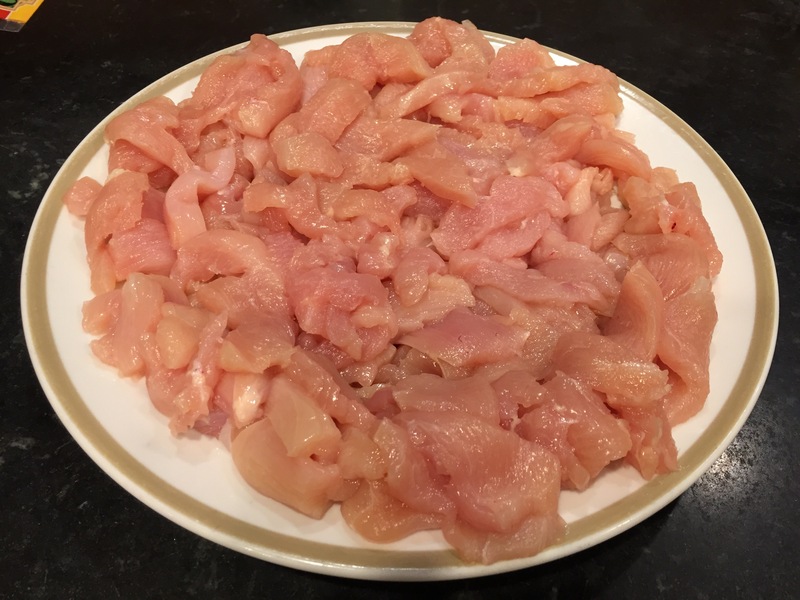 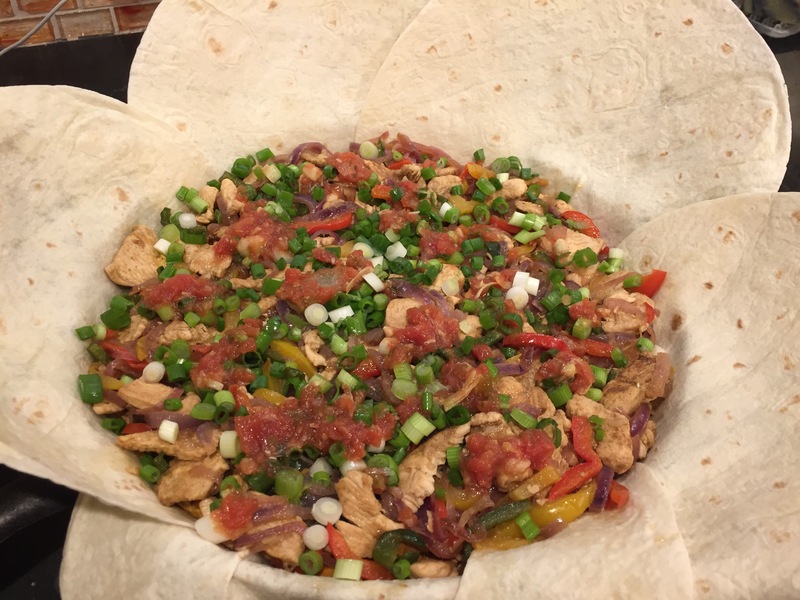 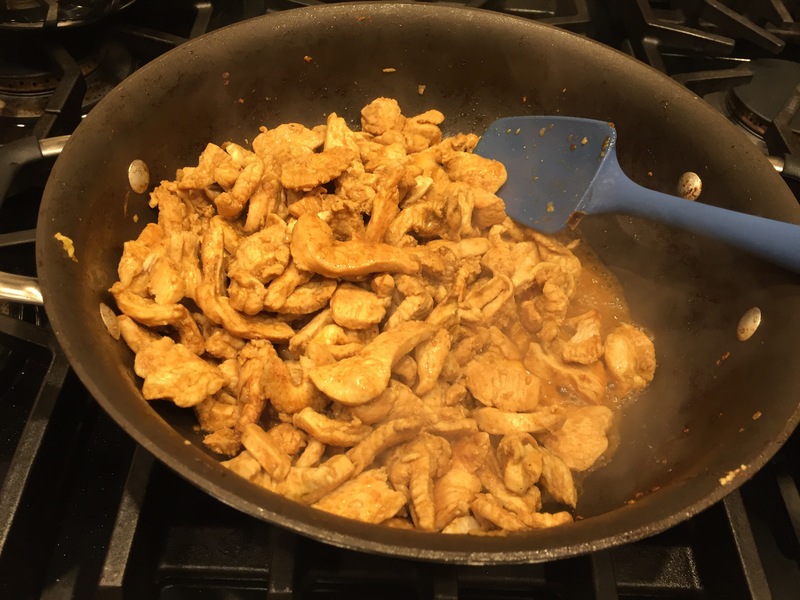 I had already decided that I wouldn’t bake my filling, I don’t for fajitas… I started with the onions, and while they cooked I chopped the peppers and green onions. 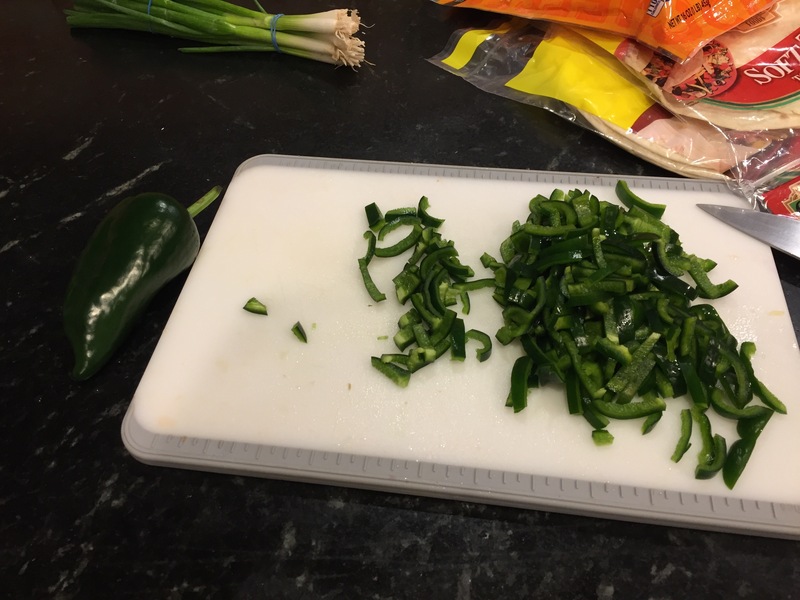 I added poblano peppers with the bell peppers for added flavor. 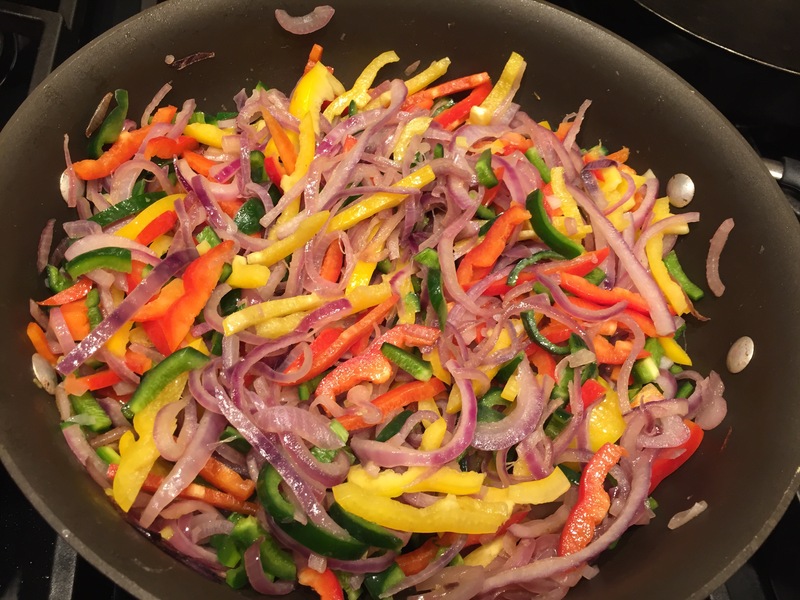 Once the onions were soft, I added the peppers to the skillet with a bit of cumin for flavor. 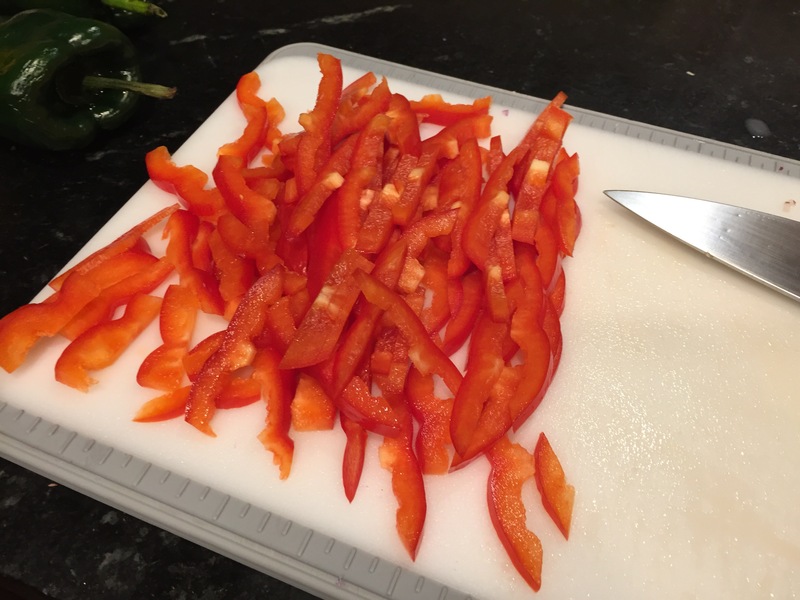 I only let these cook until the peppers just started to soften. 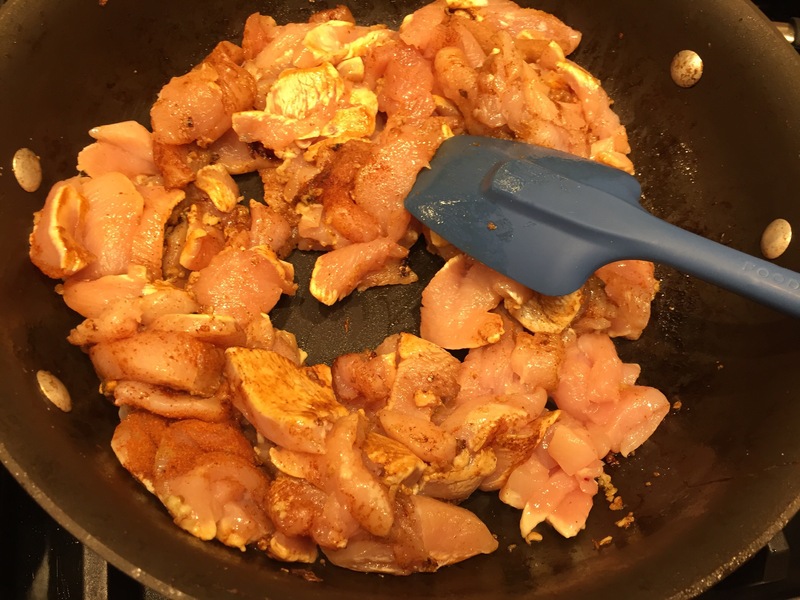 While they cooked, I peeled my garlic and sliced then seasoned my chicken. 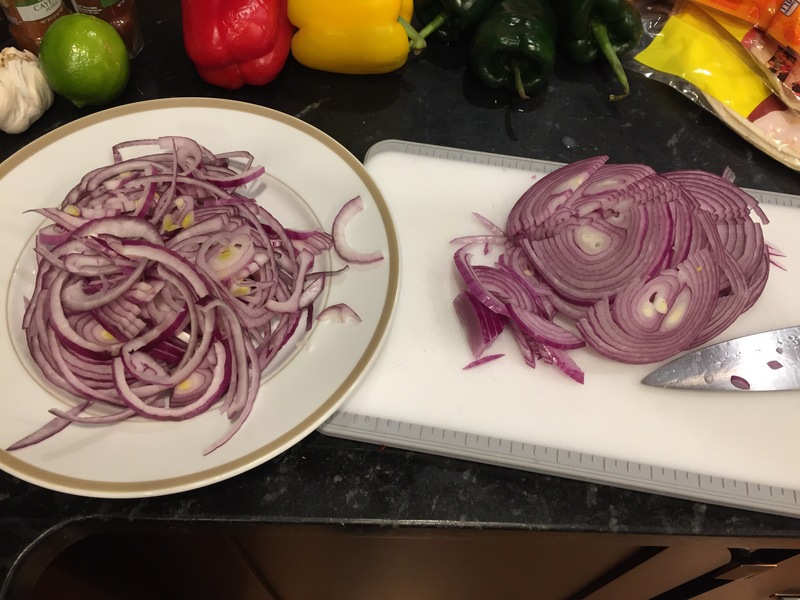 I set aside the onions and peppers in a large bowl and then used my now nicely seasoned pan to sauté the garlic and once fragrant I added and cooked the chicken until it was just cooked through. 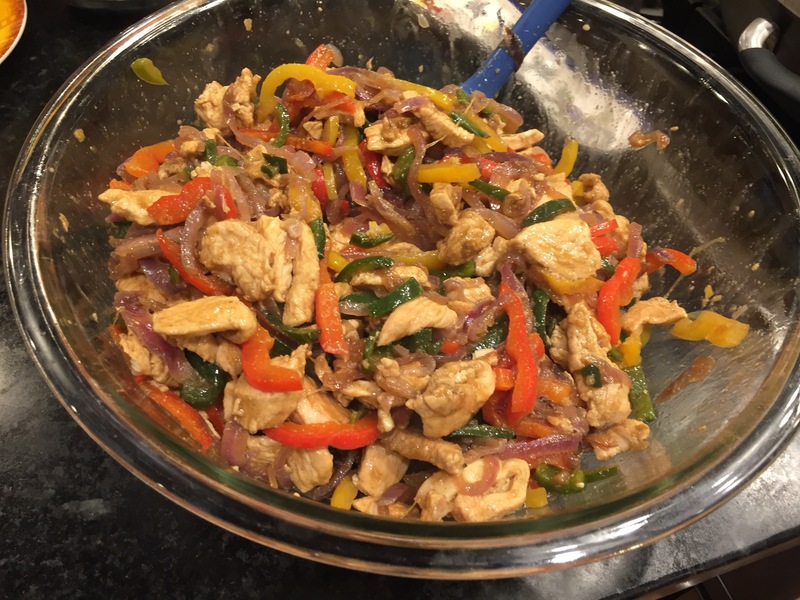 I added the chicken to the vegetables and stirred them together with the lime juice. 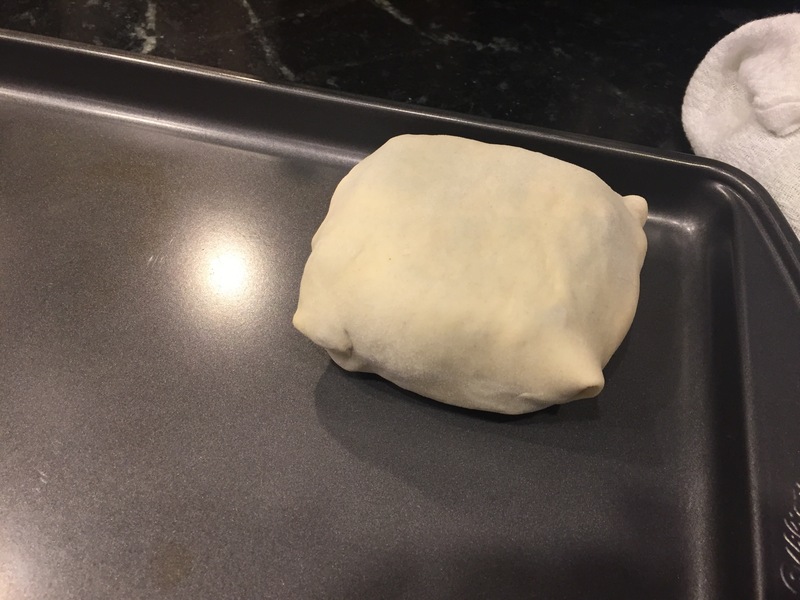 I popped it in the oven as directed – perfect! 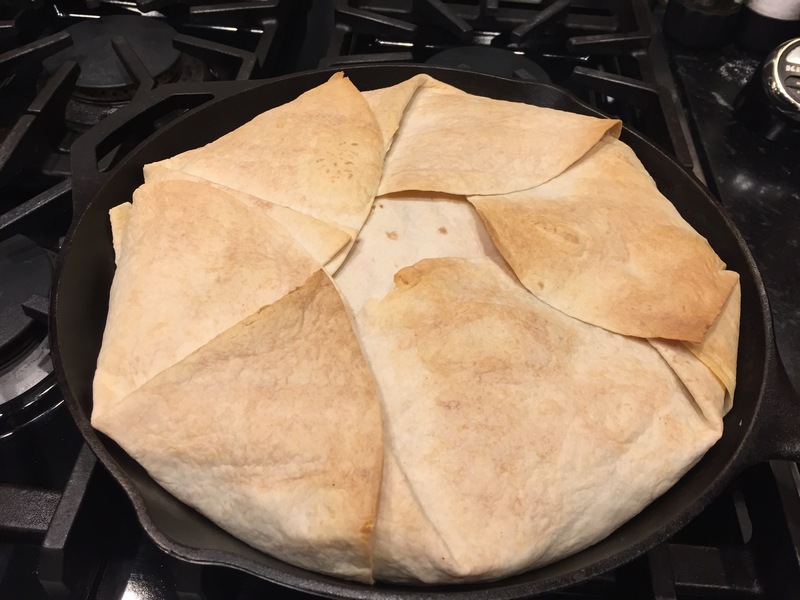 I served it with guacamole and sour cream. 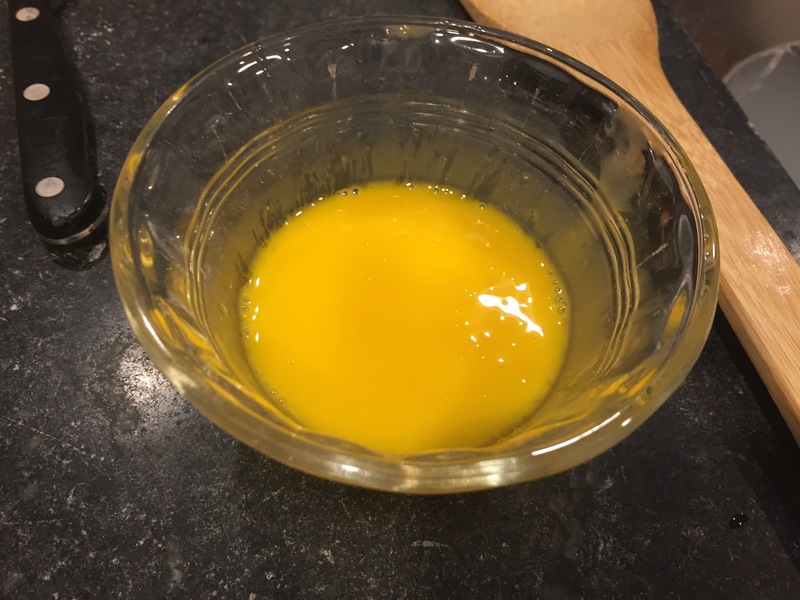 Heat ~2 Tbsp. 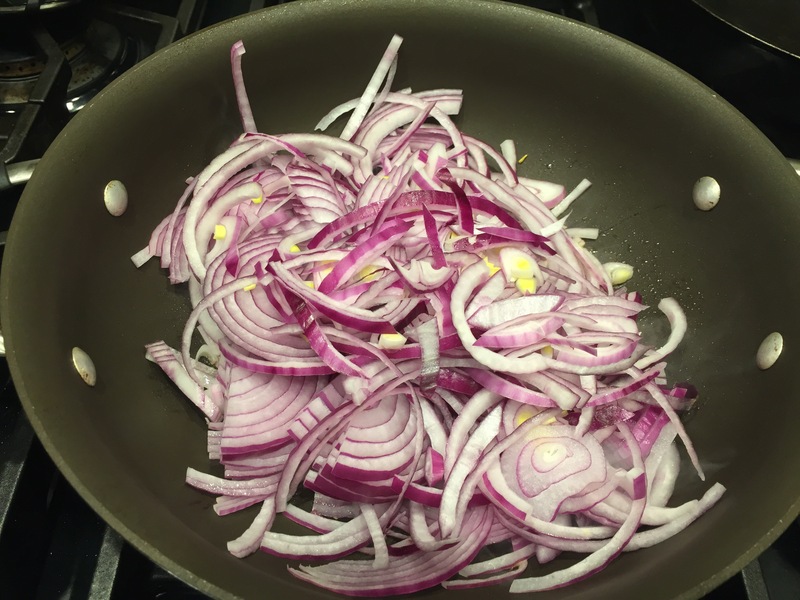 olive oil over medium high heat in a large non-stick skillet, when hot, sauté the onions until they are tender. 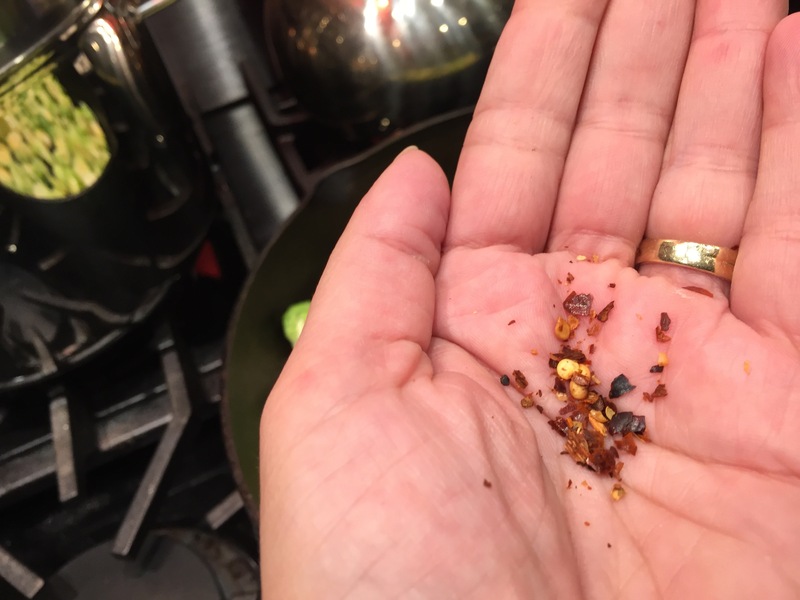 Then, add in the peppers with ¼ teaspoon of cumin. 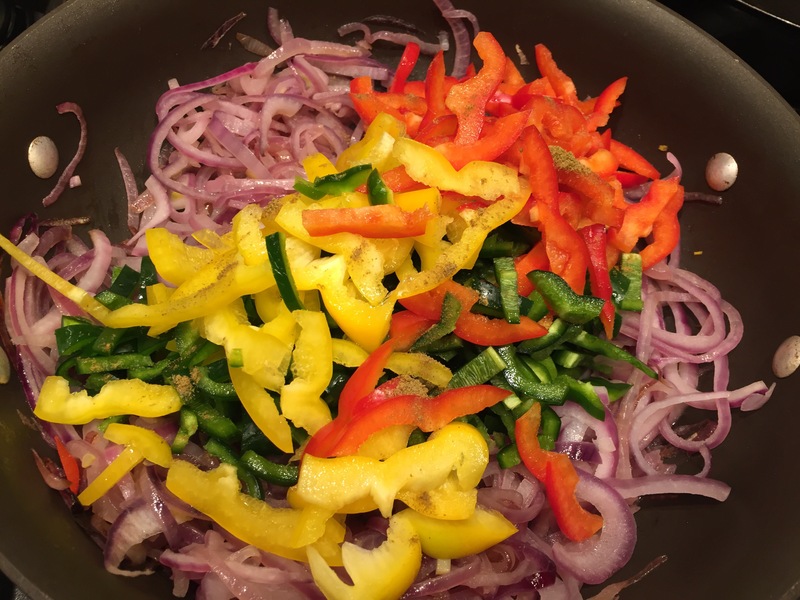 Continue until the peppers just begin to soften then set aside in a bowl. 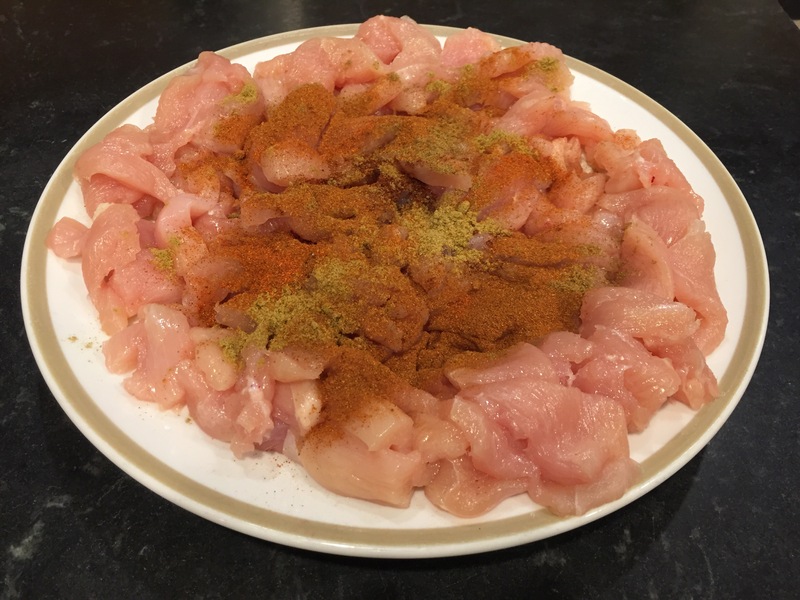 While the vegetables cook, season the chicken with salt, the remaining cumin, cayenne pepper, ancho chili pepper, and paprika. 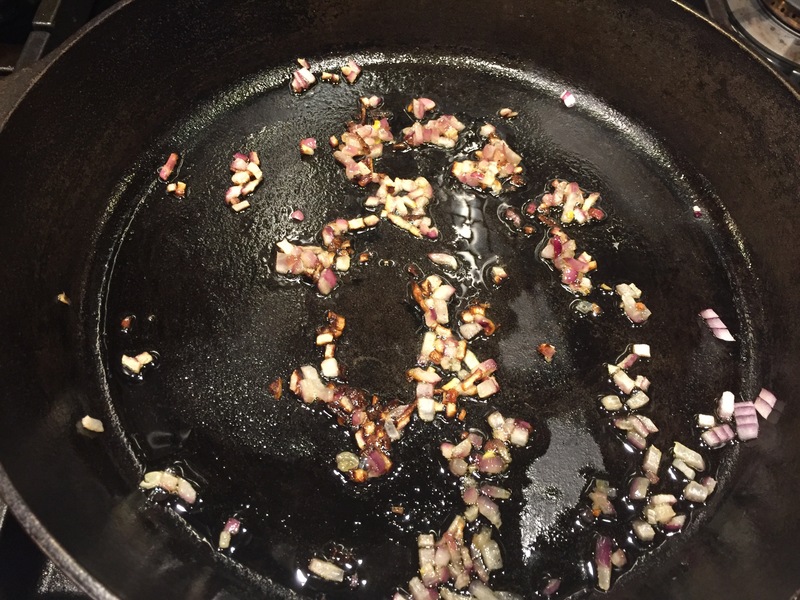 In the same skillet, heat an additional 1 Tbsp. 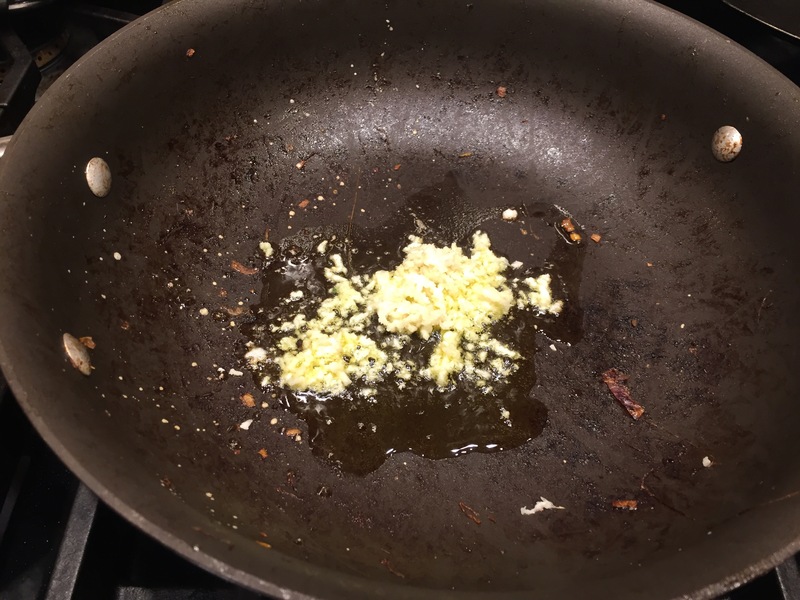 olive oil and then sauté the garlic until just fragrant. 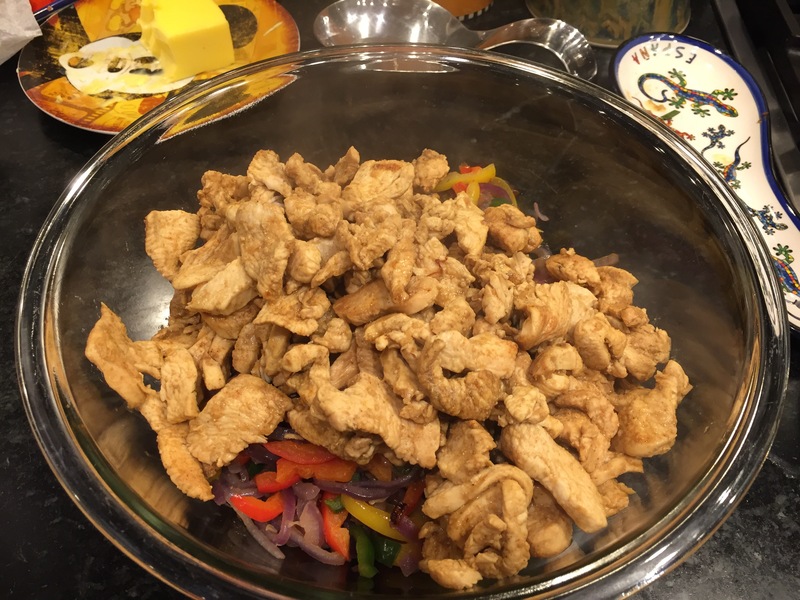 Add the seasoned chicken and remove from the heat when just fully cooked and stir into the vegetables with the lime juice. 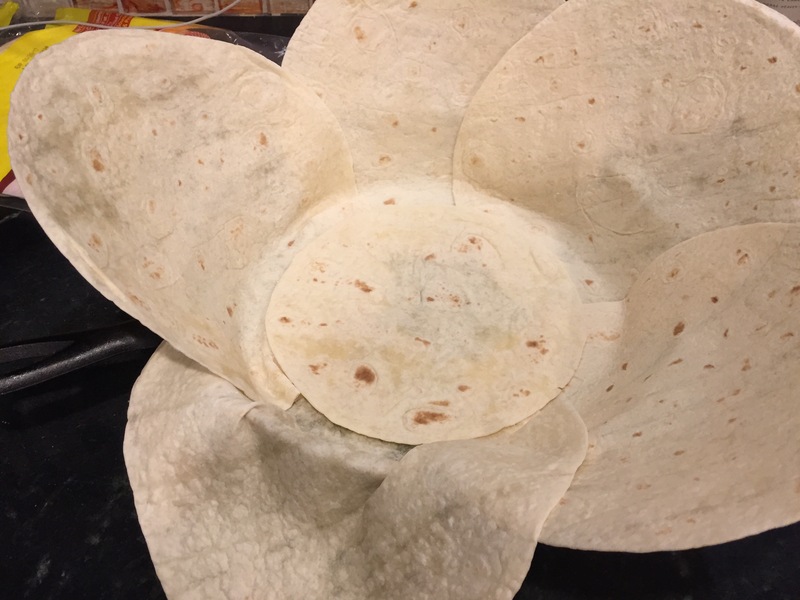 Grease a large cast iron skillet with oil and lay down 5 of your tortillas, overlapping, in a flower formation. 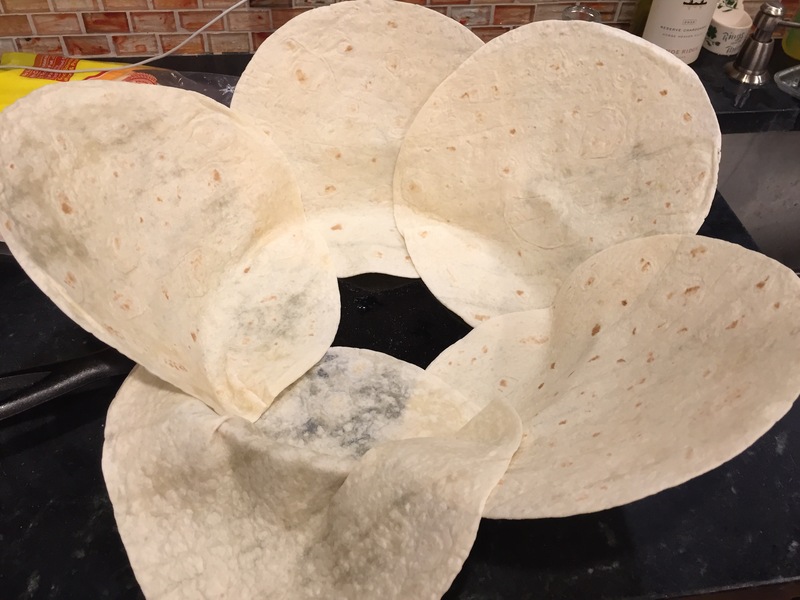 Put the smaller wrap in the center. 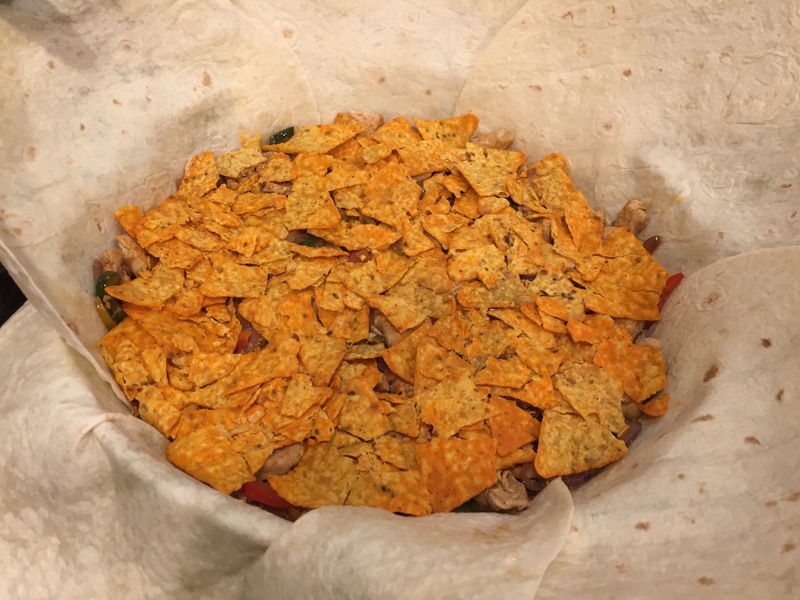 Layer 1½ cups cheese, half of the chicken mixture, and then the doritos. 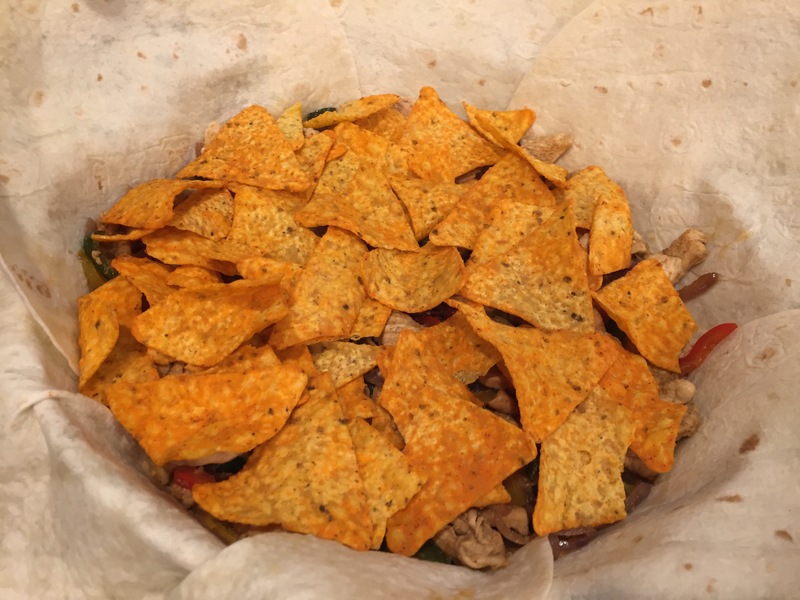 Flatten the doritos gently with your hand and continue to layer the remaining chicken mixture, green onions, salsa, and the rest of the cheese. 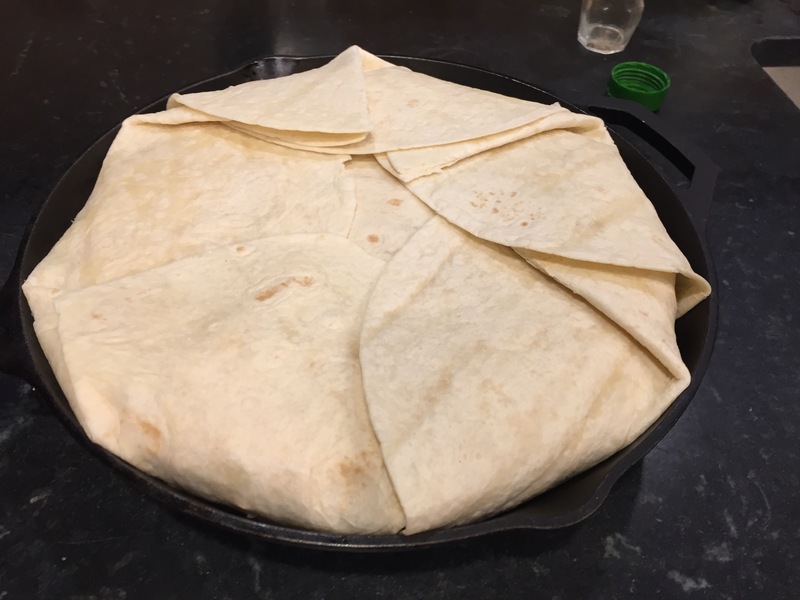 Place a final wrap on top in the center and fold the rest of the wraps over. 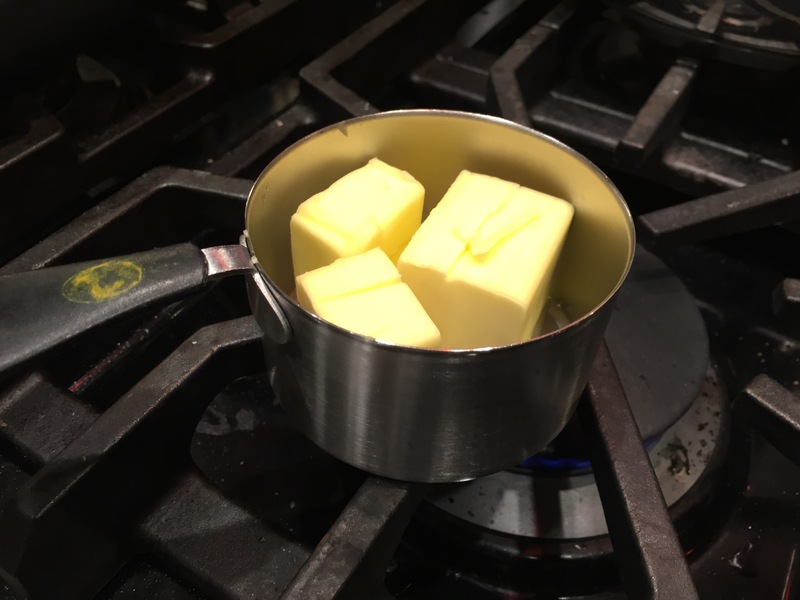 Bake for 30 minutes at 375°F. 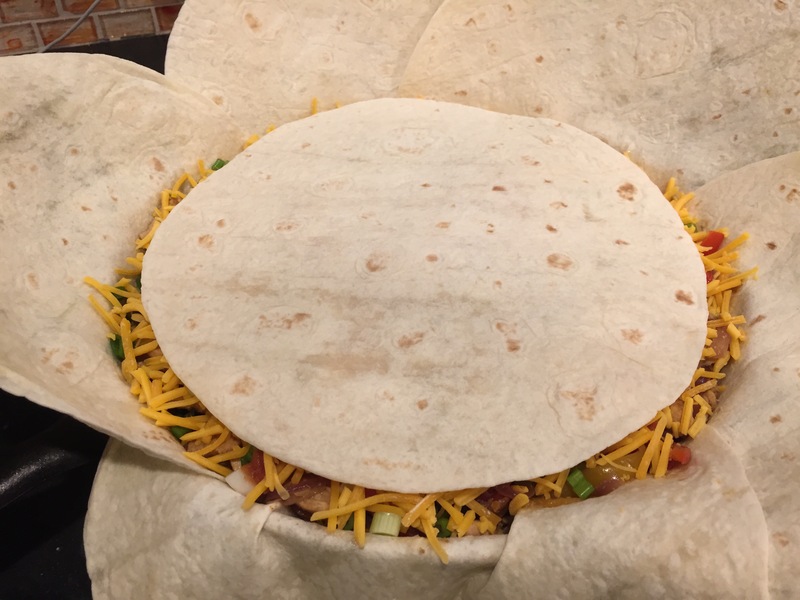 Flip the crunchwrap onto a board; cut and serve. 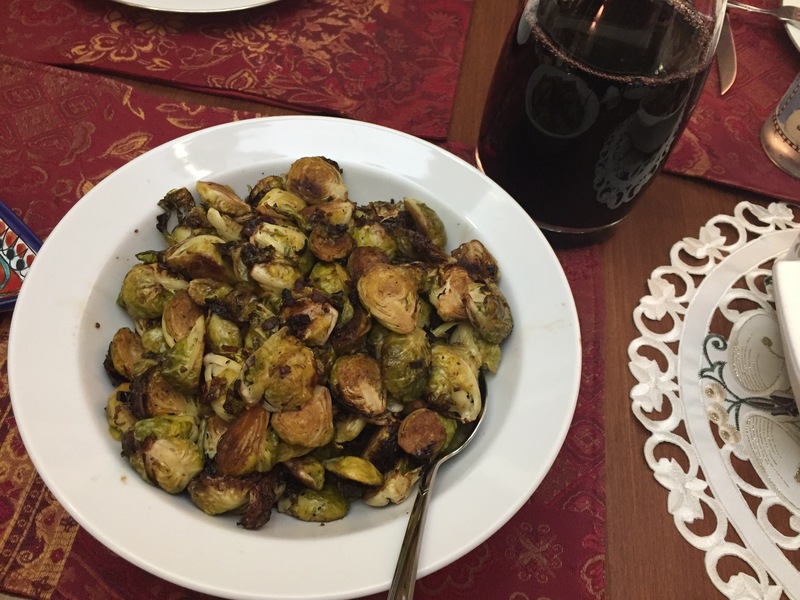 Merry Christmas to you and yours! 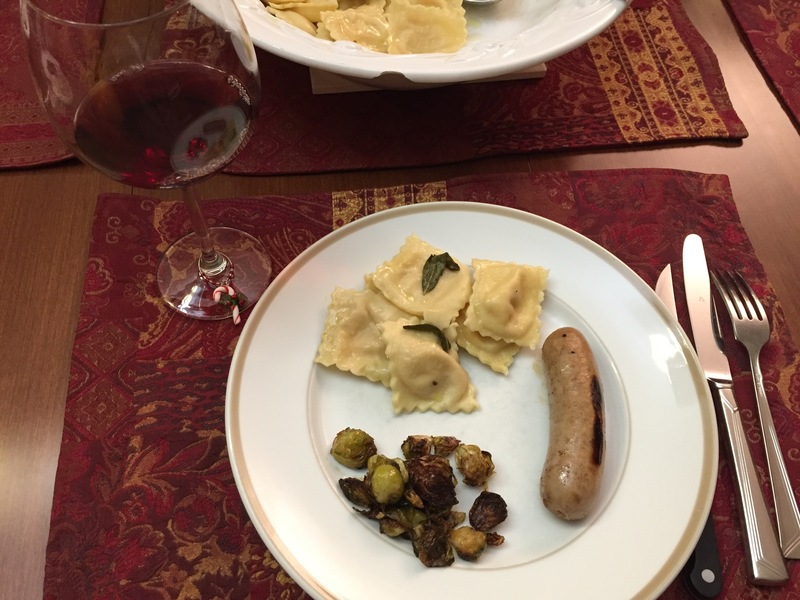 I hope you had a wonderful day and dinner. 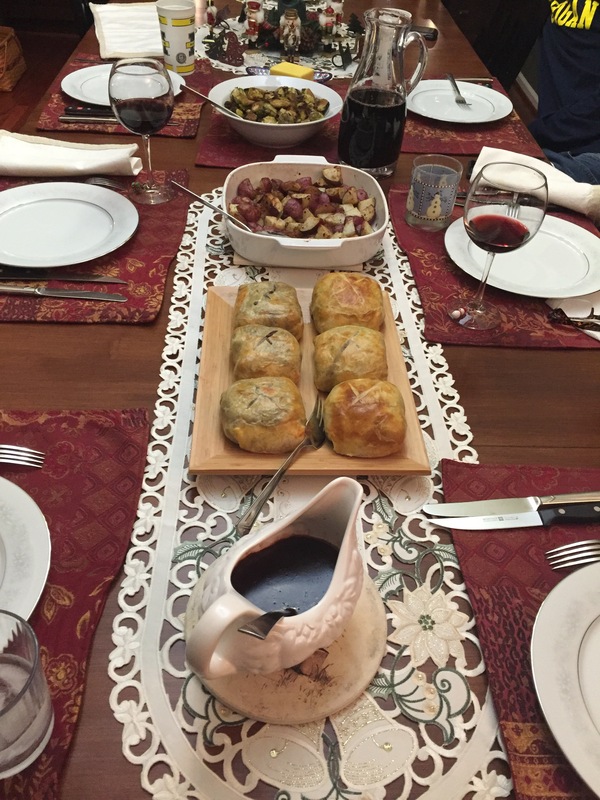 Or Happy Holidays if you don’t celebrate Christmas, but are enjoying other festivities. 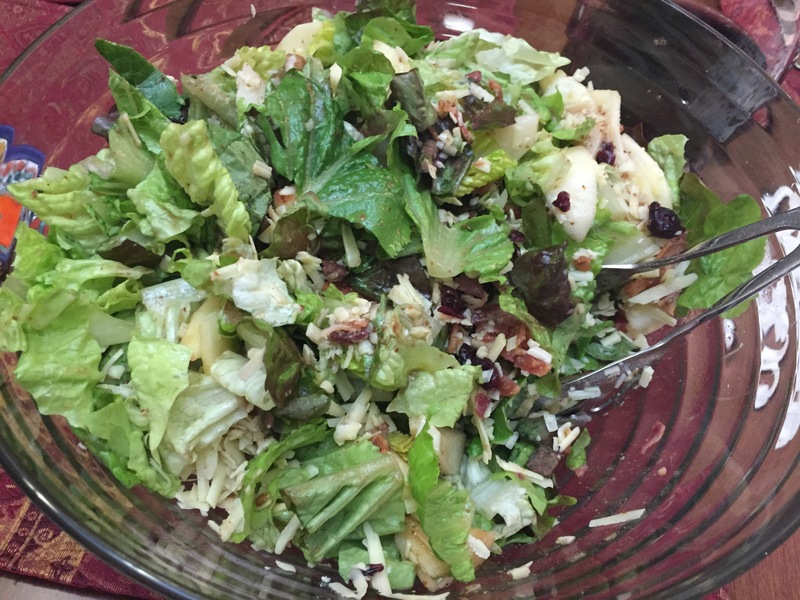 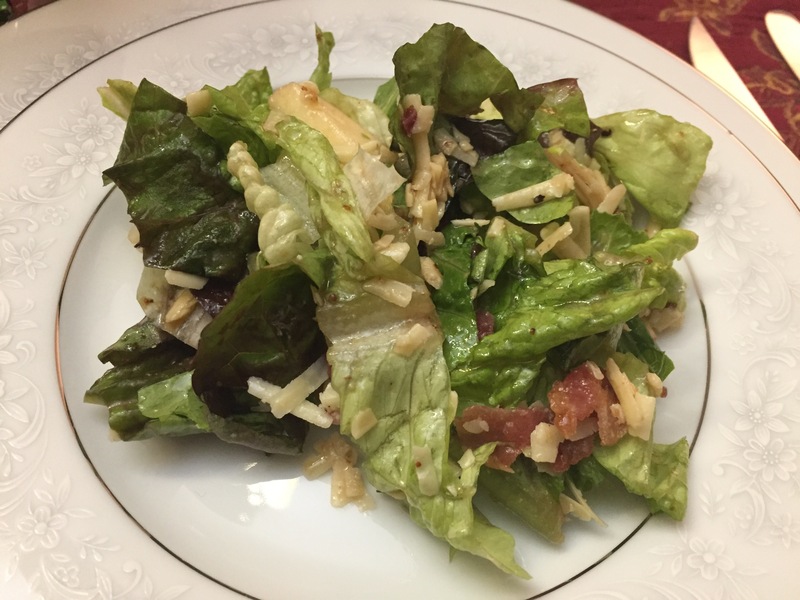 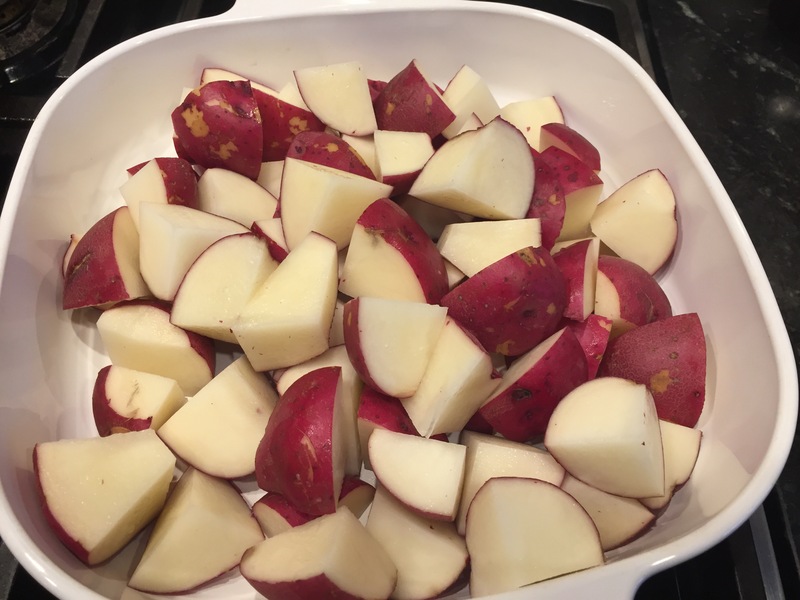 As you likely know from reading my blog, I strongly believe that all food should be good and good food is real food. 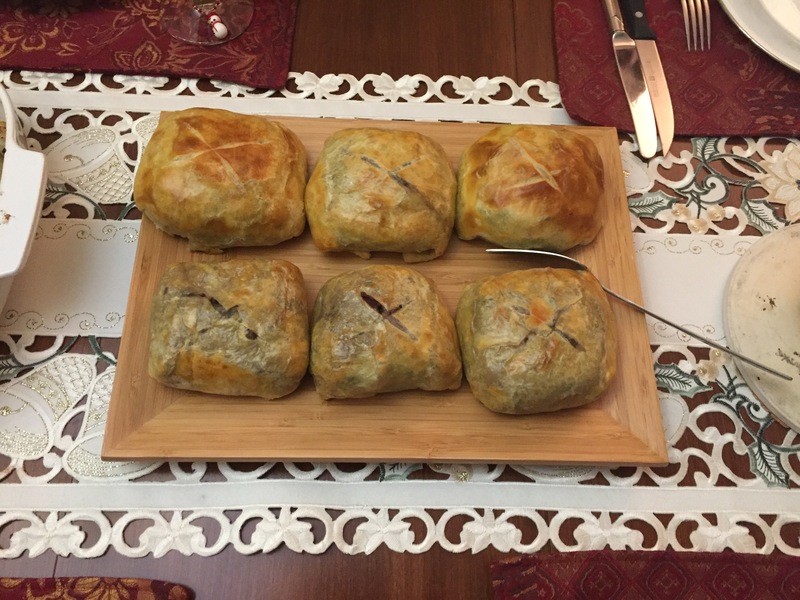 I try to hit an even higher standard for Christmas Eve dinner and this year I decided on individual Beef Wellingtons. 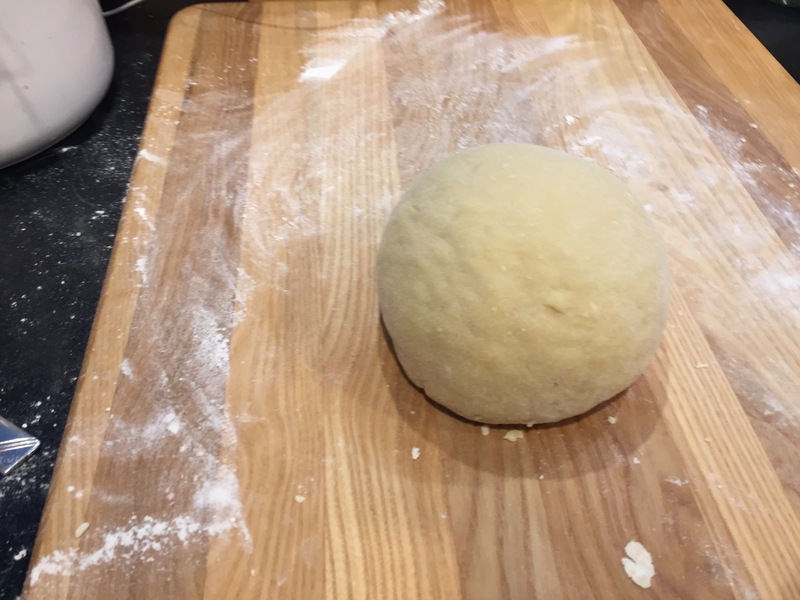 It’s not something I have made before. 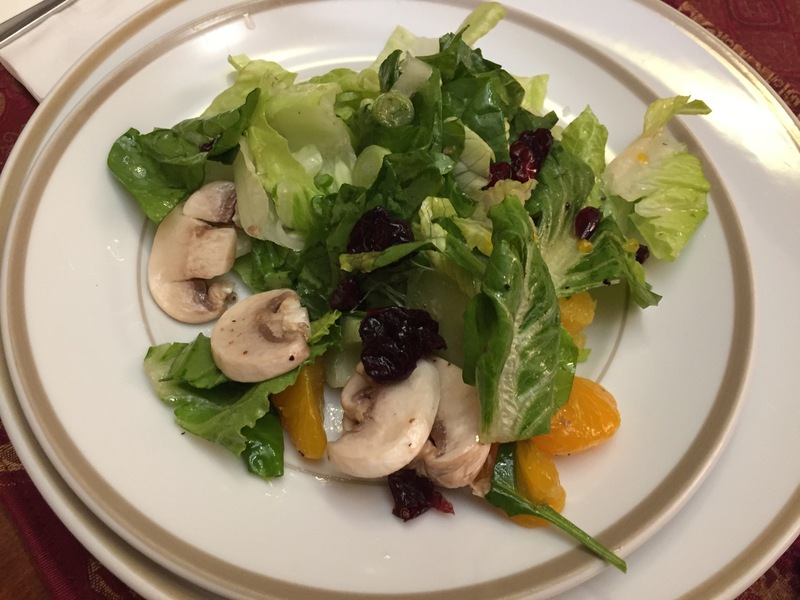 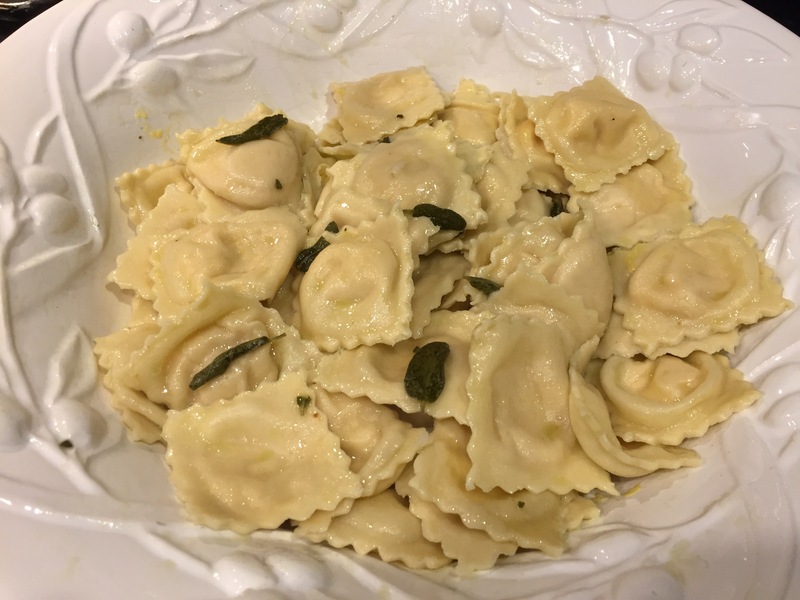 I looked at several recipes for inspiration and ended using the recipe at the bottom. 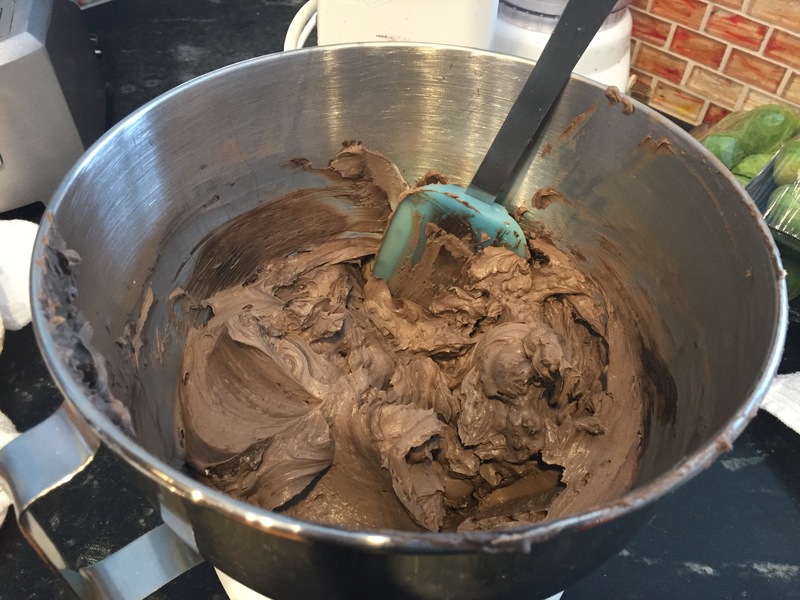 The ingredients are simple even though the taste is complex. 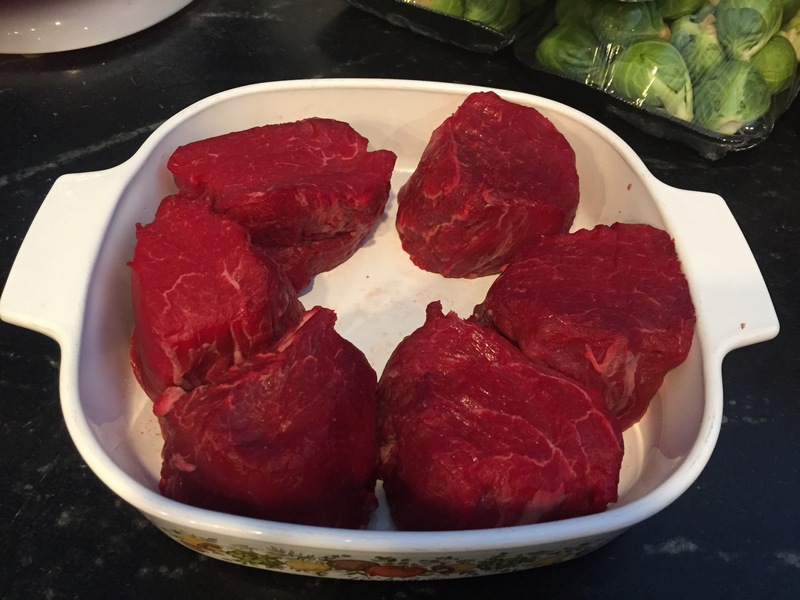 Since I wanted them to be sized as individual portions I had to start with filet mignon, which you can buy at the meat counter for $18-25/lb. 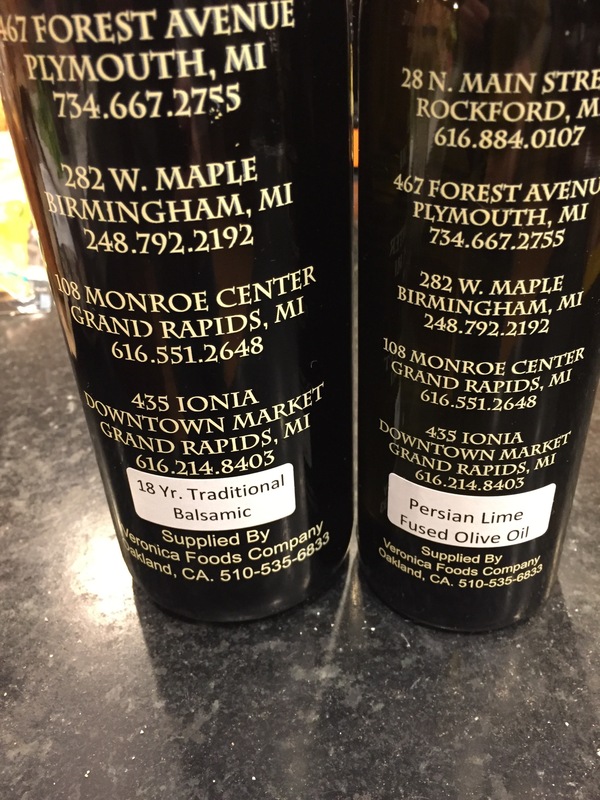 depending on the current market. 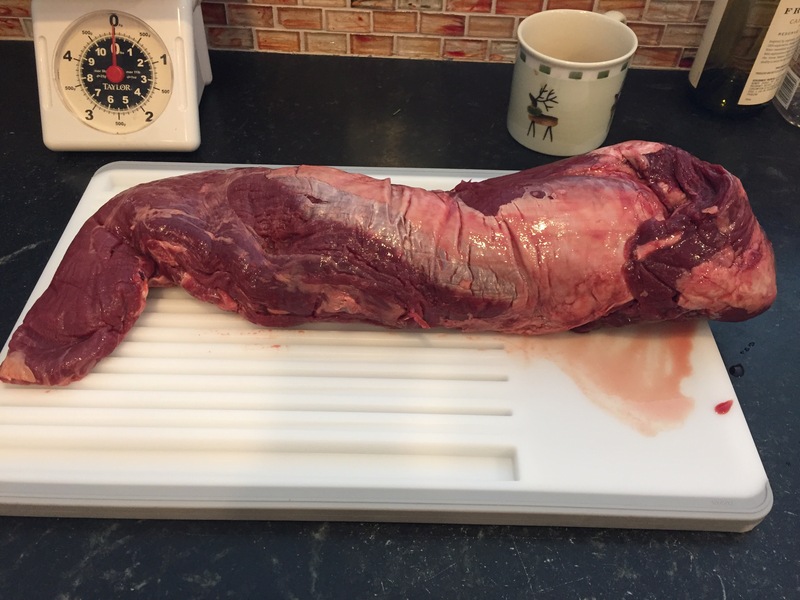 I cannot fathom this price so I start with the whole tenderloin and trim it well then cut my own steaks. 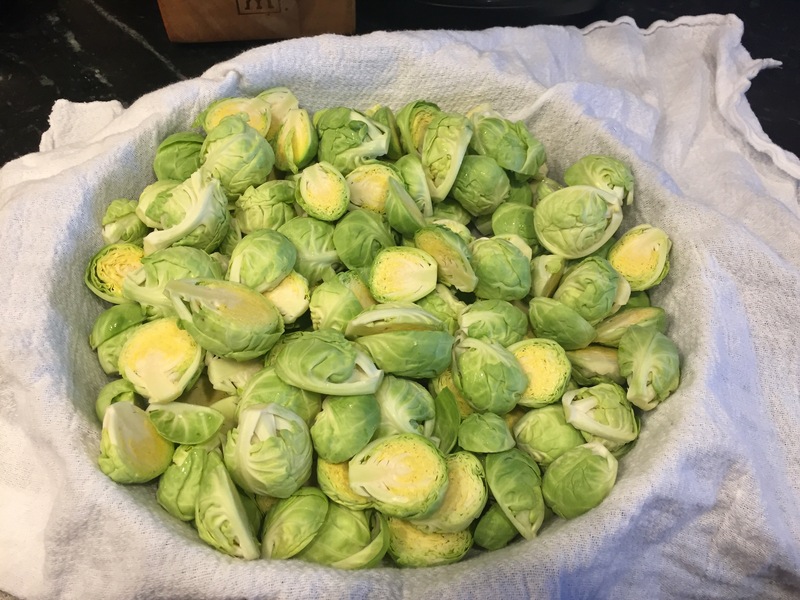 At $9/lb. 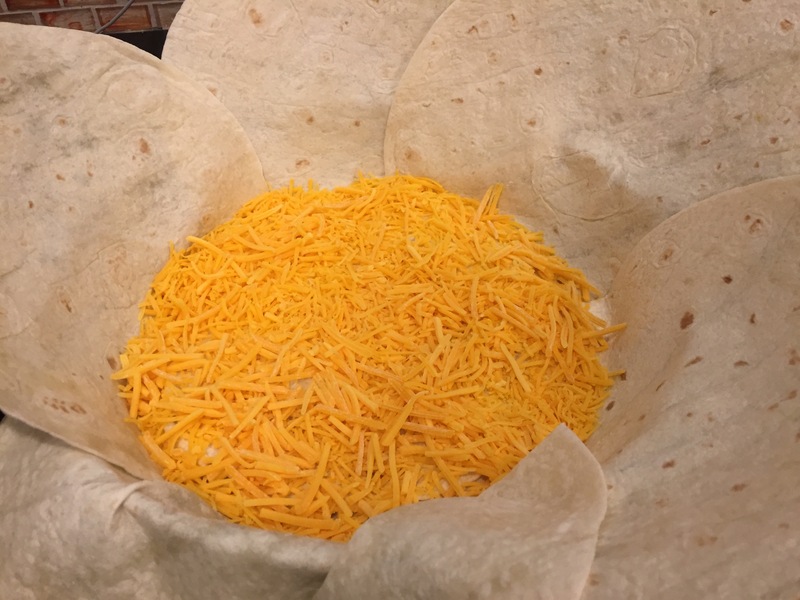 the effort is worth it. 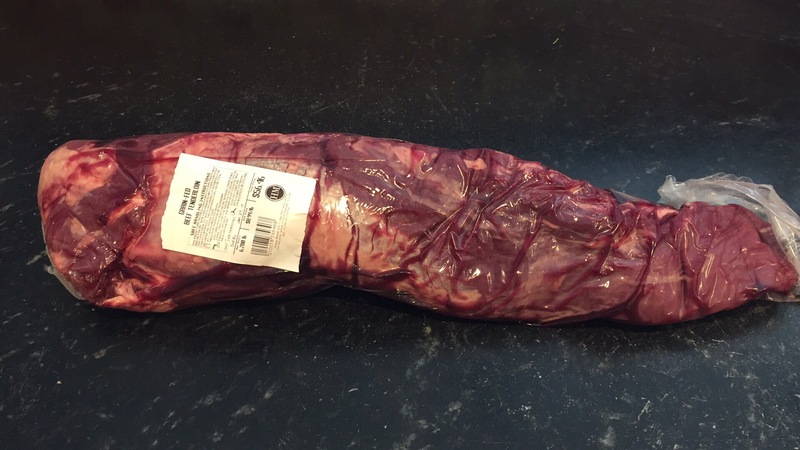 I like my steak lean, but the most important part is removing the tendon. 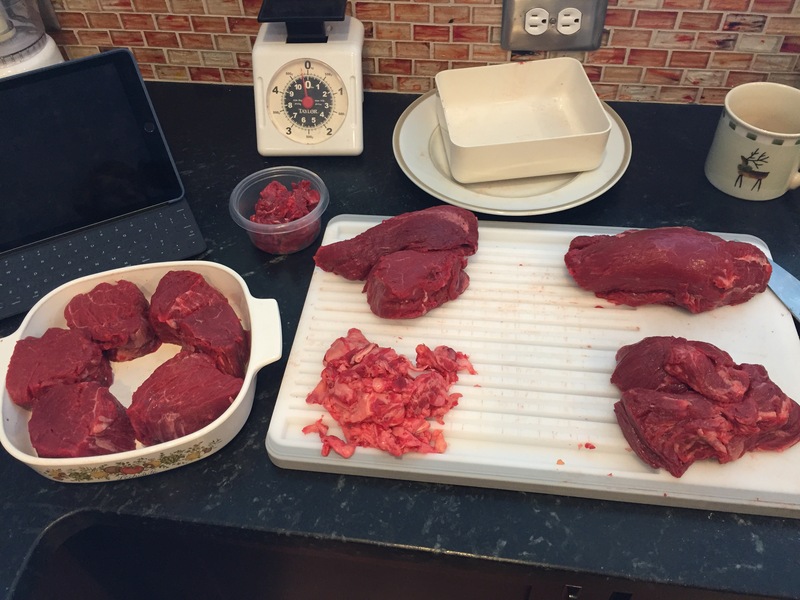 Overall, I ended up with 6 steaks (4-6 oz. 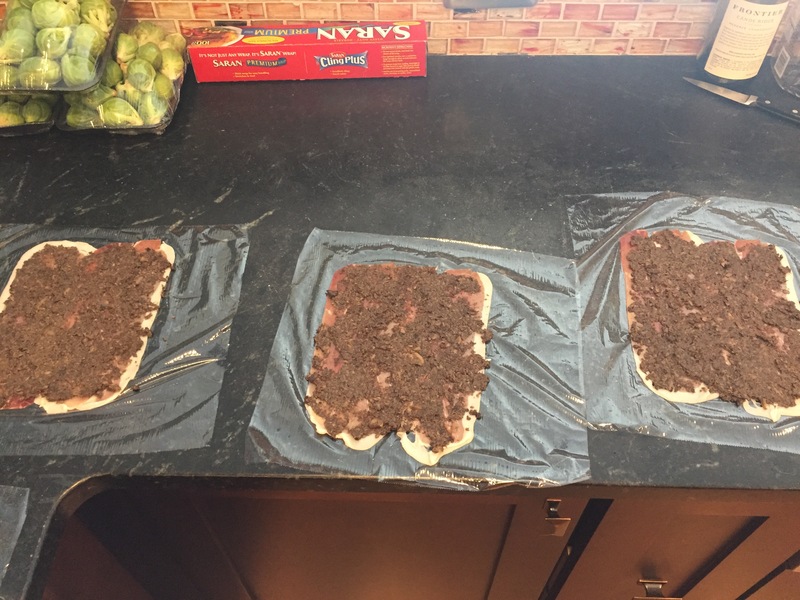 each), three bags of extra steak (1 lb. 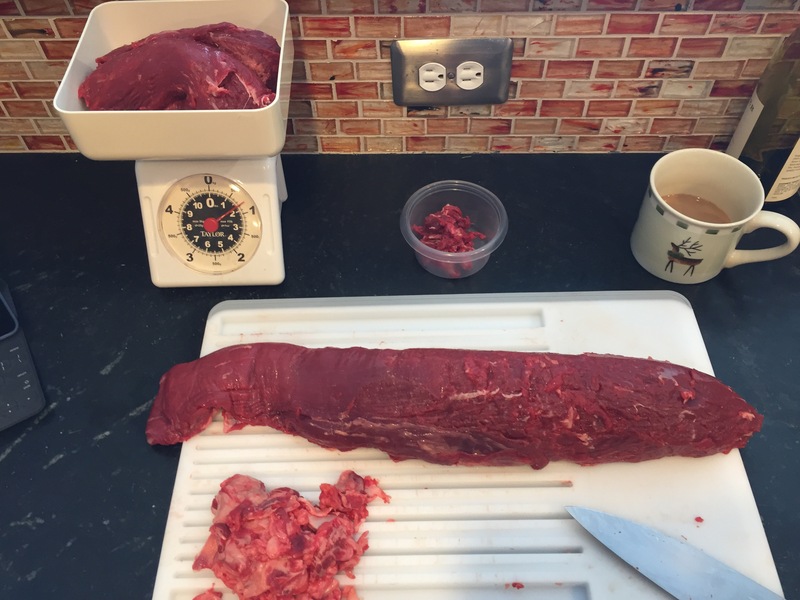 each) including a chateaubriand that can be a small roast later, and only ½ lb. 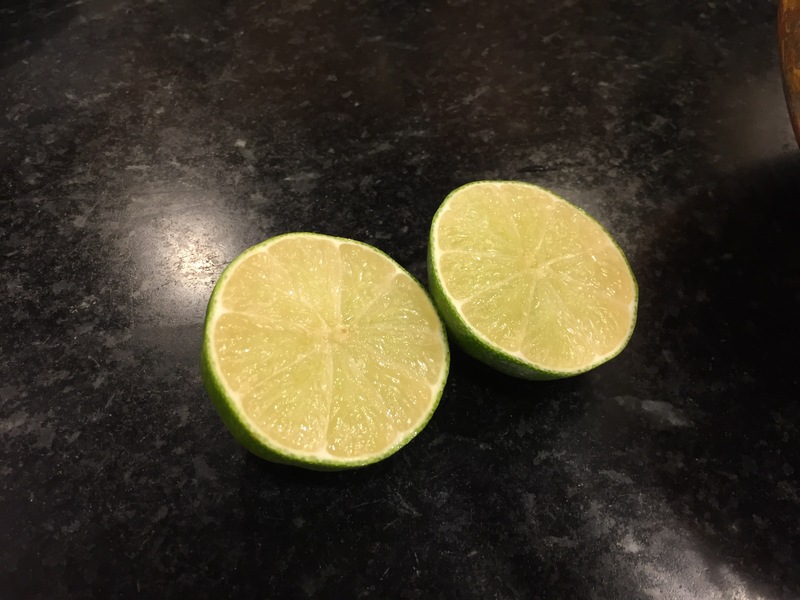 of scraps. 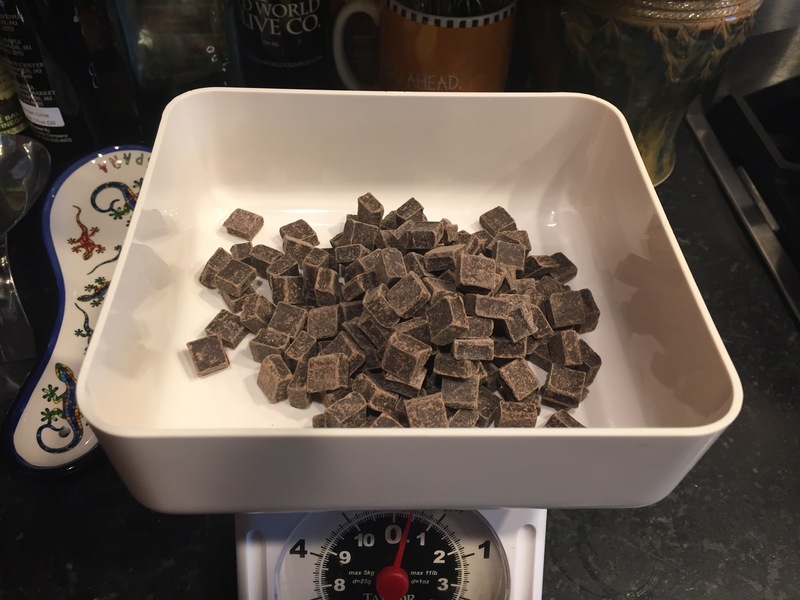 I also had ~4 oz. 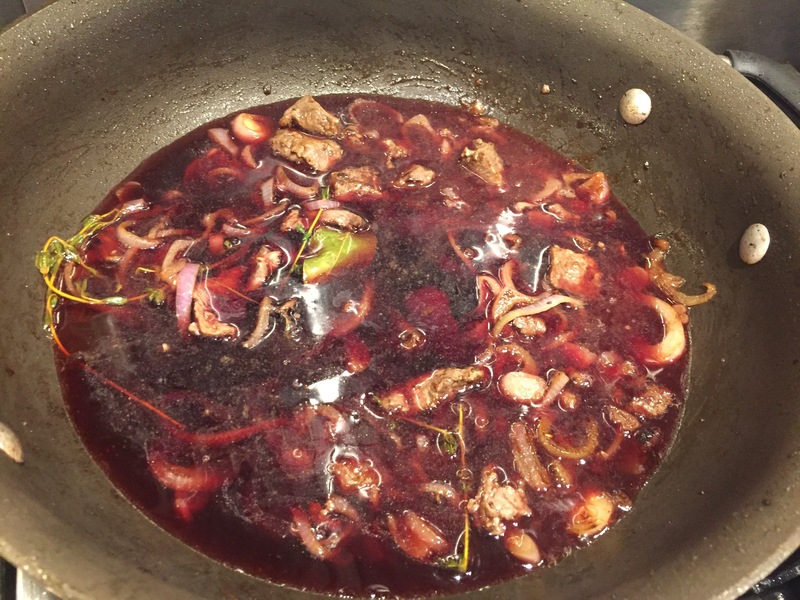 of small pieces that I used to make the red wine sauce. 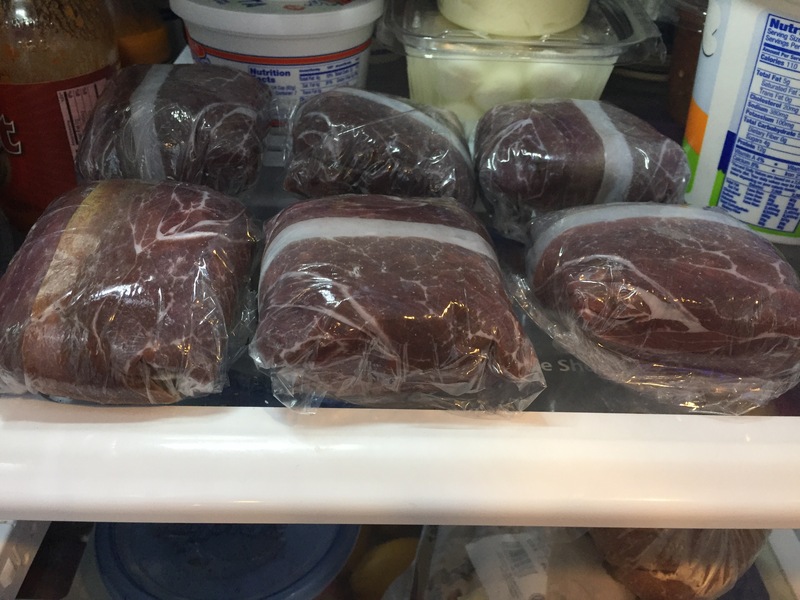 I kept the steaks in the fridge overnight; no wrap needed. 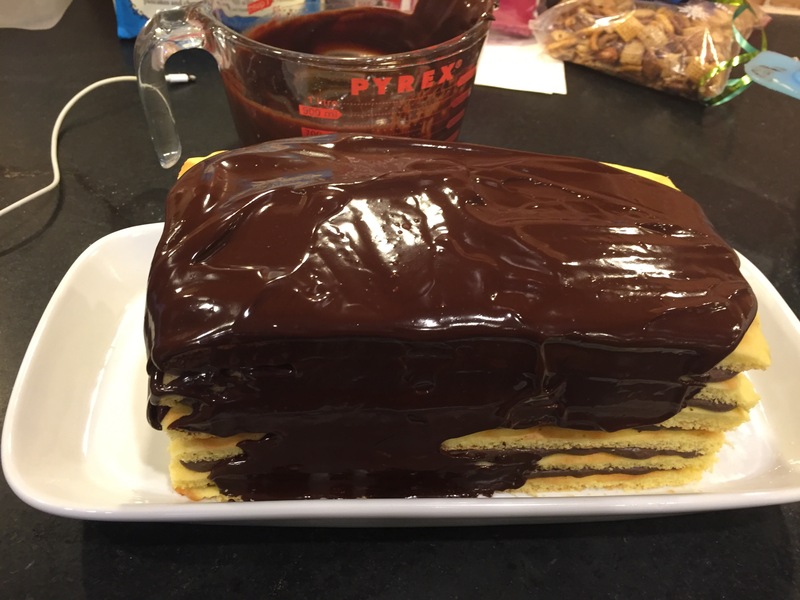 I also started dessert, a Martha Stewart recipe, on the eve of Christmas Eve by making the sponge cakes. 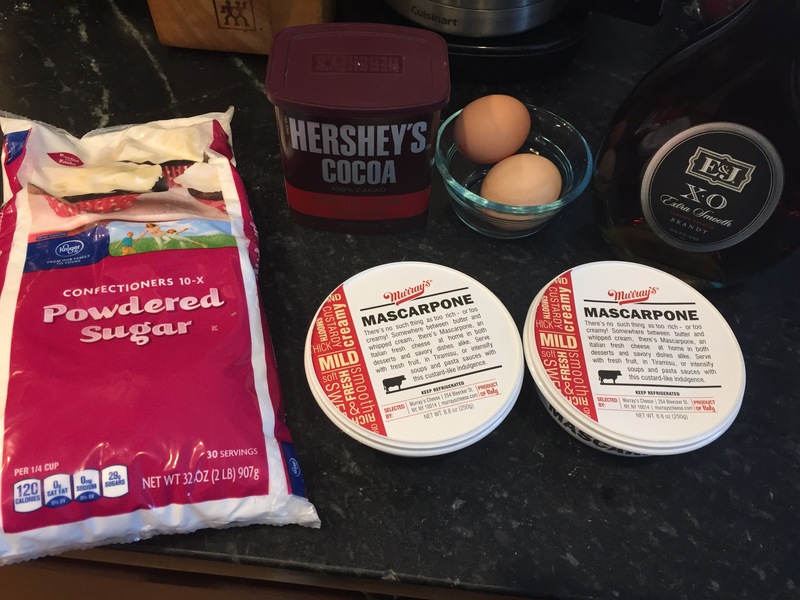 The ingredients were incredibly simple. 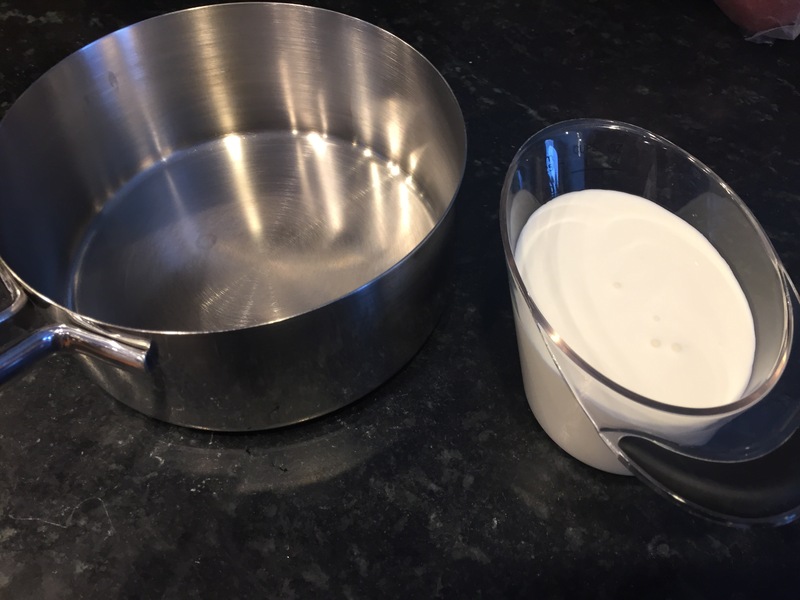 Any time you make a cake, it’s always best to prep the pans first. 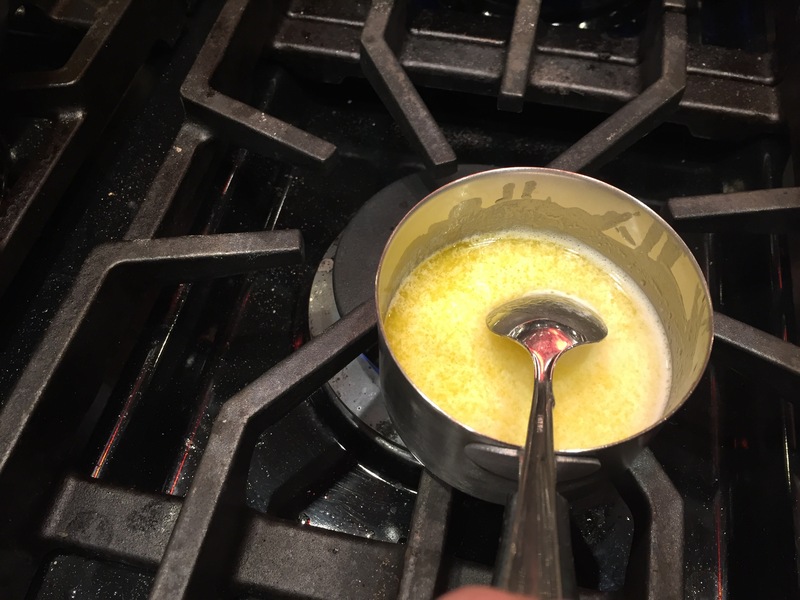 With this recipe the butter was a close second, as it needed to be melted and cooled. 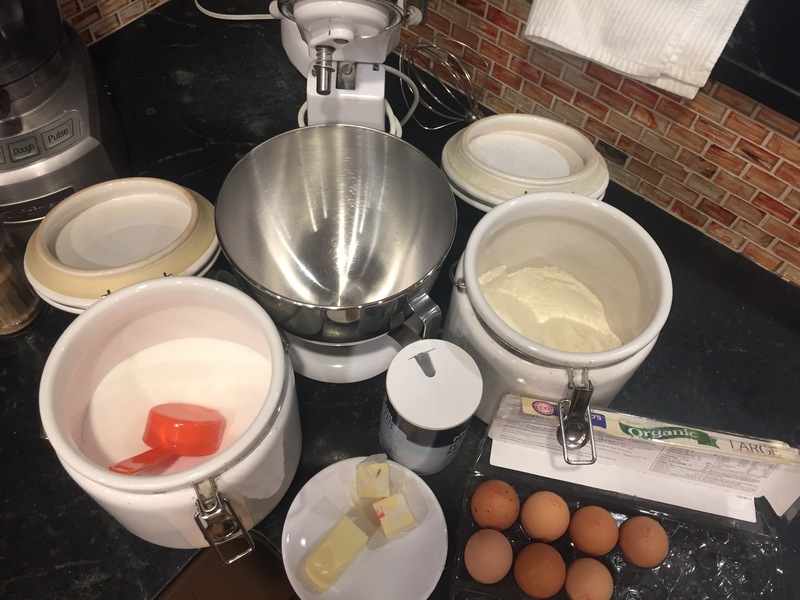 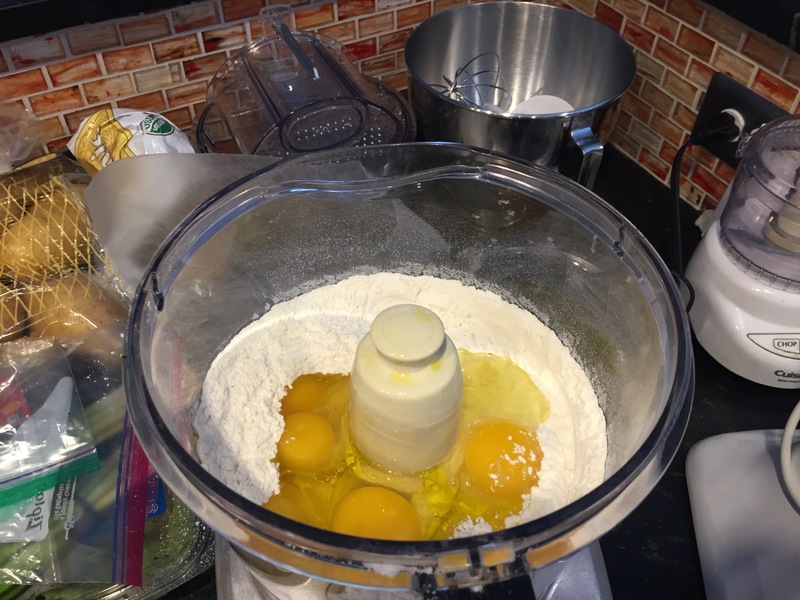 From there, I sifted my dry ingredients, and then beat the eggs and sugar. 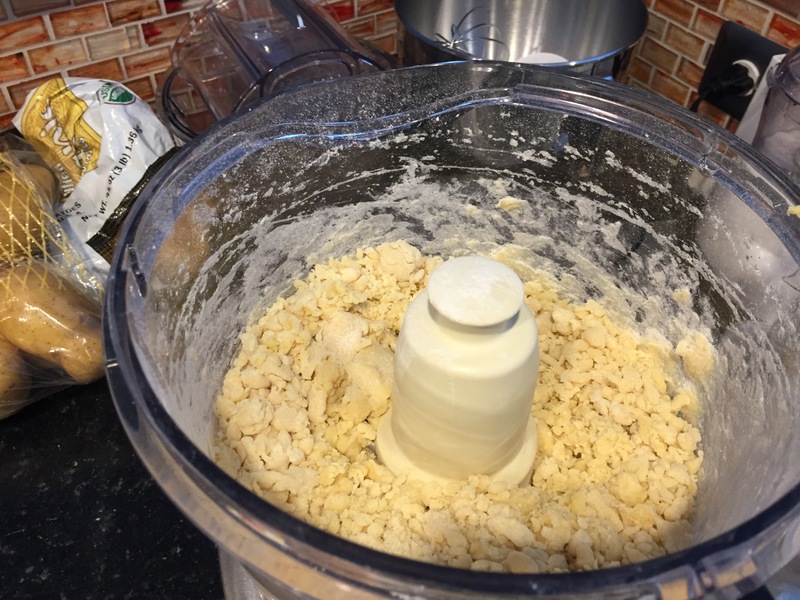 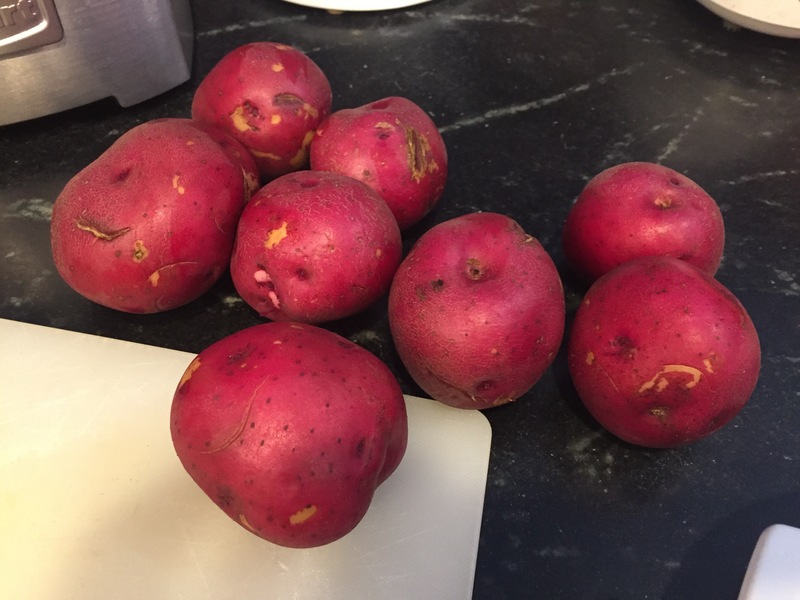 When they were very light I folded in the dry ingredients, followed by the butter. 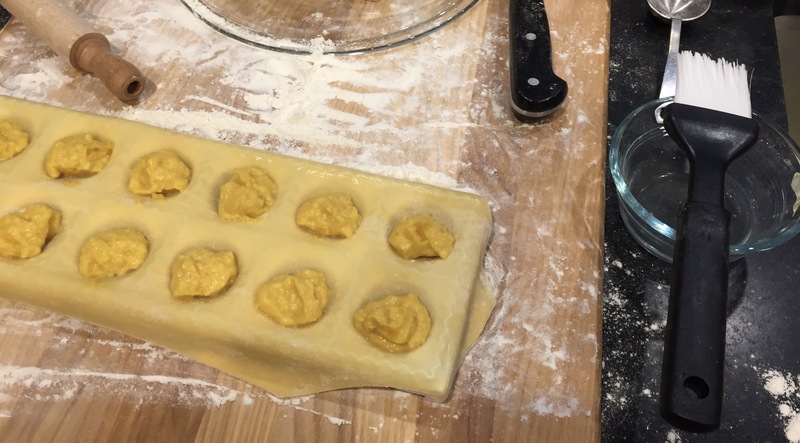 Baking them was very quick – 6 minutes. 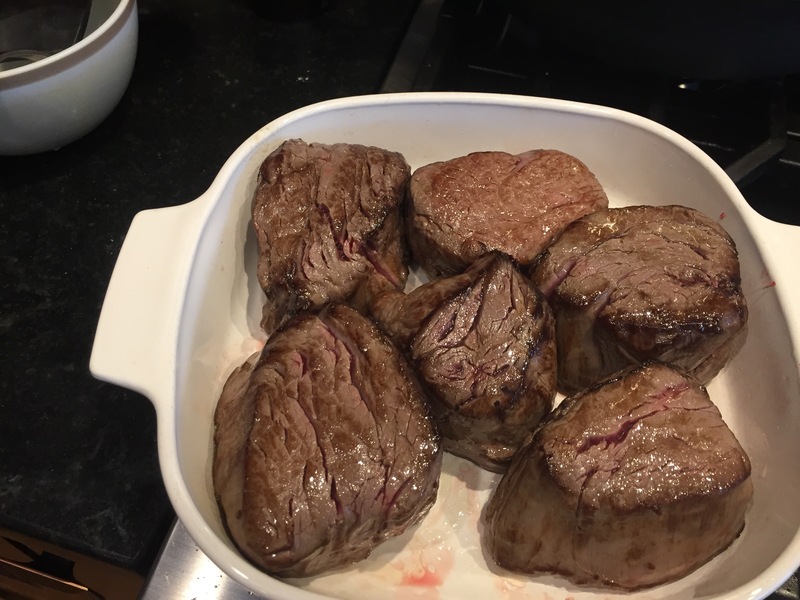 On Christmas Eve, I returned to the steaks first, very quickly searing them in batches on high heat, then they went back in the fridge. 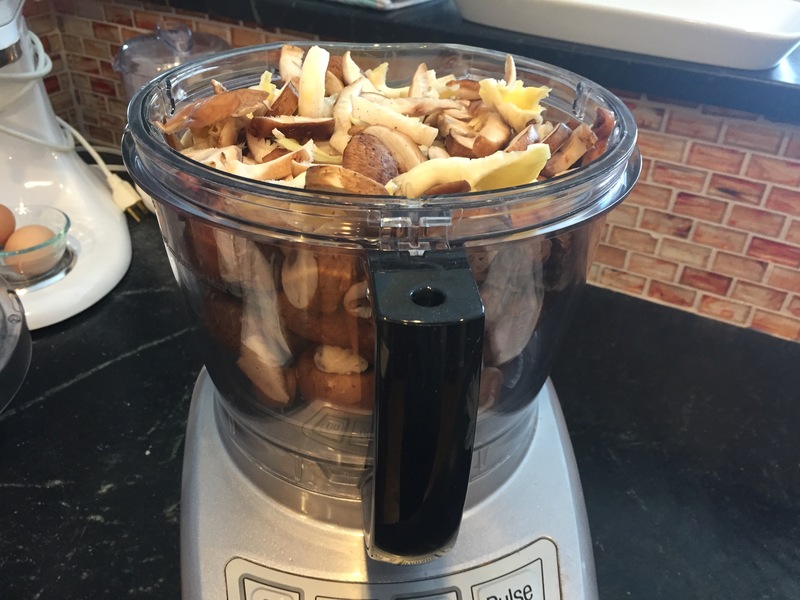 Then I washed and chopped my mushrooms, mostly baby bellas with a few wild mushrooms mixed in. 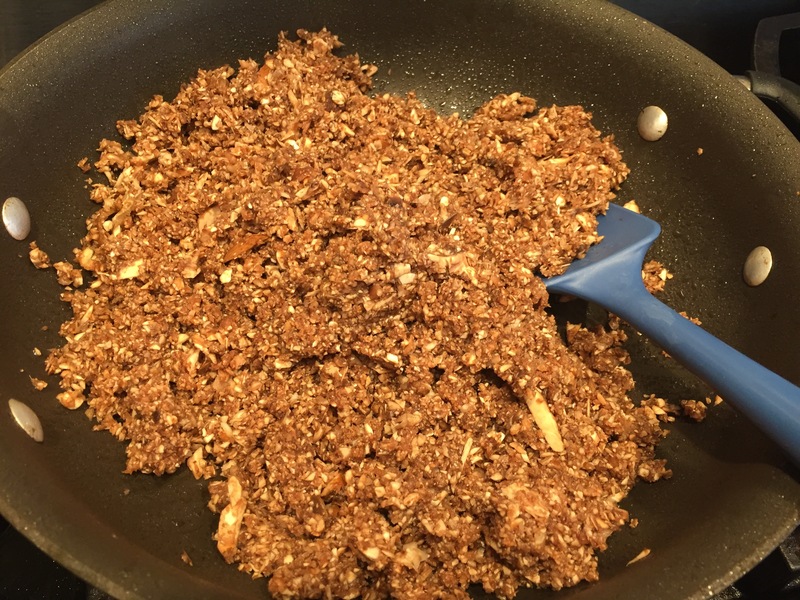 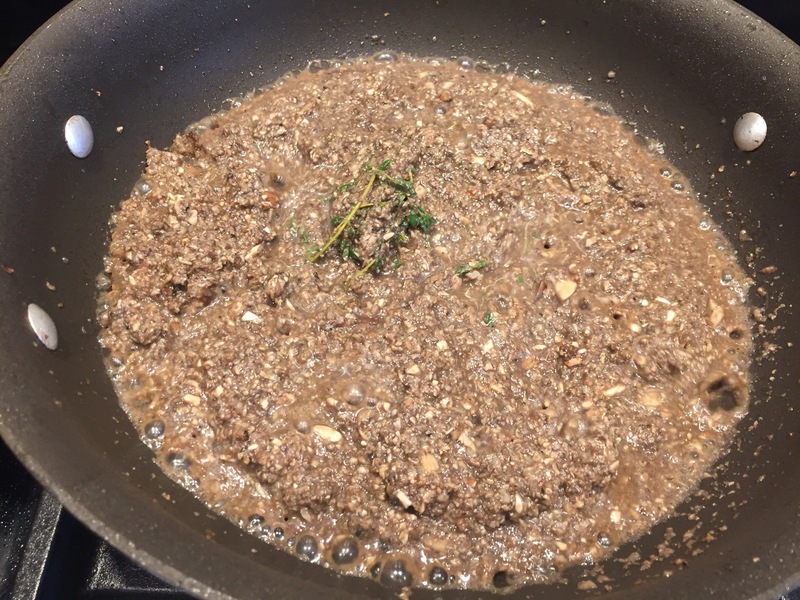 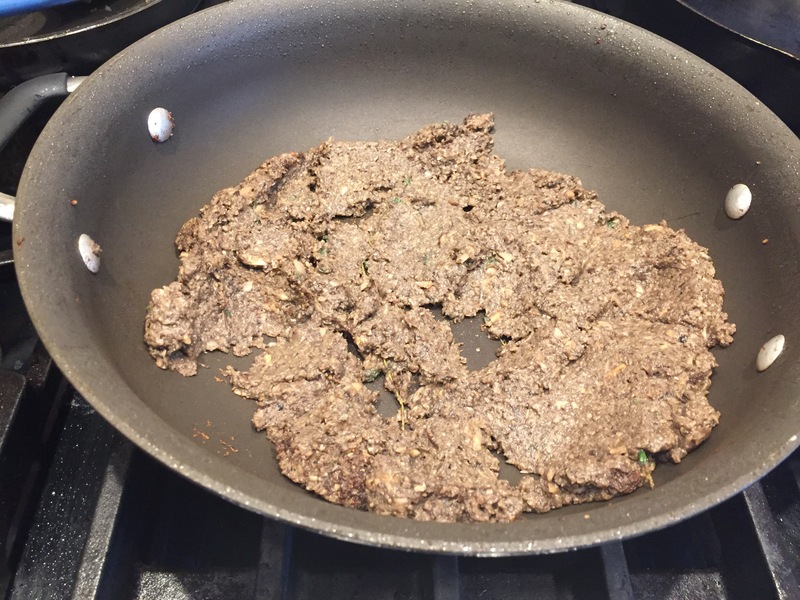 All of the mushrooms went into a large skillet with oil, a few sprigs of thyme, and a healthy helping of fresh ground pepper to make the duxelle. 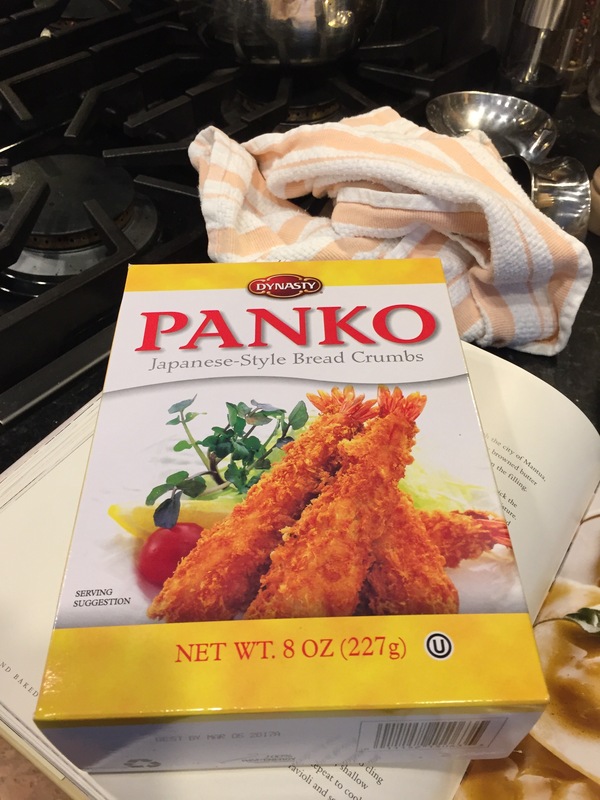 (I love new words!) 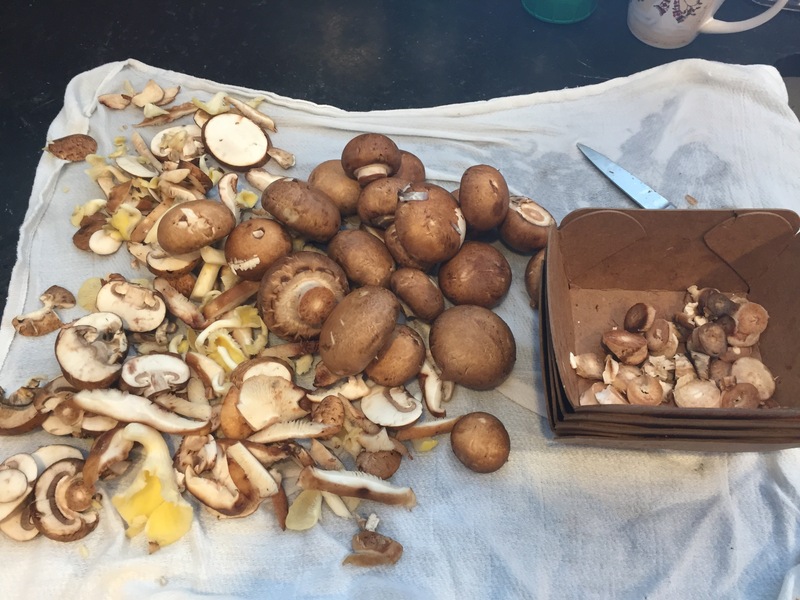 After a few minutes they release their moisture then dry and begin to brown. 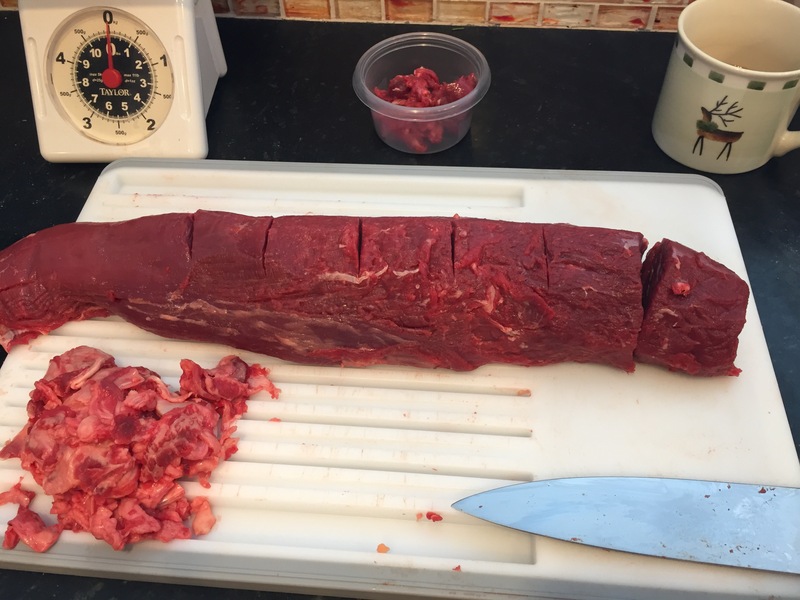 The next step of the beef was to set their shape. 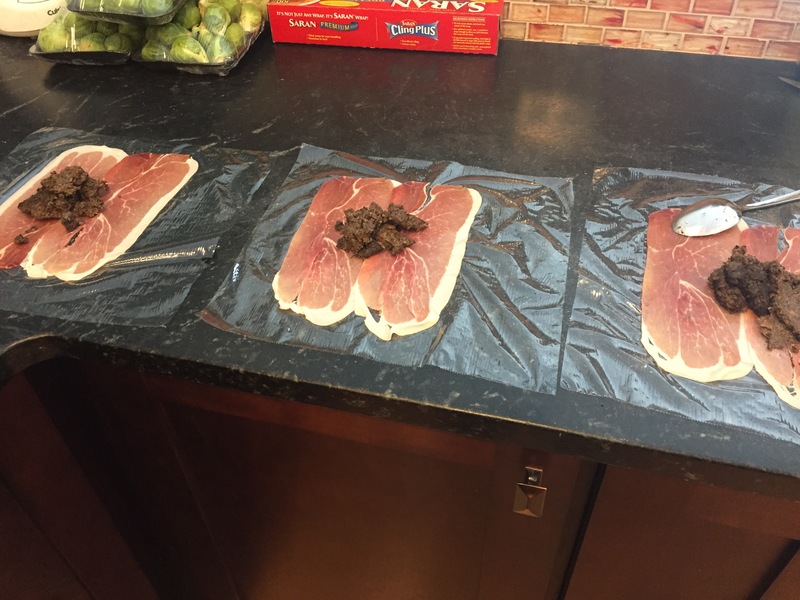 I laid out 6 pieces of Saran Wrap, each with 2 slices of Prosciutto, and then spread the Prosciutto with the duxelle, evenly divided. 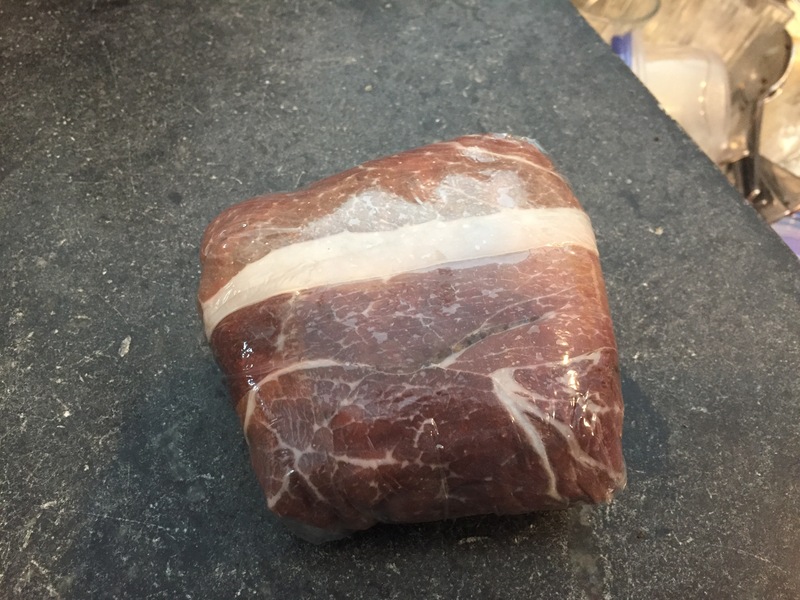 After seasoning the beef with salt and pepper I placed each one on a piece of Saran Wrap and folded, then tightly sealed them, and then returned them to the fridge. 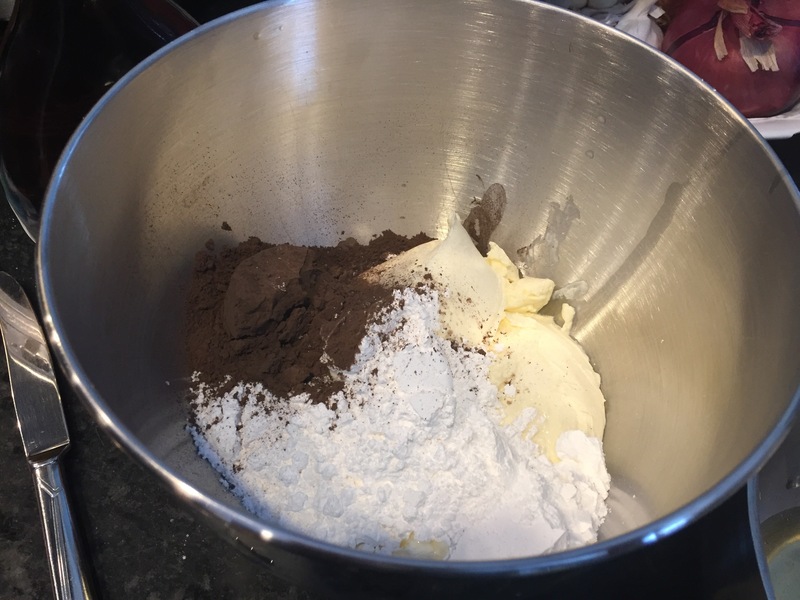 I returned to the cake by making the filling, again an easy set of ingredients. 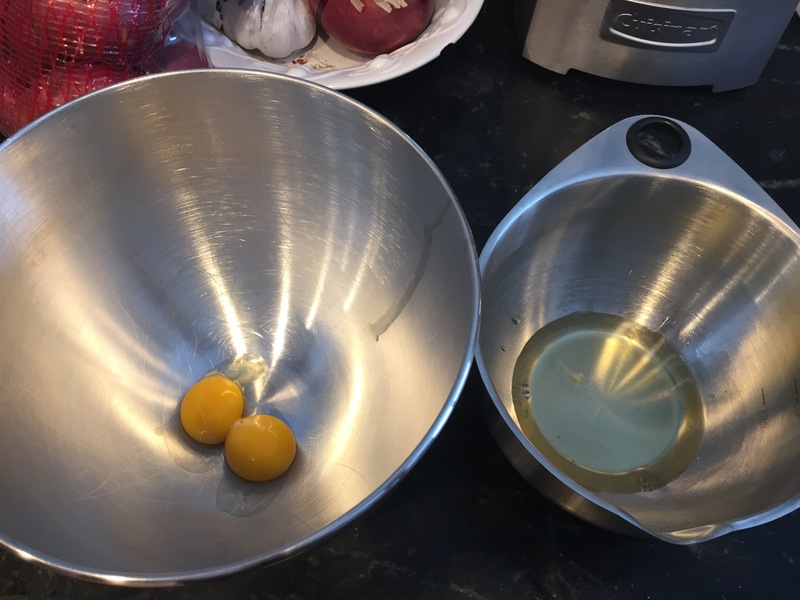 I started by separating my eggs. 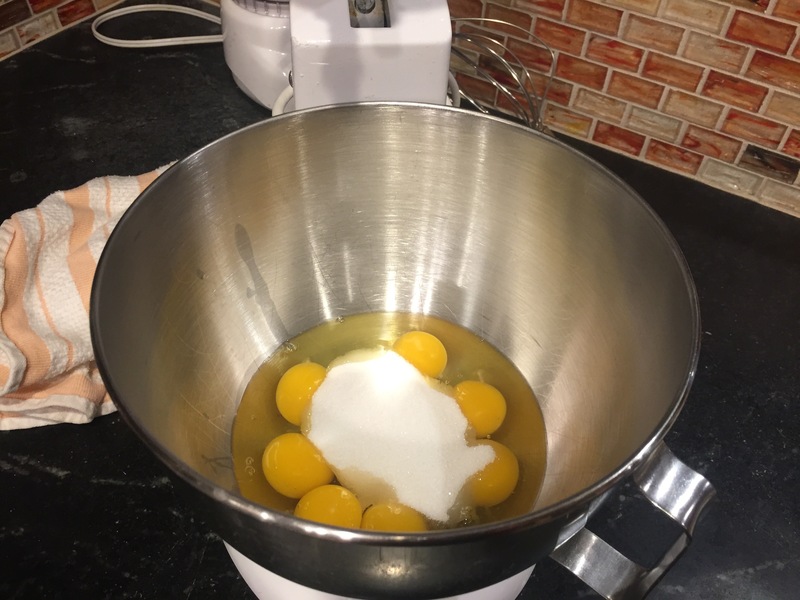 The mascarpone, powdered sugar, cocoa, and salt go right on top of the yolks, and then the mix is beaten until thick and creamy. 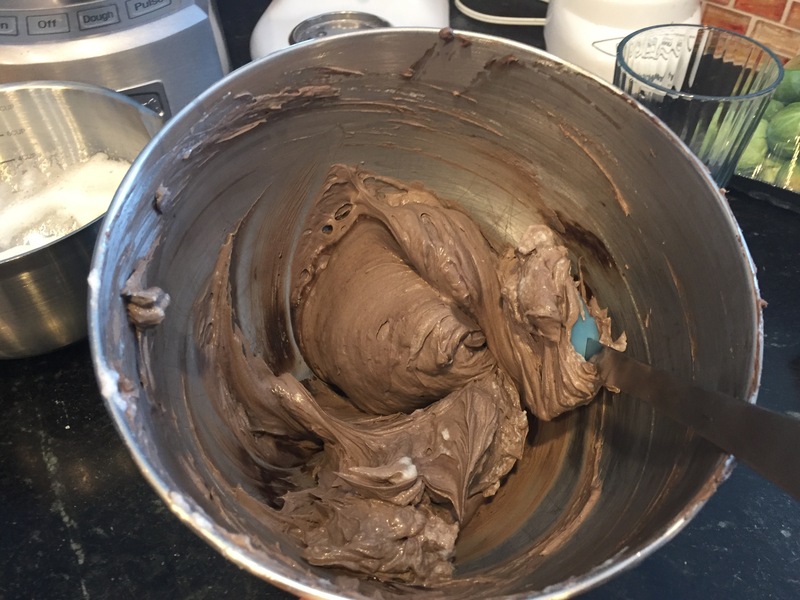 The egg whites are whipped with a dash of salt and then folded into the chocolate mix. 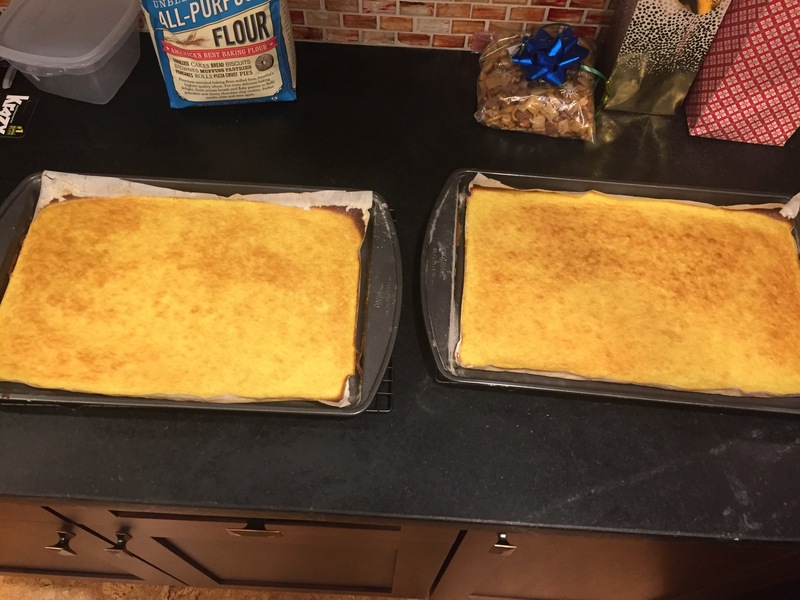 Each of the two cakes are cut into 3 equally sized rectangles. 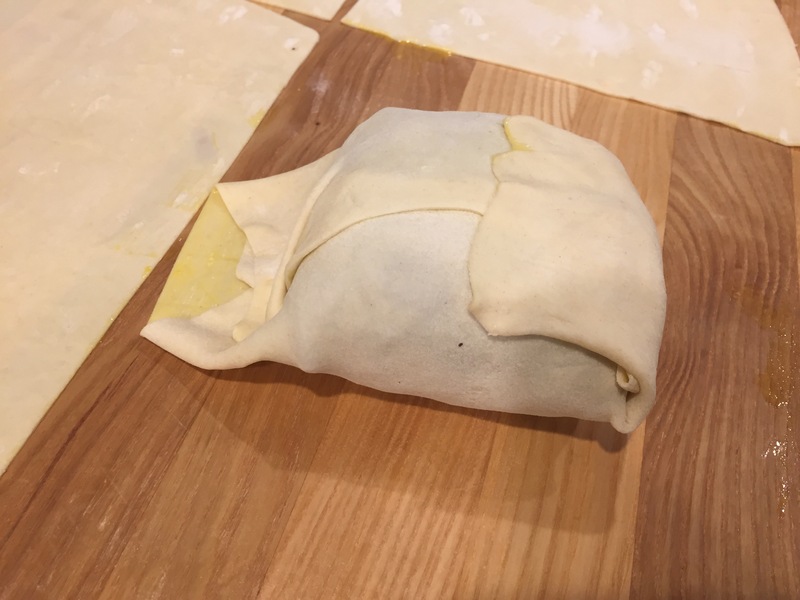 Place one on your serving tray and brush it with brandy and spread about a cup of the filling evenly over it. 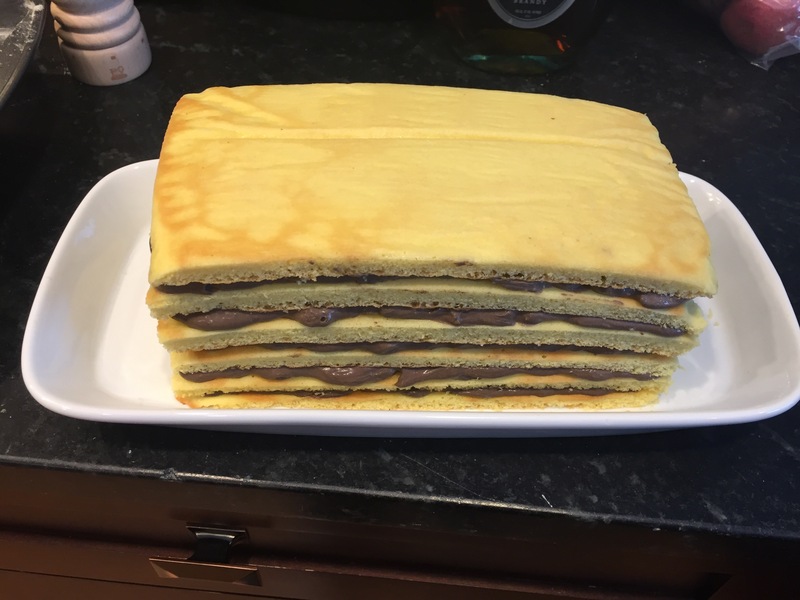 Continue in this manner until you reach the top layer, ending with a brandy-brushed cake layer. 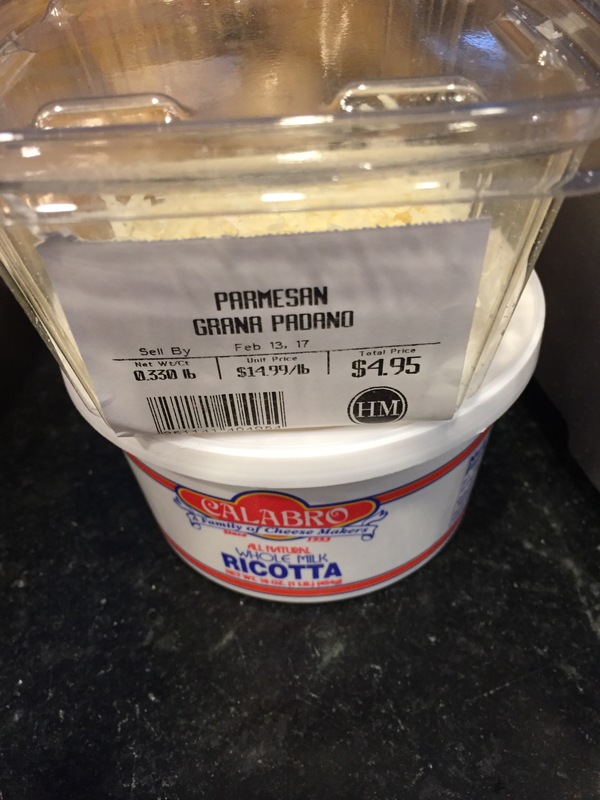 This goes into the fridge too. 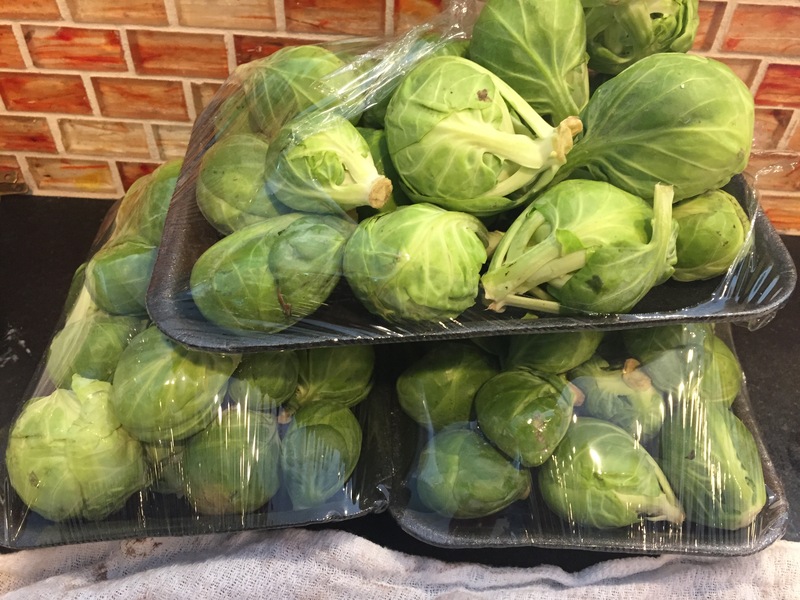 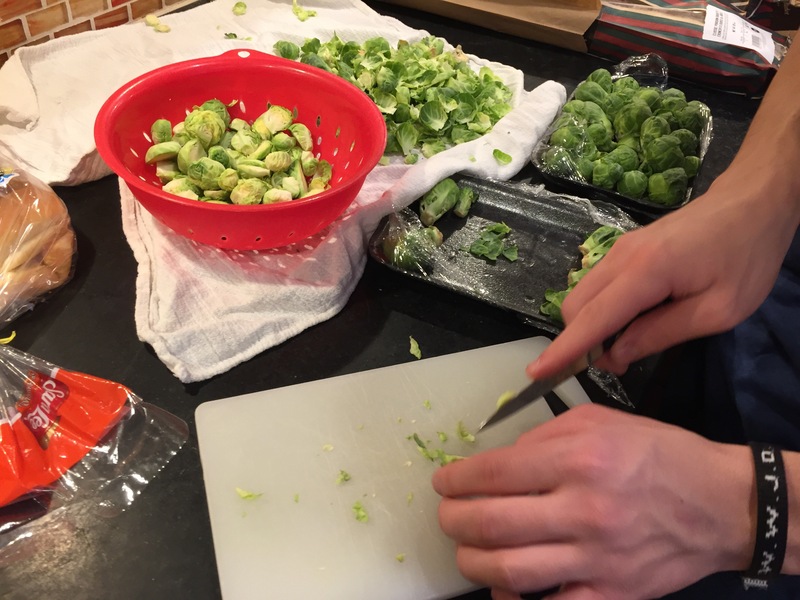 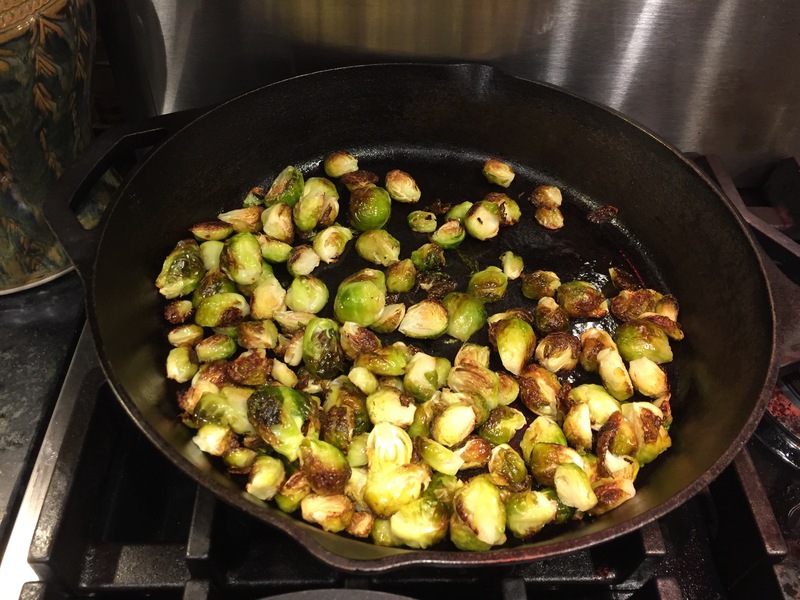 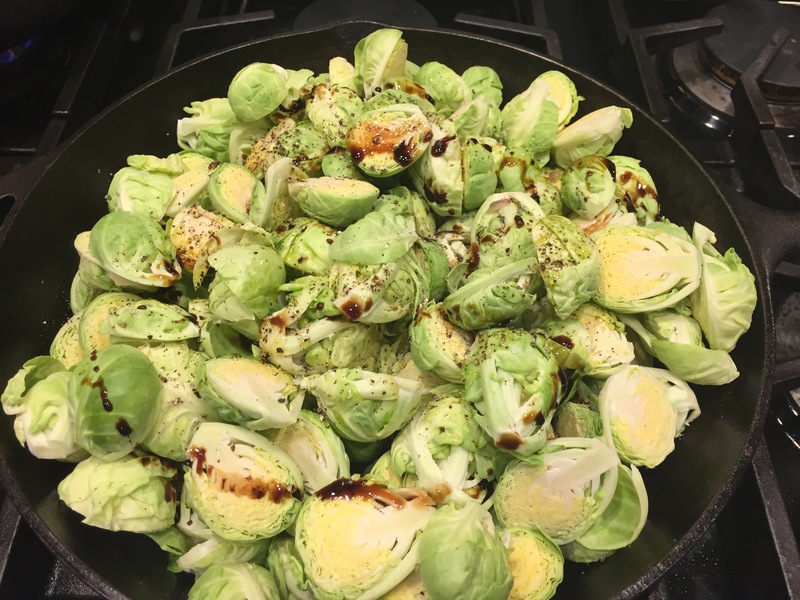 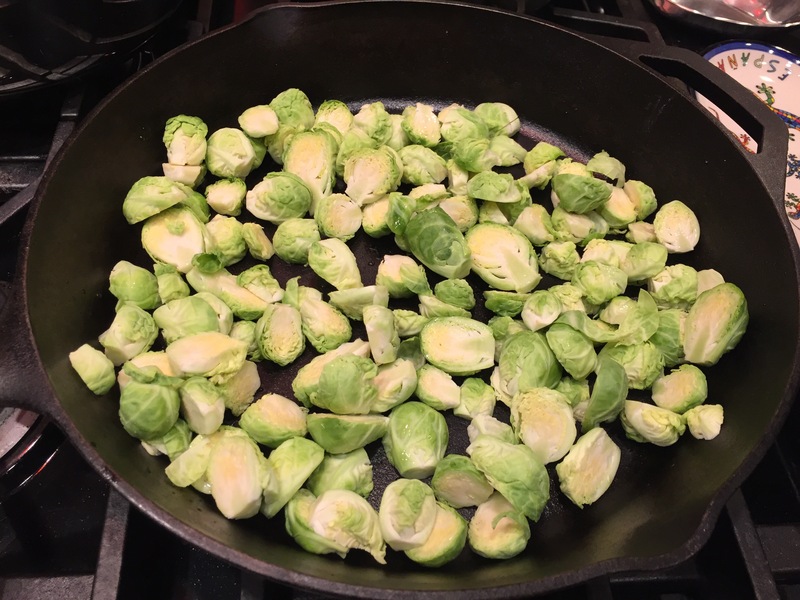 I have prepared brussel sprouts fairly frequently lately so I won’t bore you with the details. 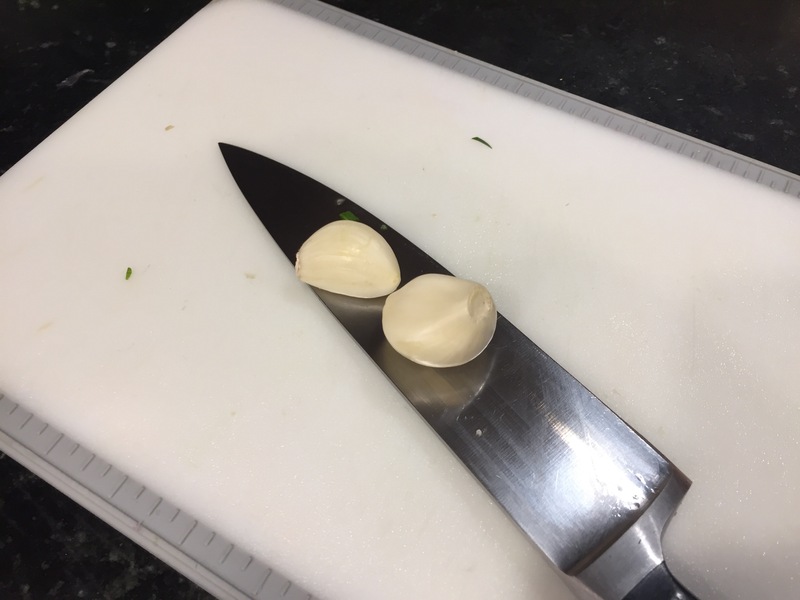 At this point I was simply cleaning them. 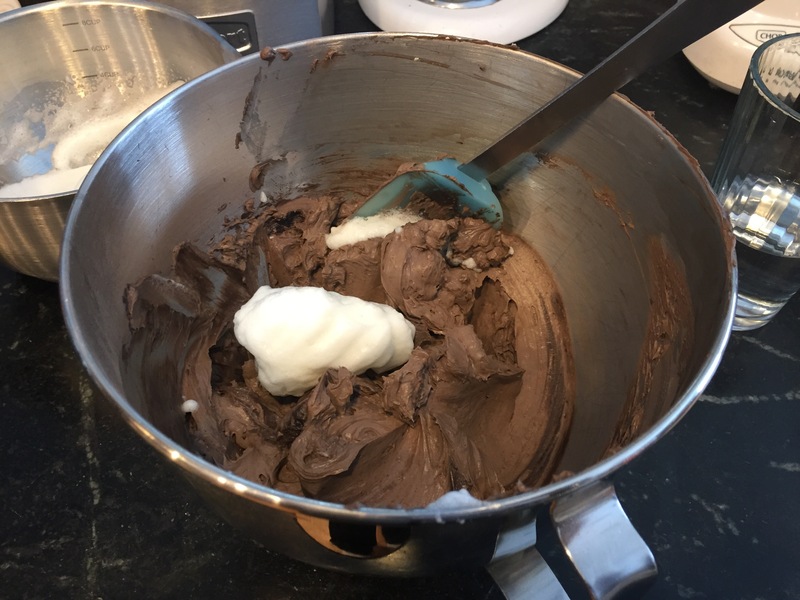 And then I made the glaze for the cake: chocolate and hot cream. 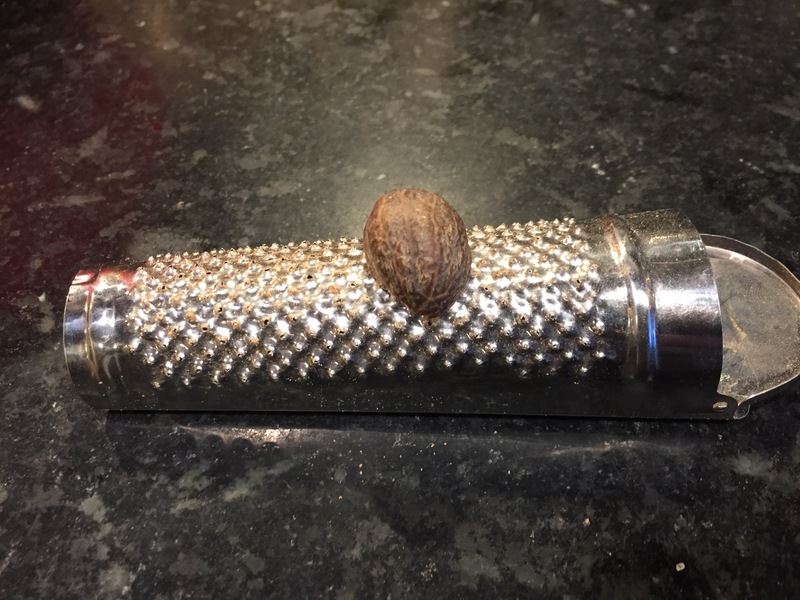 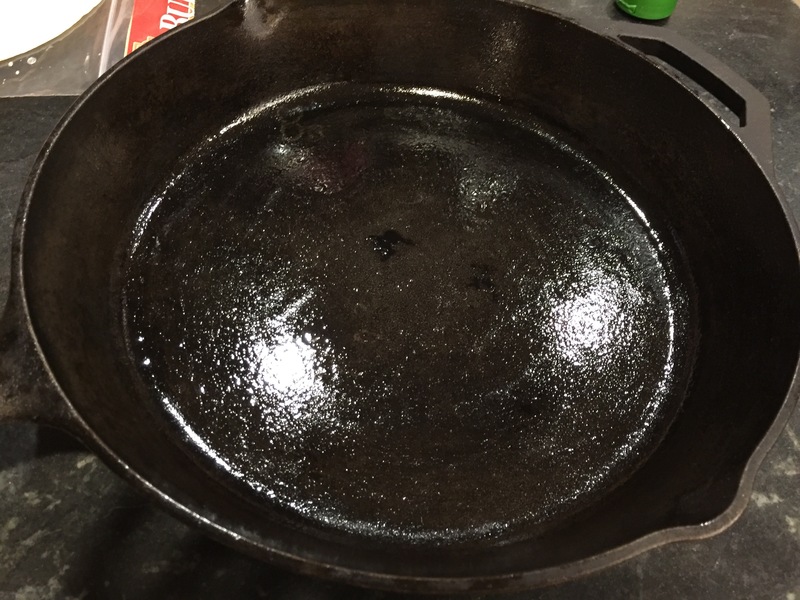 I also cleaned and seasoned my redskins while the chocolate melted. 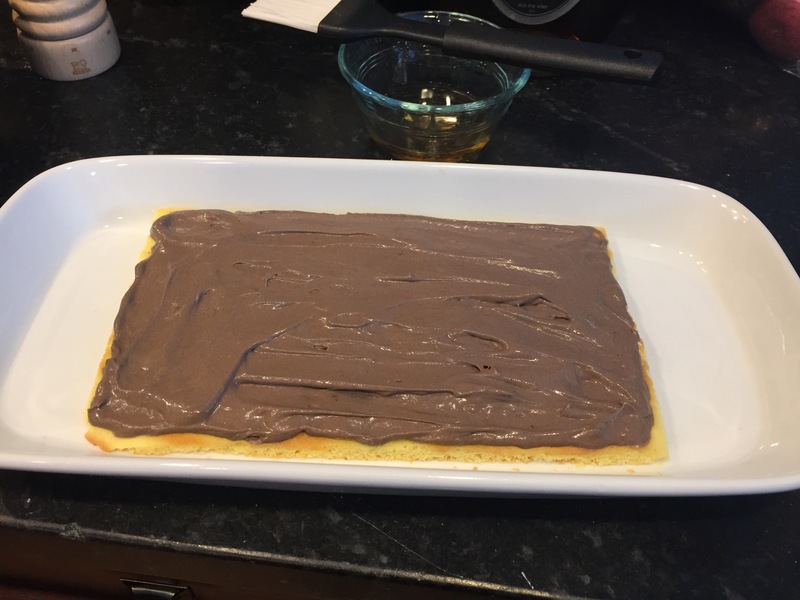 Once the chocolate was melted, I whisked it to smooth and then glazed the cake. 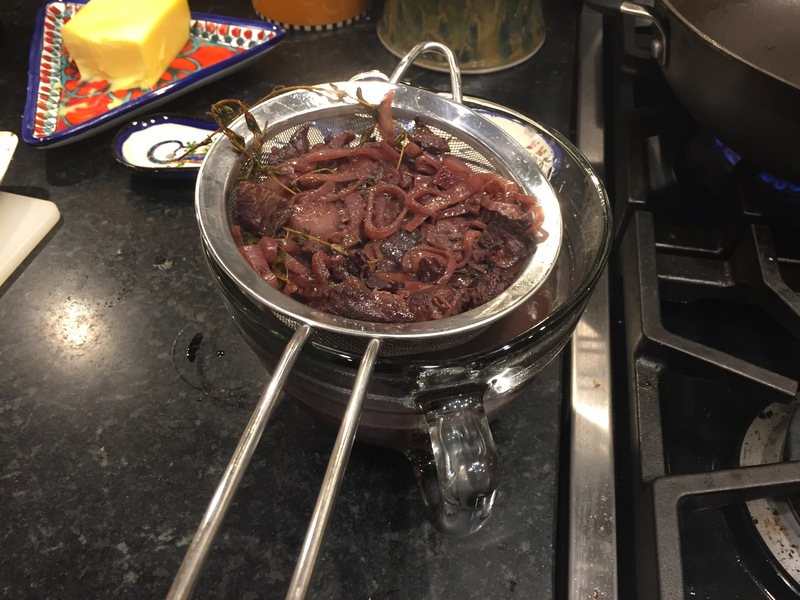 About an hour before I wanted to serve dinner, I put the potatoes in the oven and started the red wine sauce (aka, gravy) I used the trimmings I mentioned earlier, a few more sprigs of thyme, a bay leaf, several peppercorns, and 3 sliced shallots. 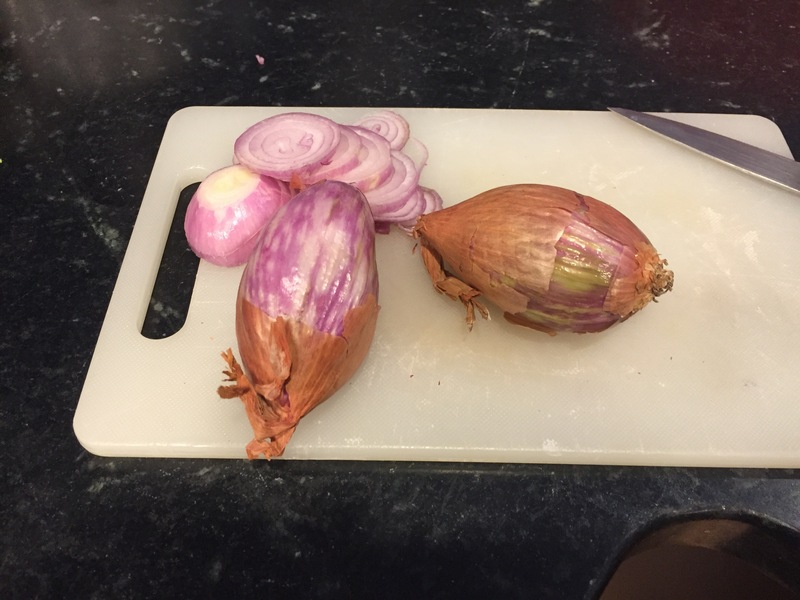 When the shallots were golden I added in a splash of red wine vinegar, let it reduce to almost dry and then add 2 cups of wine. 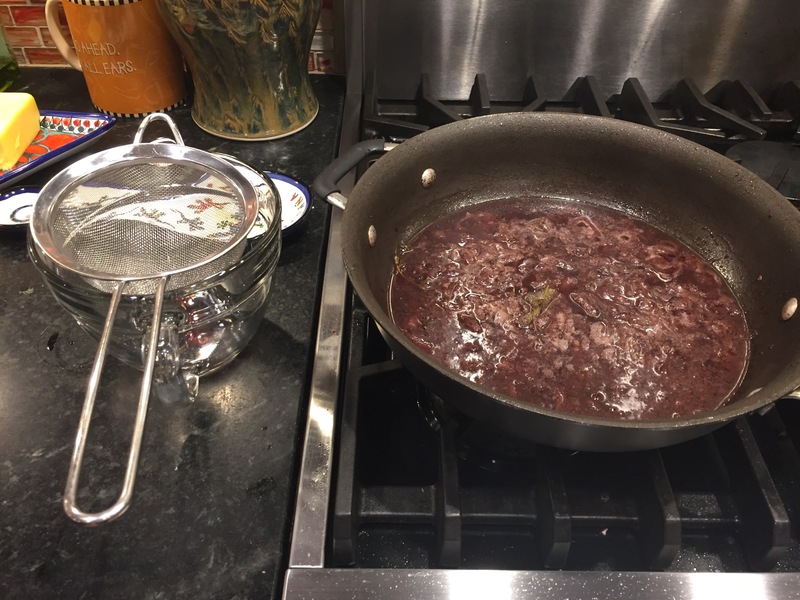 I brought the wine to a boil and then simmered it until it was reduced to about ½ cup. 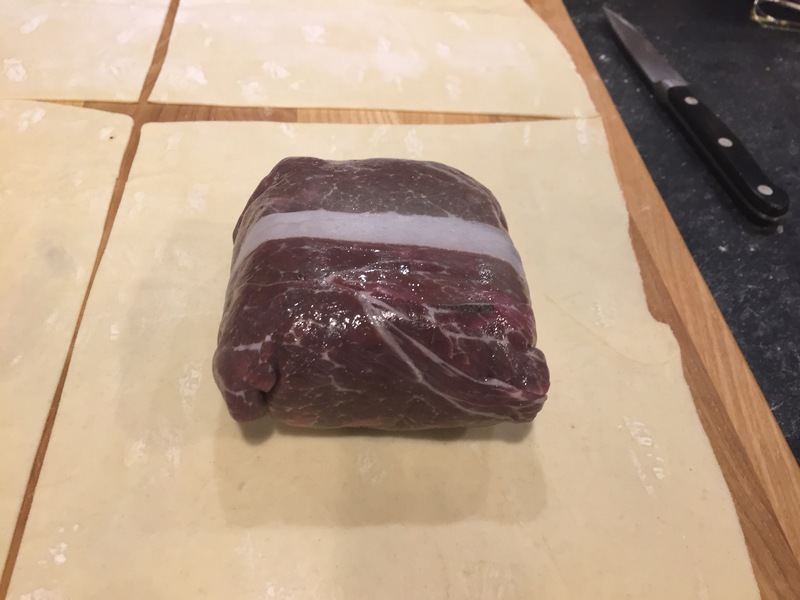 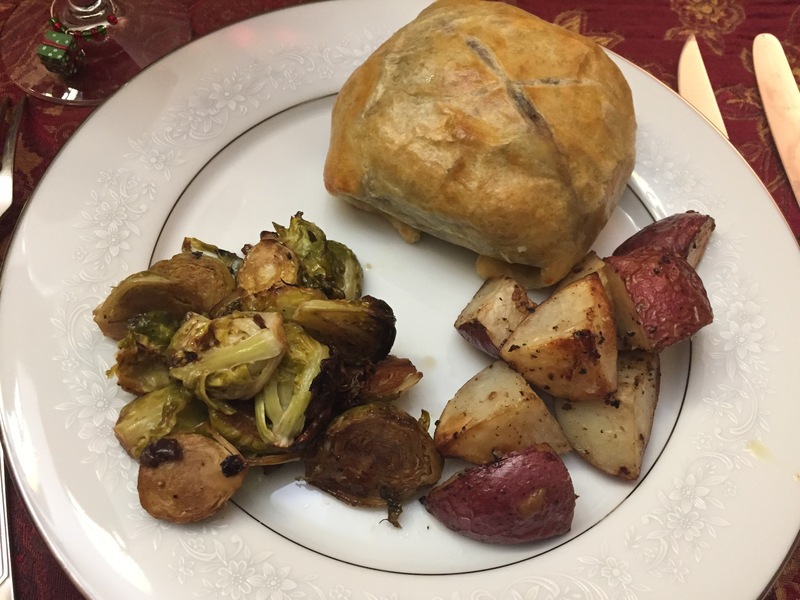 Then I wrapped my beef in puff pastry, I recommend an 8-9″ square per filet, and only 2 per sheet – yes you will have some scrap, but they won’t be too thin at the end. 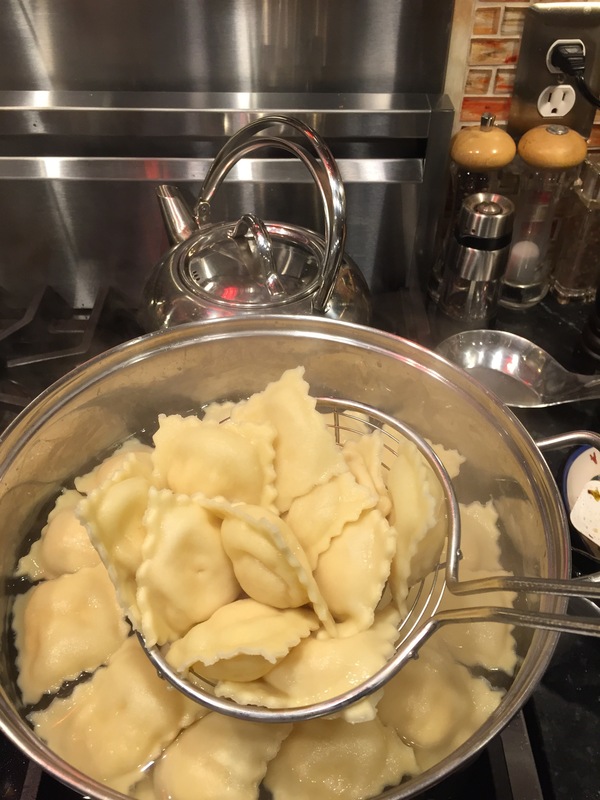 I brushed the edges and the tops with an egg wash.
At this point (about 30 minutes before dinner) the wine was reduced and I added in the broth to reduce again, ultimately to about 1 cup. 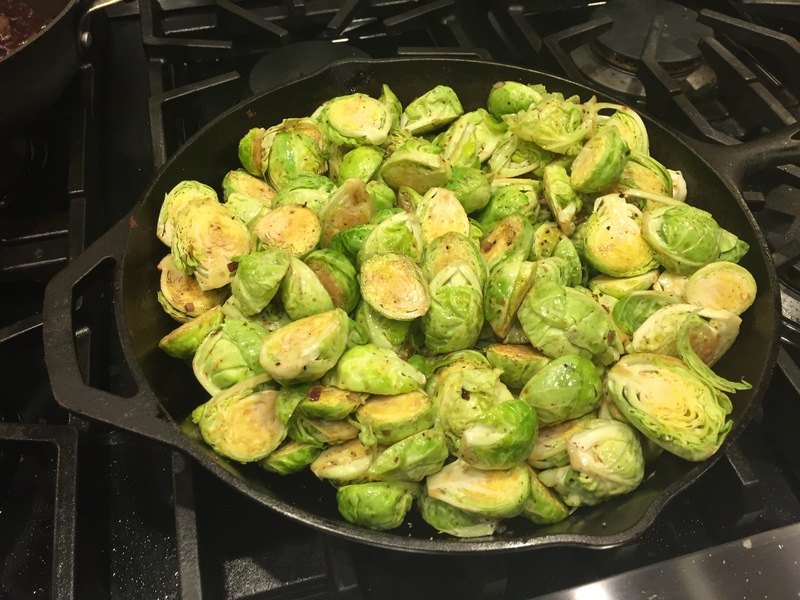 And I put the brussel sprouts in the oven. 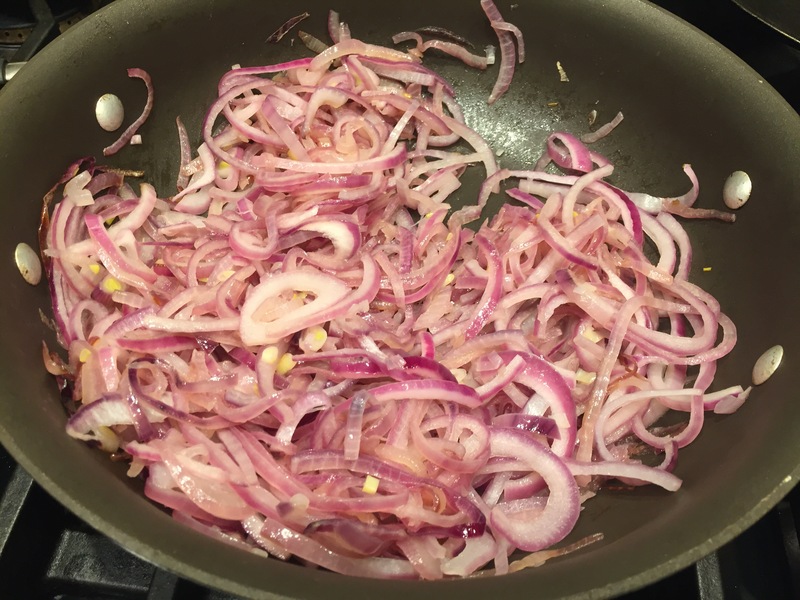 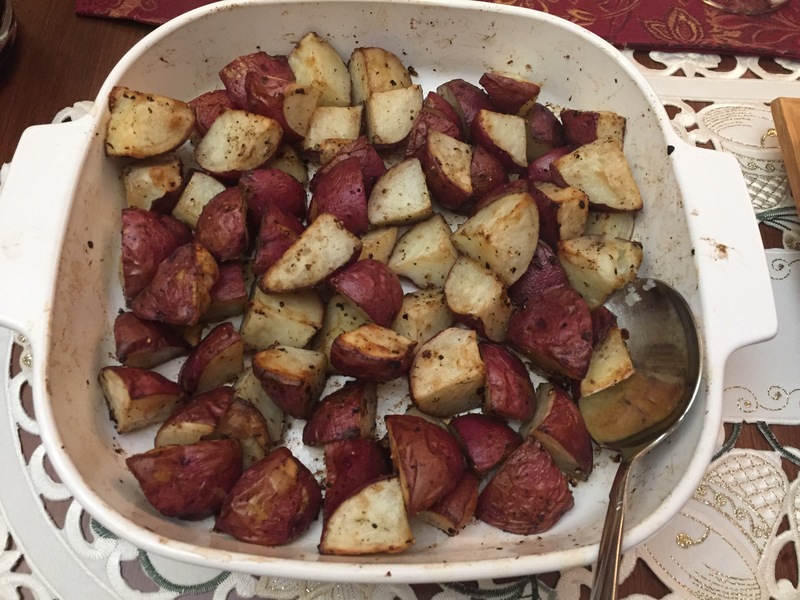 I roasted them with crispy red onions, salt, pepper, olive oil, and balsamic vinegar. 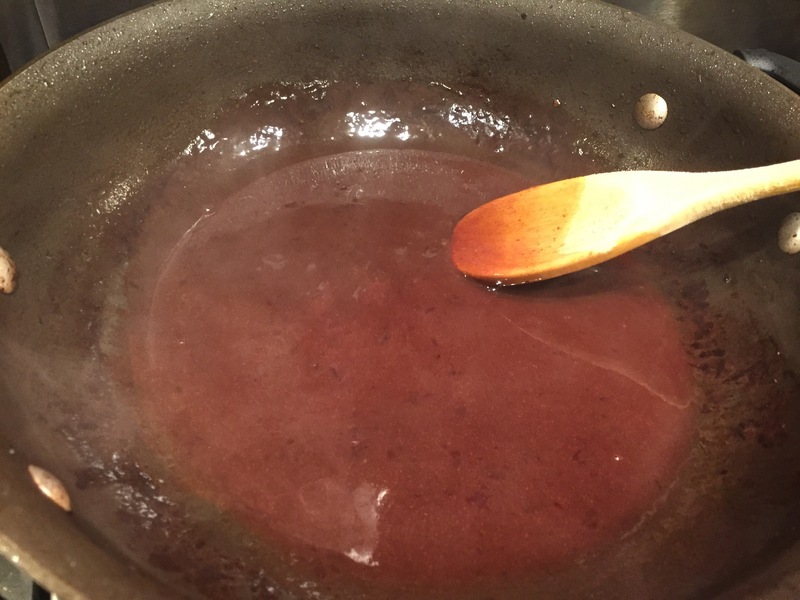 At 15 minutes before dinner, I put the steaks in the oven and strained the gravy. 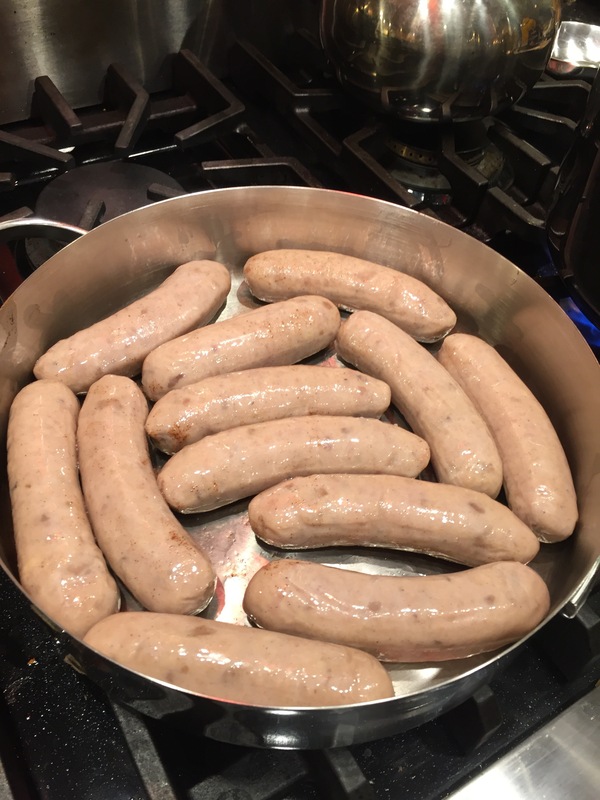 I returned most the gravy to the pan. 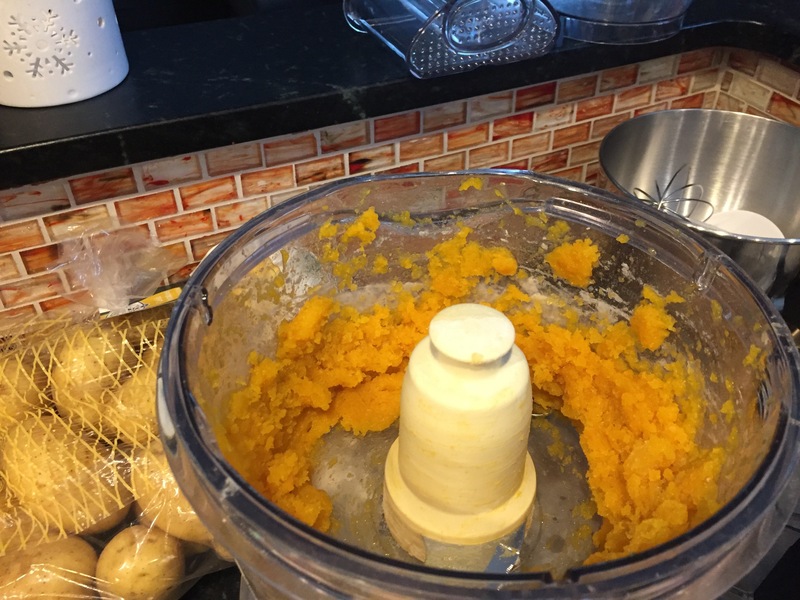 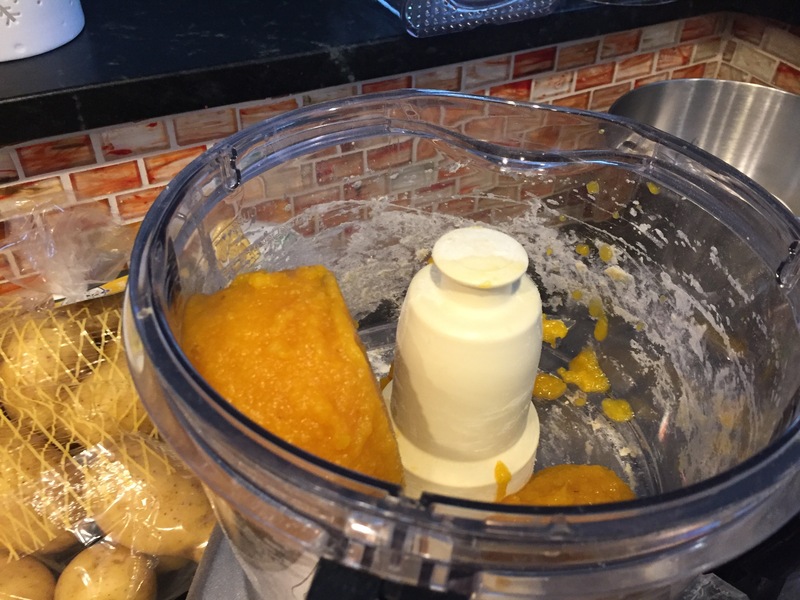 I kept ~¼ cup into which I whisked about 1 teaspoon of corn starch and then whisked this into the rest of the gravy and returned it to a boil to thicken it. 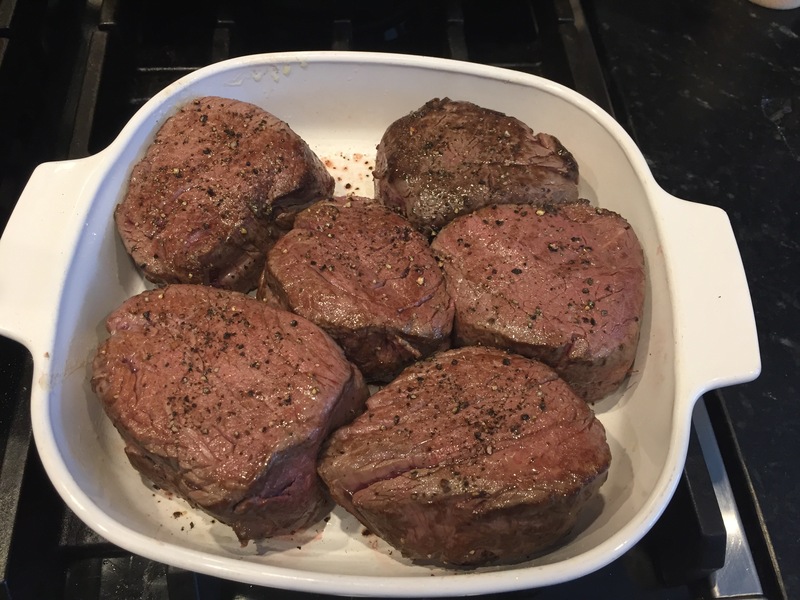 Take the beef, and everything else out of the oven when the internal temp of the beef is 135F (assuming you appreciate medium rare). 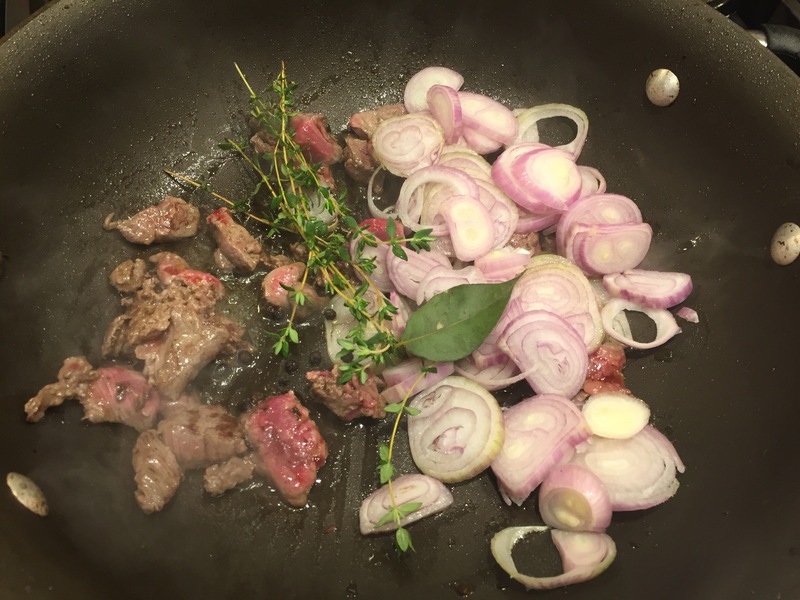 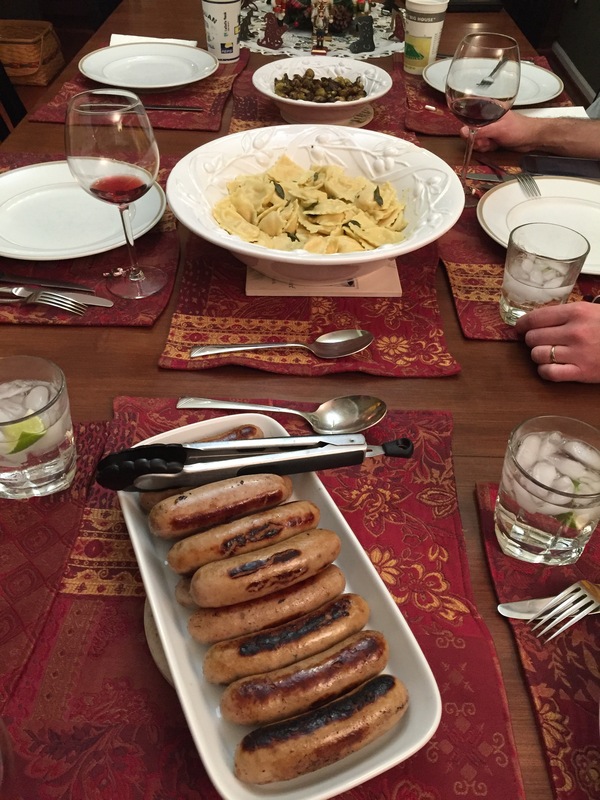 Beef and Lamb, Christmas, Entrées, Season, Tested and Approved! 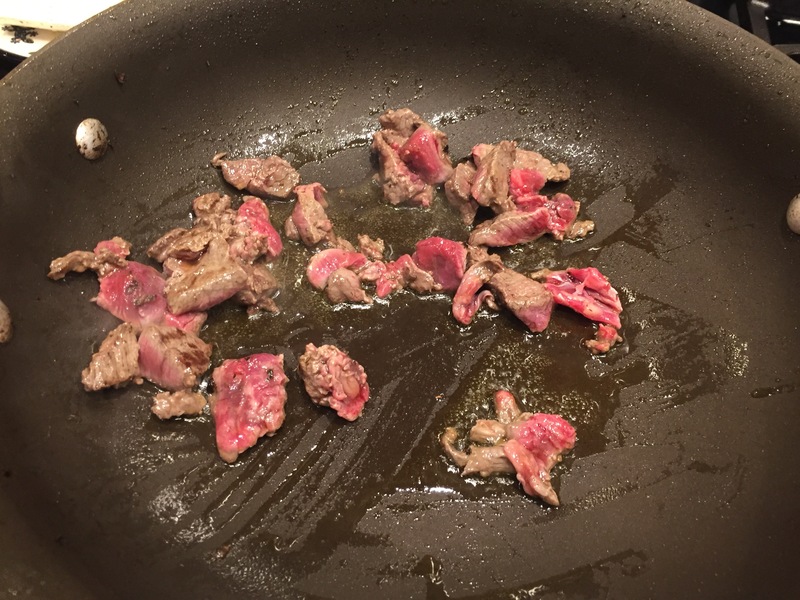 Quickly sear the beef in a hot pan with a little olive oil for 30-60 seconds until browned all over and very rare in the middle. 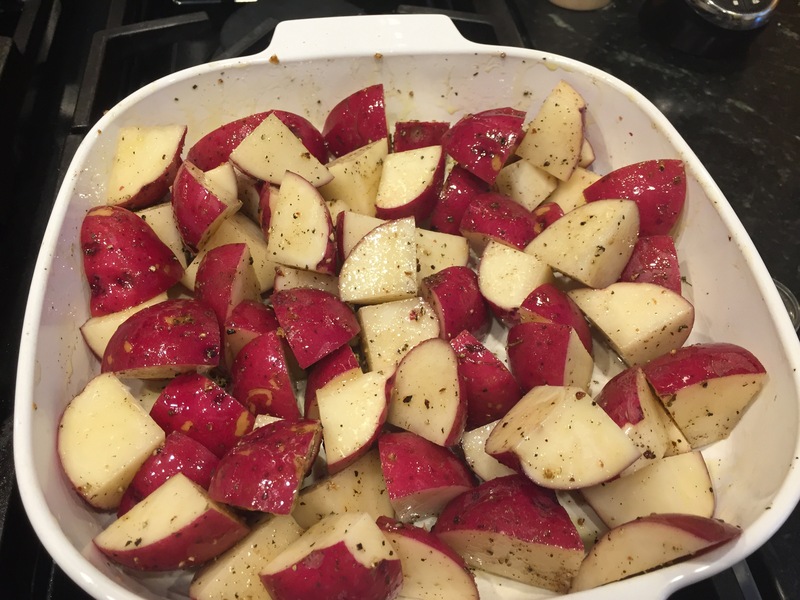 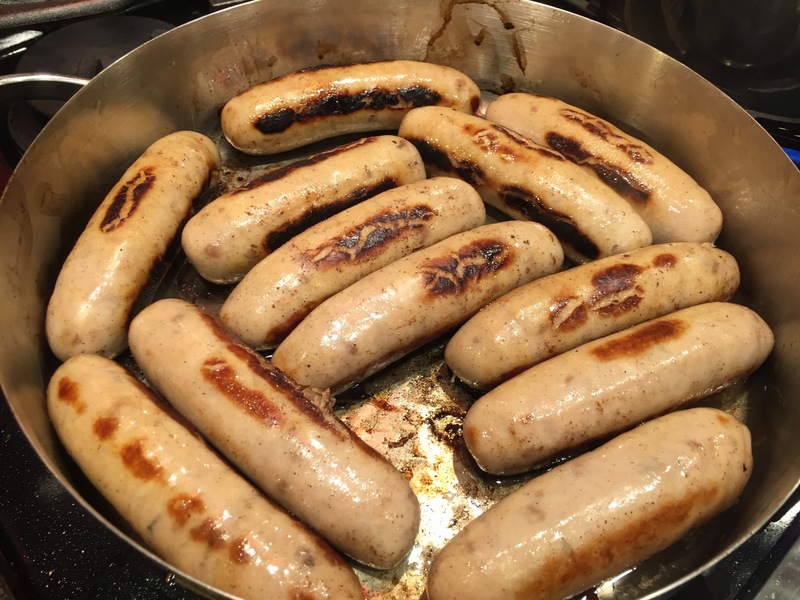 Remove from the pan and leave to cool, then return to the fridge. 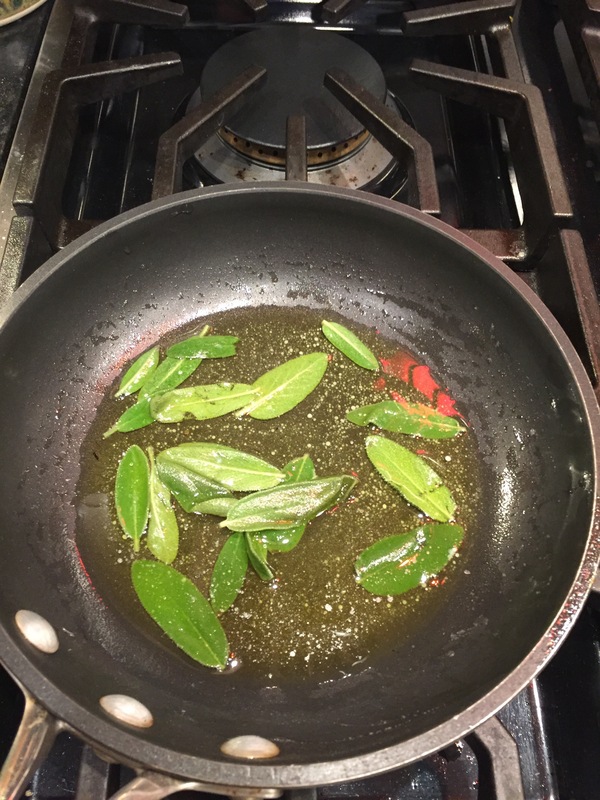 Finely chop the mushrooms and fry in a hot pan with a little olive oil, the thyme sprigs, and pepper. 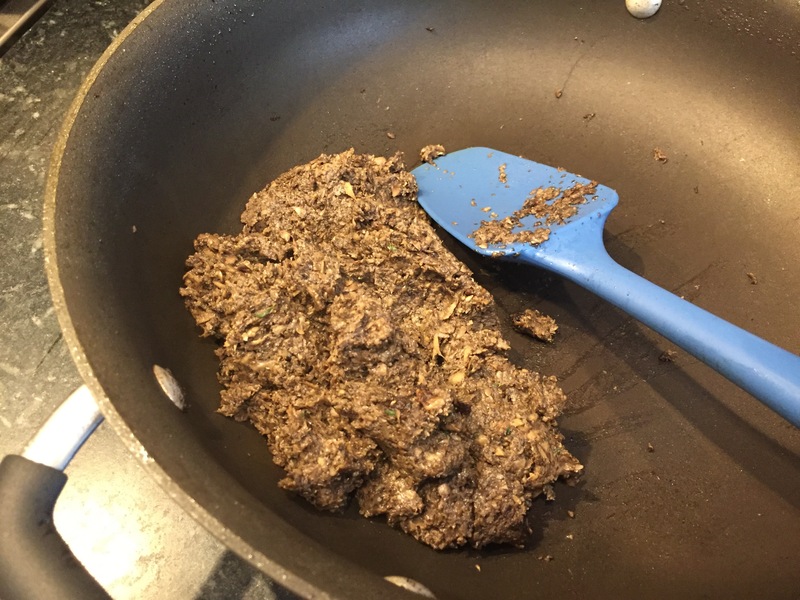 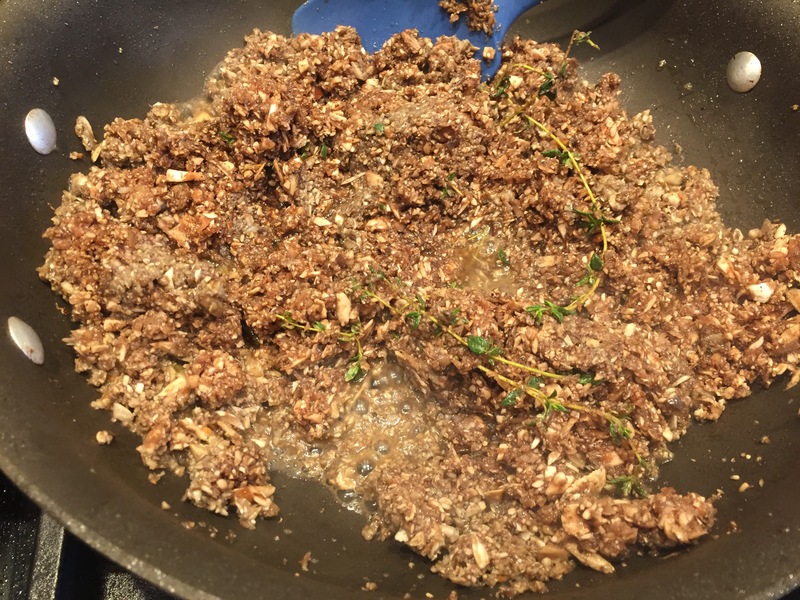 When the mushrooms begin to release their juices, continue to cook over a high heat for about 10-15 minutes until all the excess moisture has evaporated and you are left with a mushroom paste just beginning to brown (known as a duxelle). 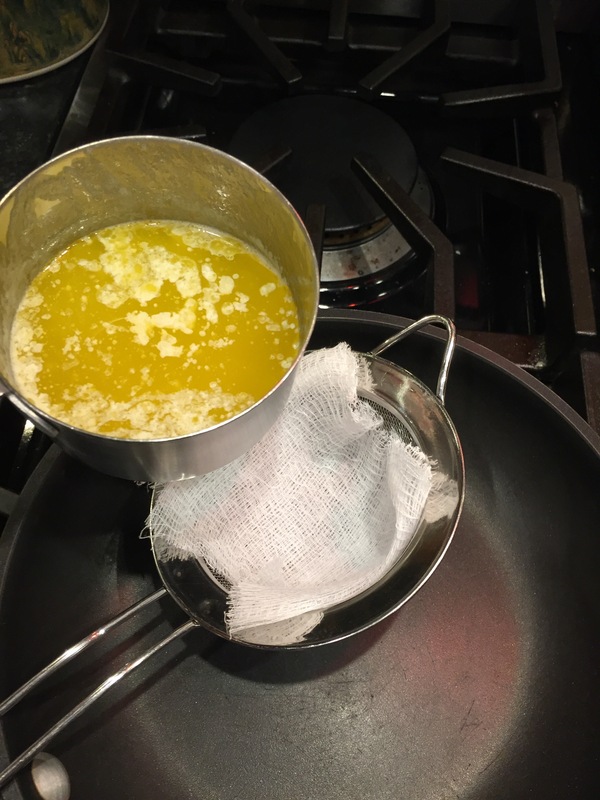 Remove the pan from the heat and allow to cool. 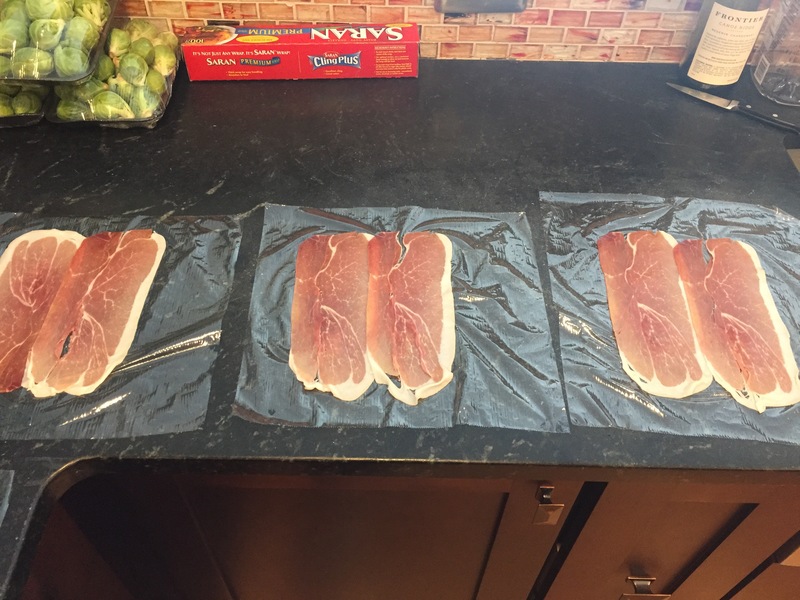 Lay 6 squares of saran wrap on a work surface and arrange 2 slices of prosciutto on each, slightly overlapping. 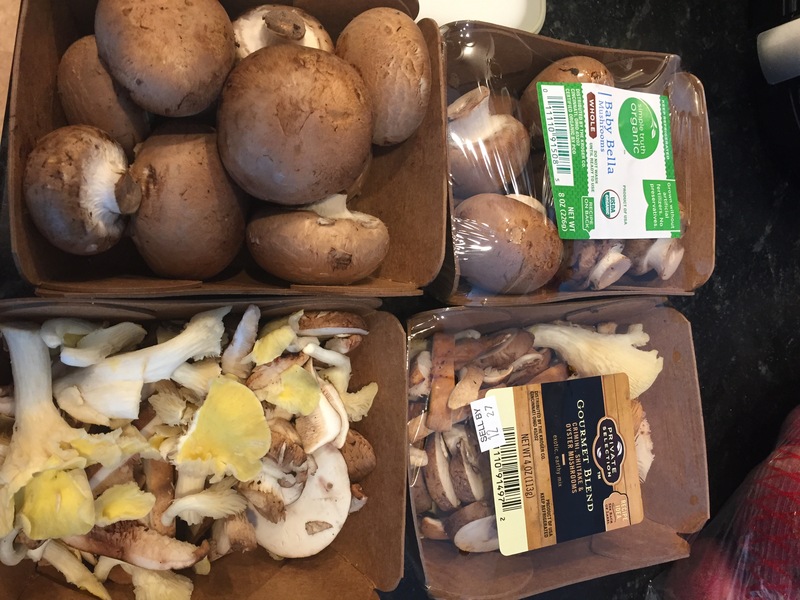 With a palette knife, spread the mushroom paste over the prosciutto. 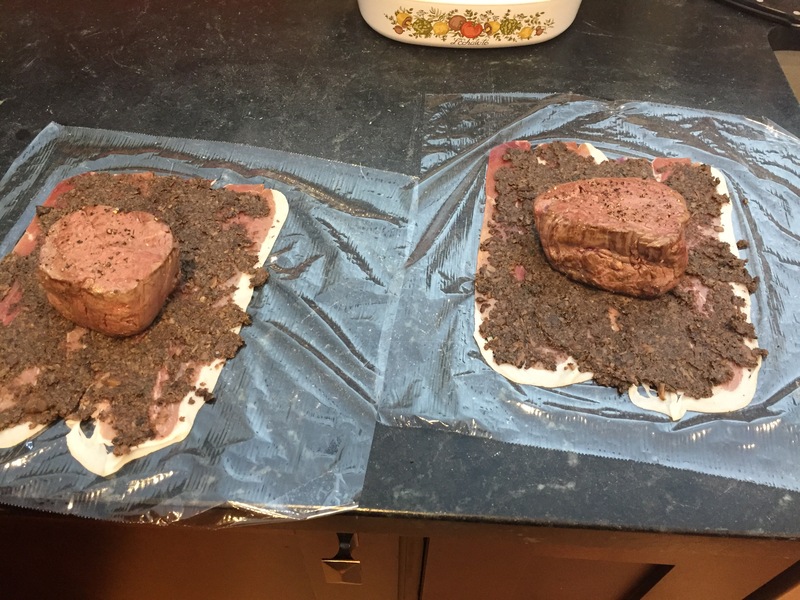 Season each filet with salt and pepper then place one in the middle of each square. 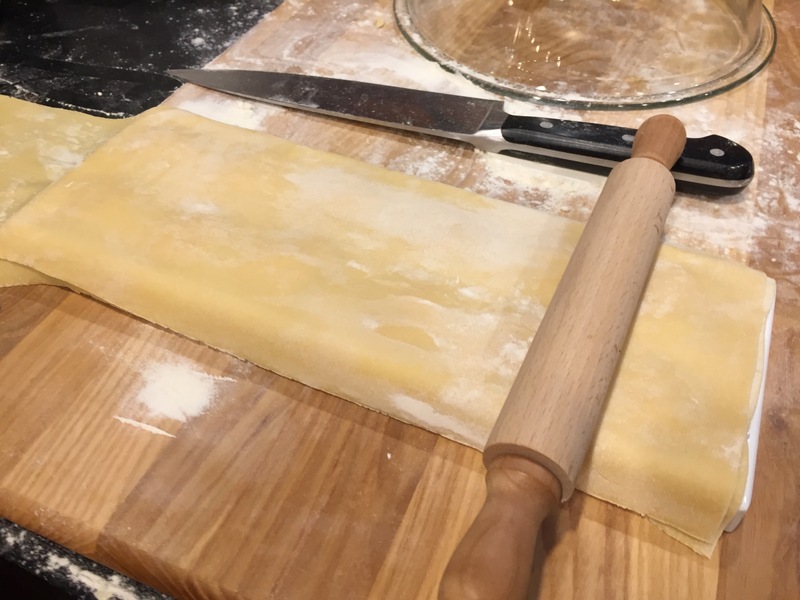 Neatly wrap the proscuitto and mushrooms, then the saran wrap around the beef to form a tight package. 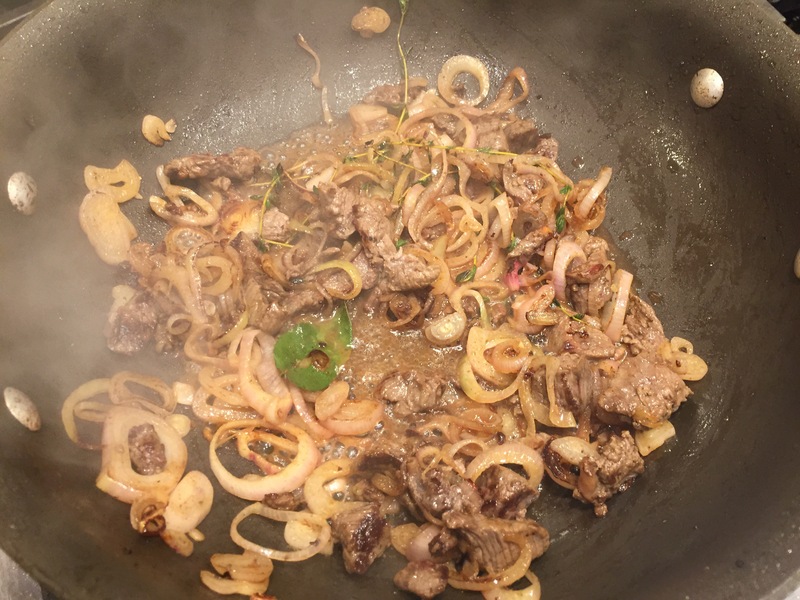 Chill for at least 30 minutes to allow the beef to keep its shape. 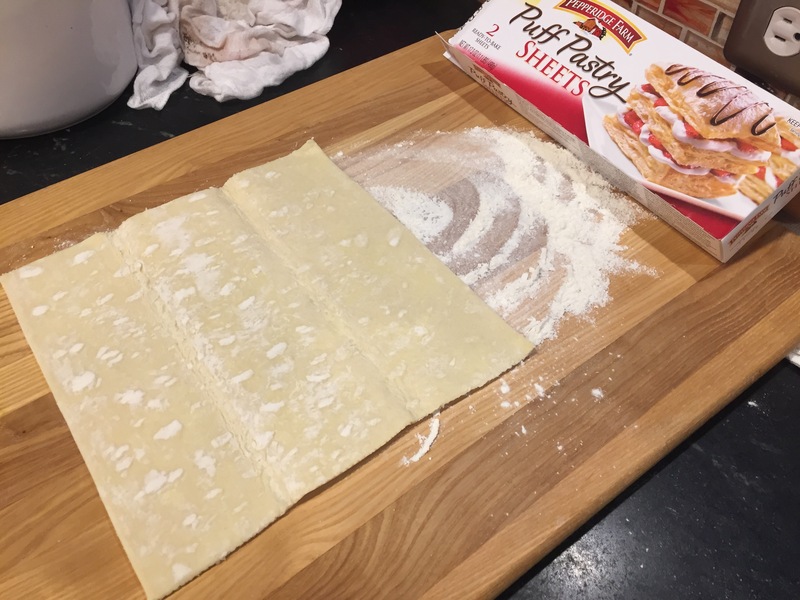 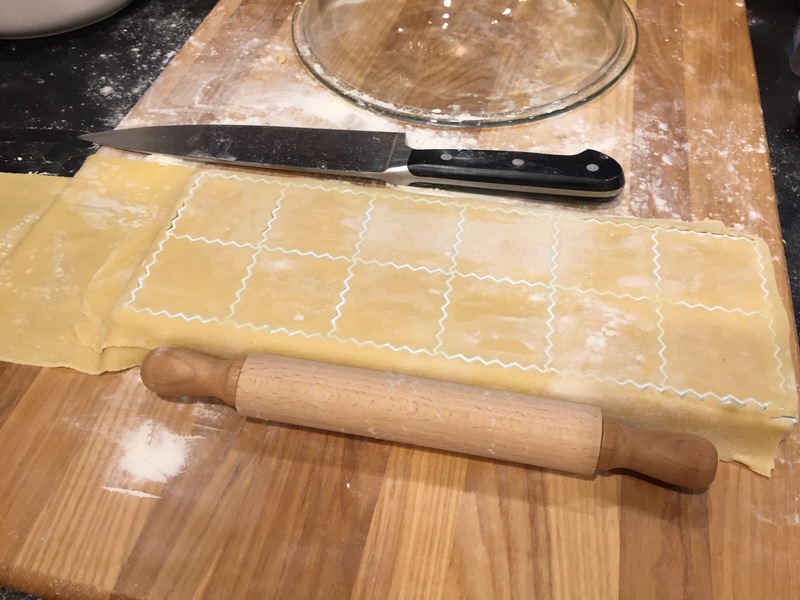 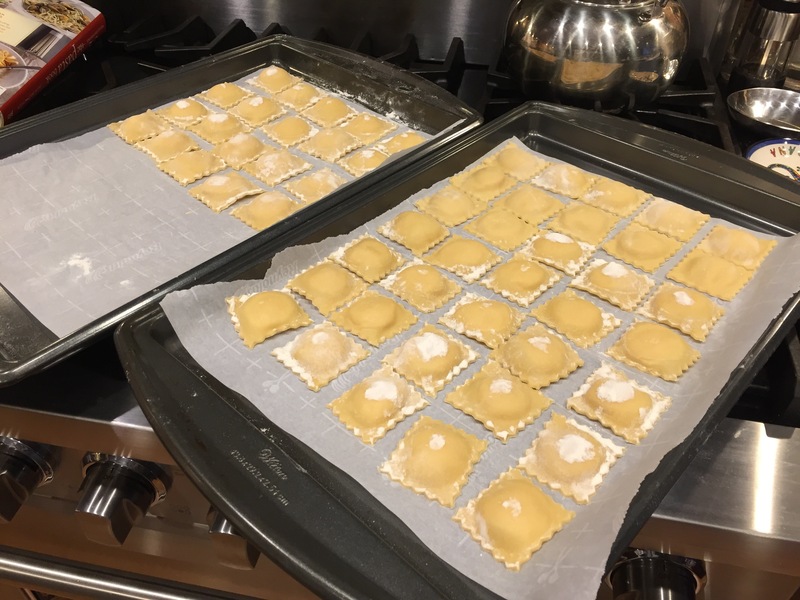 Cut each sheet of pastry in half, place on a lightly floured surface and roll into a rectangle large enough to envelop one of the beef fillets (~8-9″ square). 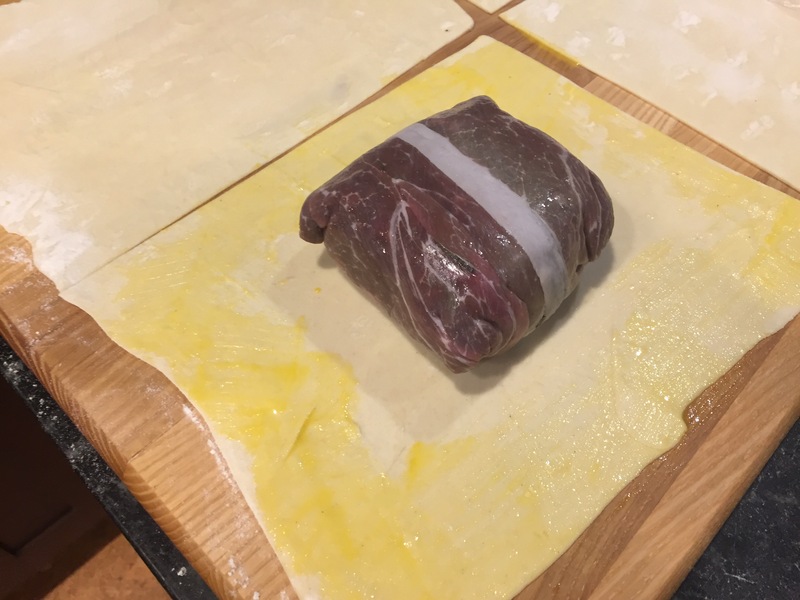 Remove the saran wrap from the beef, brush the edges of the pastry with egg wash, then wrap the pastry around each filet. 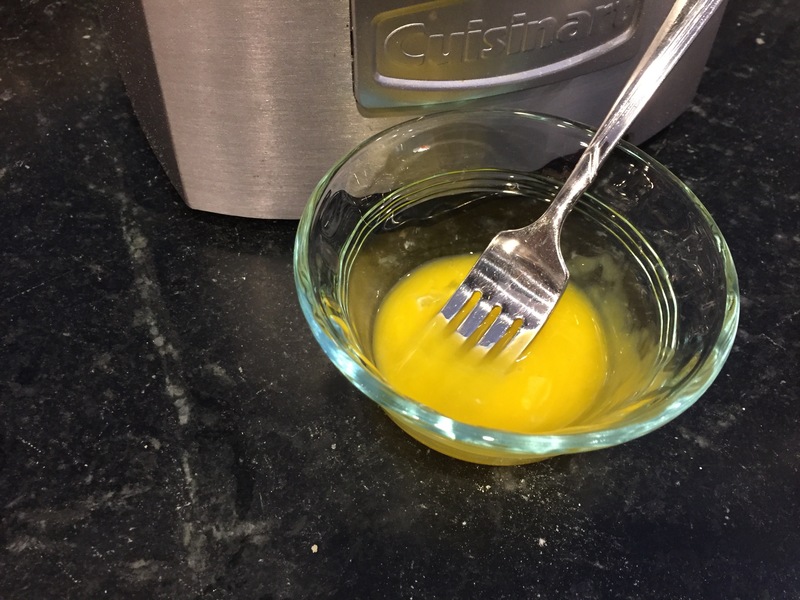 Brush the outside with the egg wash. 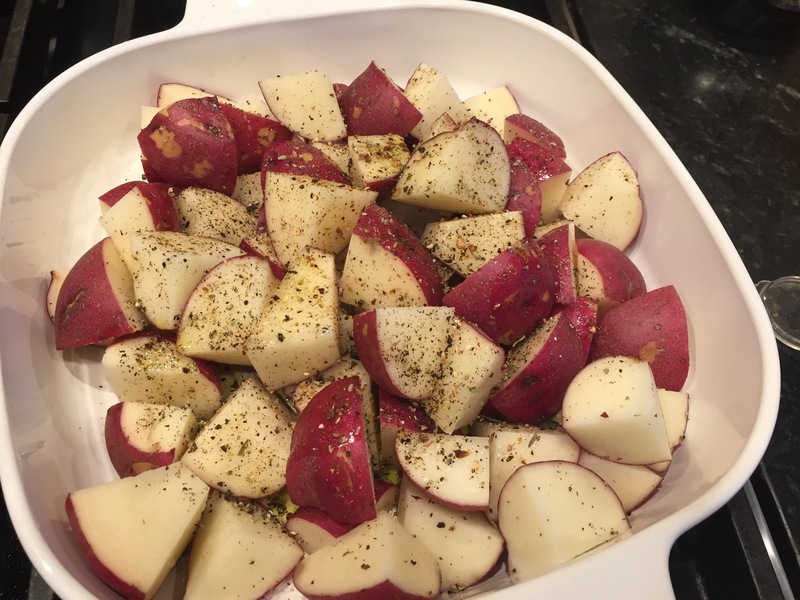 Allow to rest for at leat 15 minutes before baking, if more than 30 chill in the fridge. 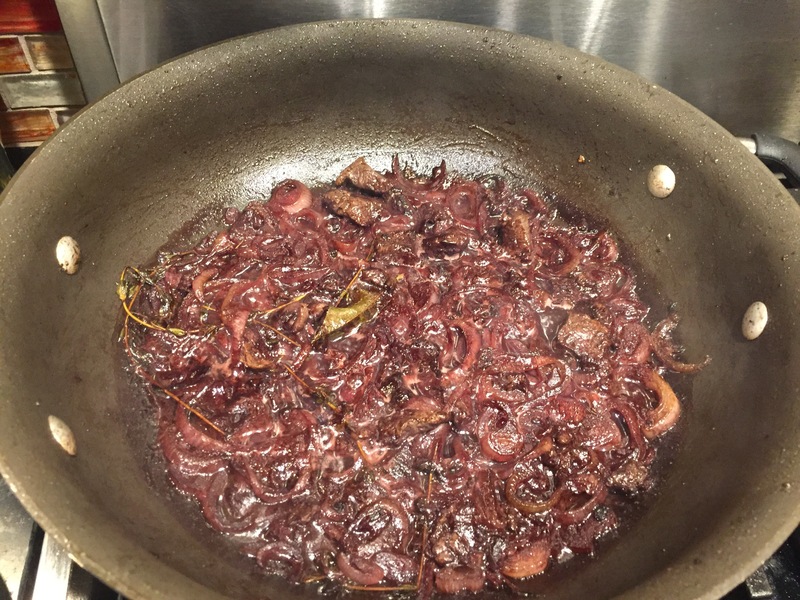 Meanwhile, make the red wine sauce. 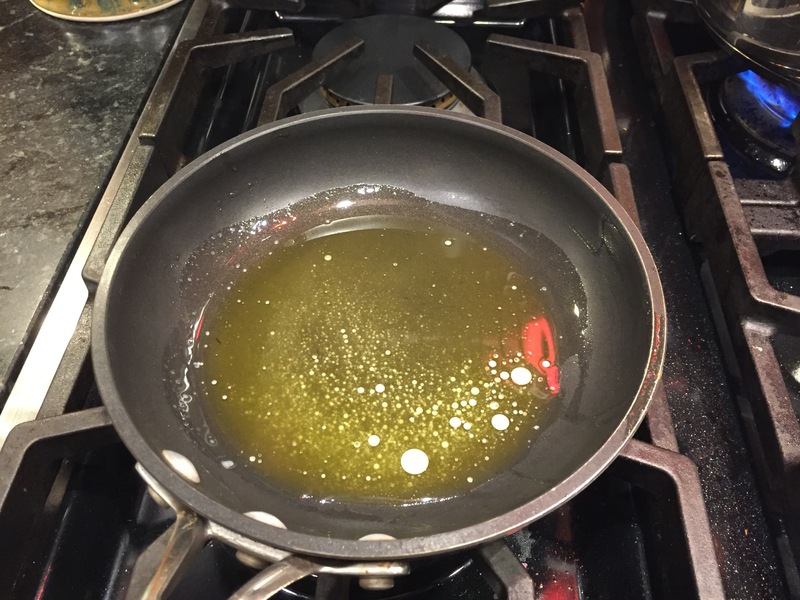 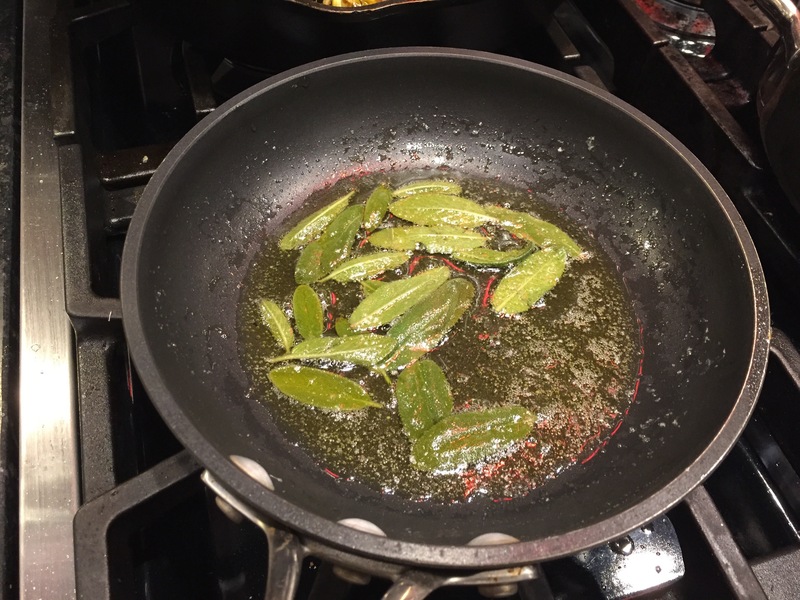 Heat the oil in a large pan, then fry the beef trimmings for a few minutes until browned on all sides. 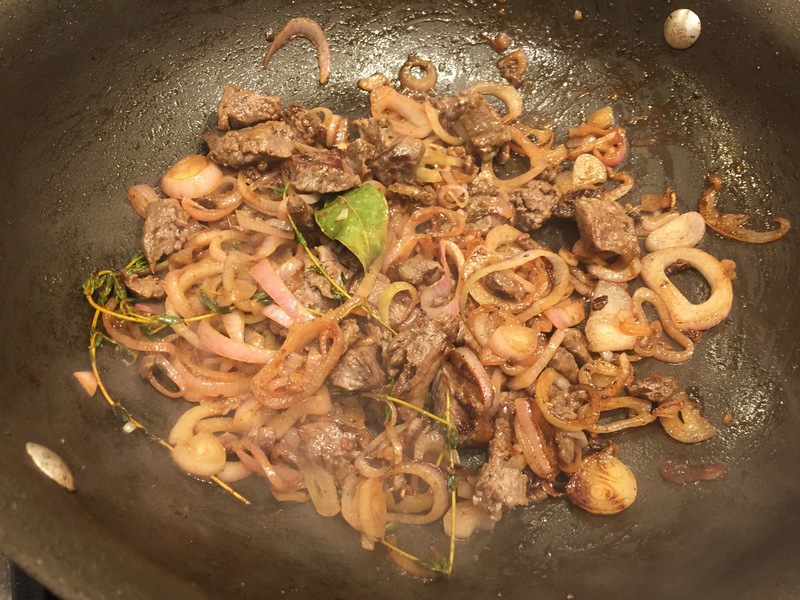 Stir in the shallots with the peppercorns, bay leaf, and thyme then continue to cook for about 5 minutes, stirring frequently, until the shallots turn golden brown. 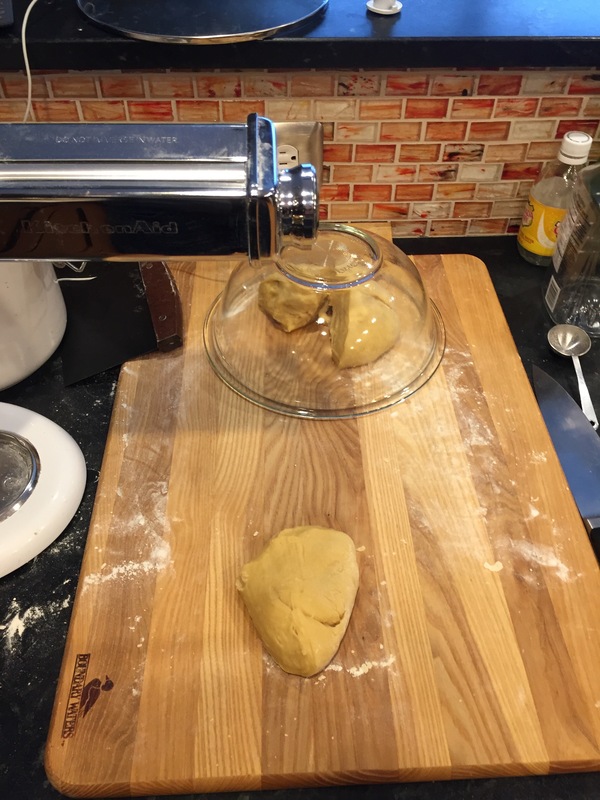 Pour in the vinegar and let it bubble for a few minutes until almost dry. 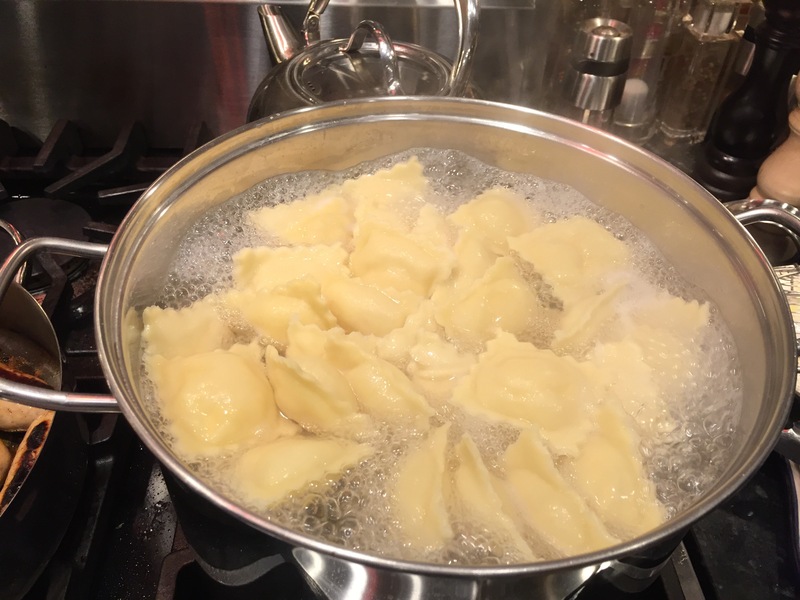 Then add the wine and boil until reduced to ~½ cup. 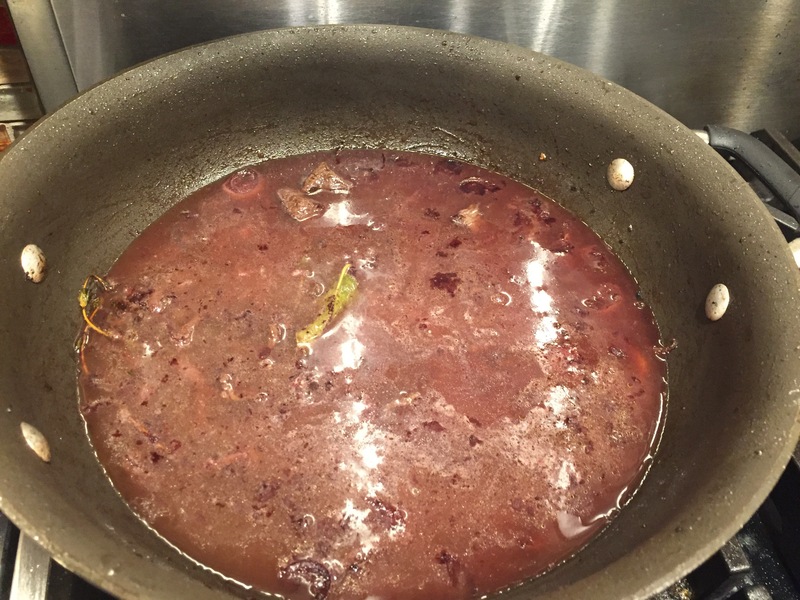 Add the stock and bring to the boil again. 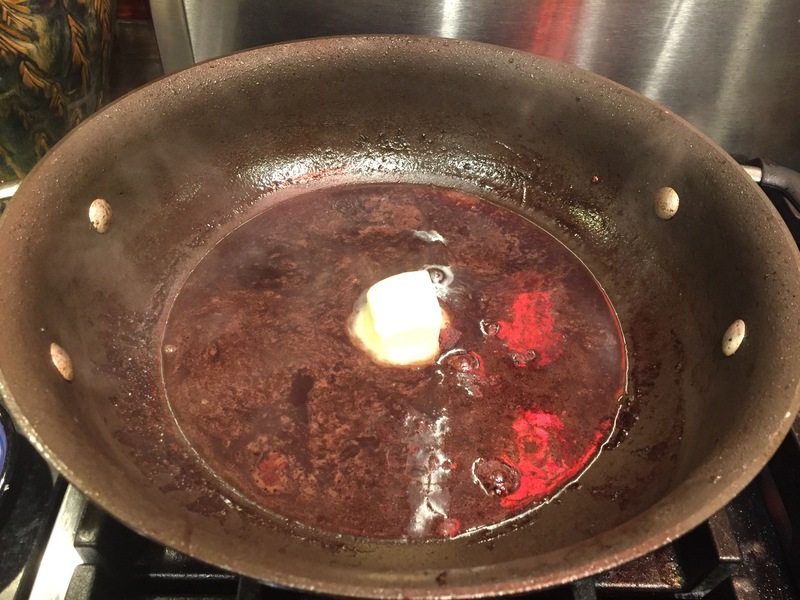 Lower the heat and simmer gently until reduced to ~1½ cups. 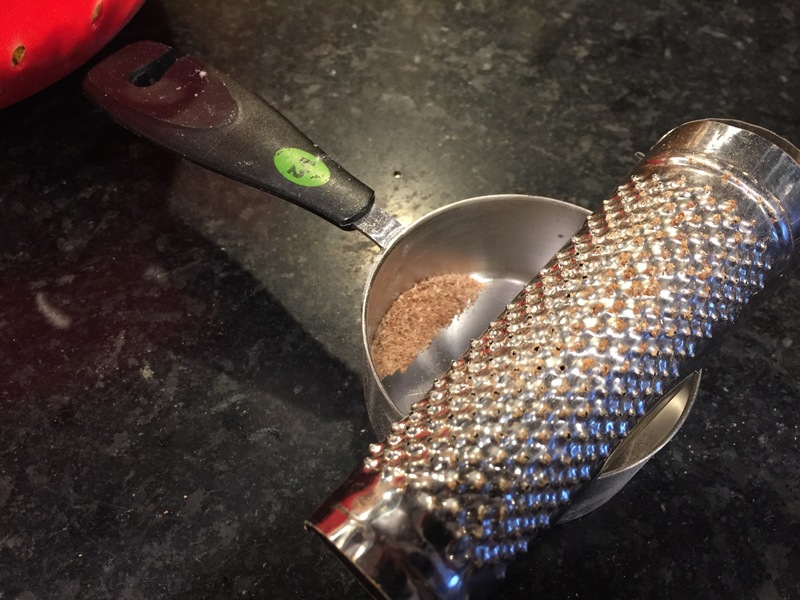 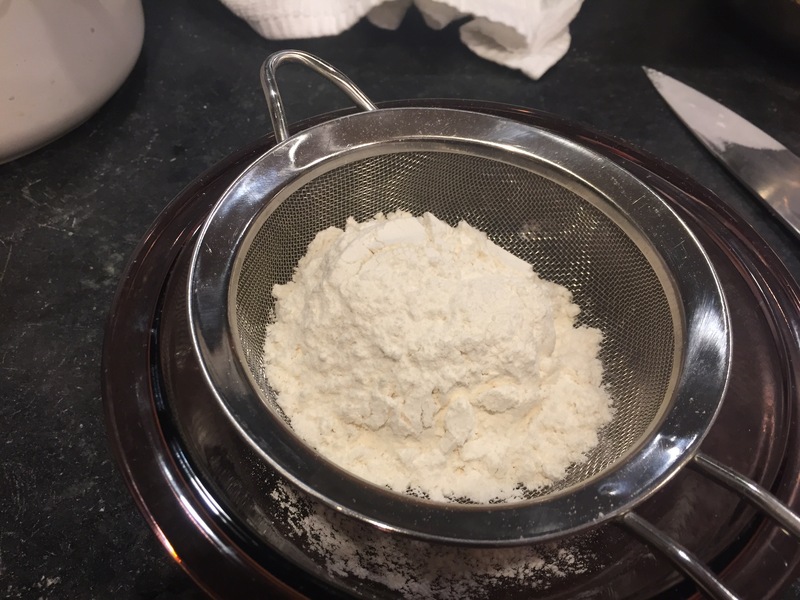 Strain the liquid through a fine sieve. 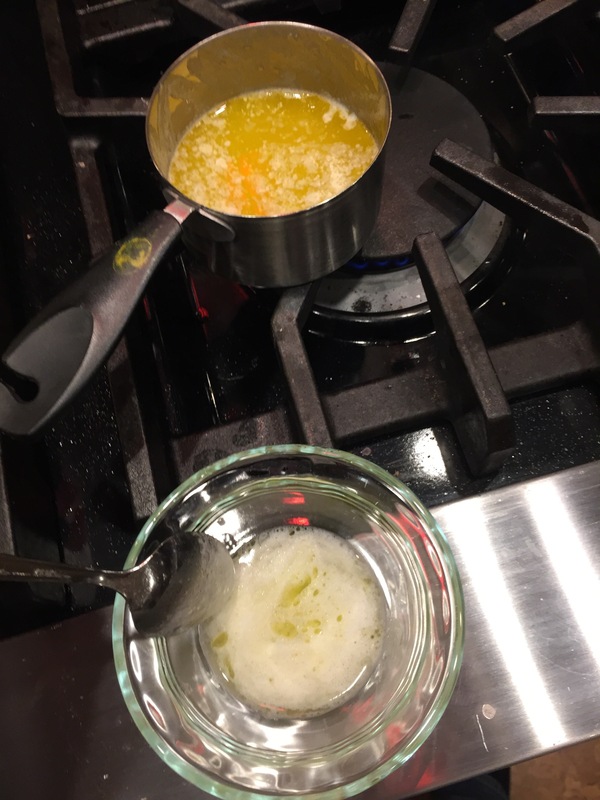 Check for seasoning and return to the pan, reserve ¼ cup and whisk in the corn starch. 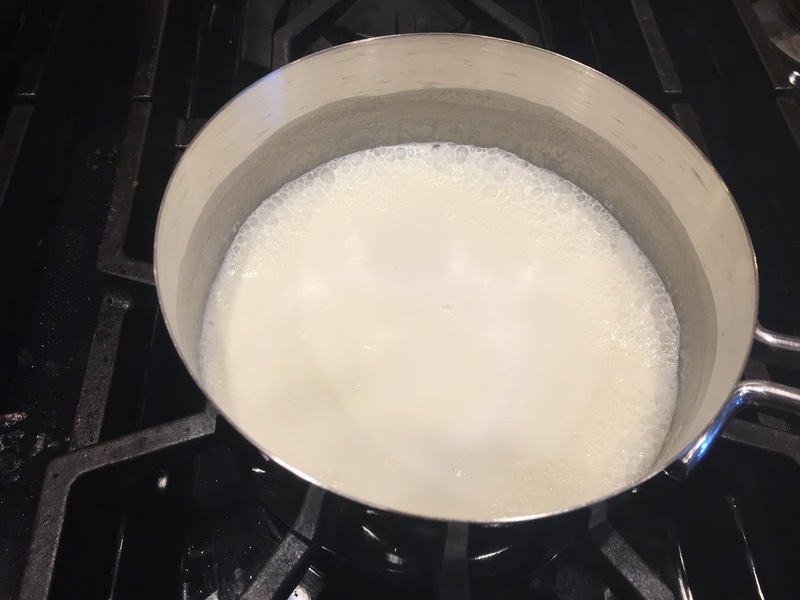 Whisk the reserved liquid back into the pan and bring to a boil until the sauce reaches the desired consistency, then set aside. 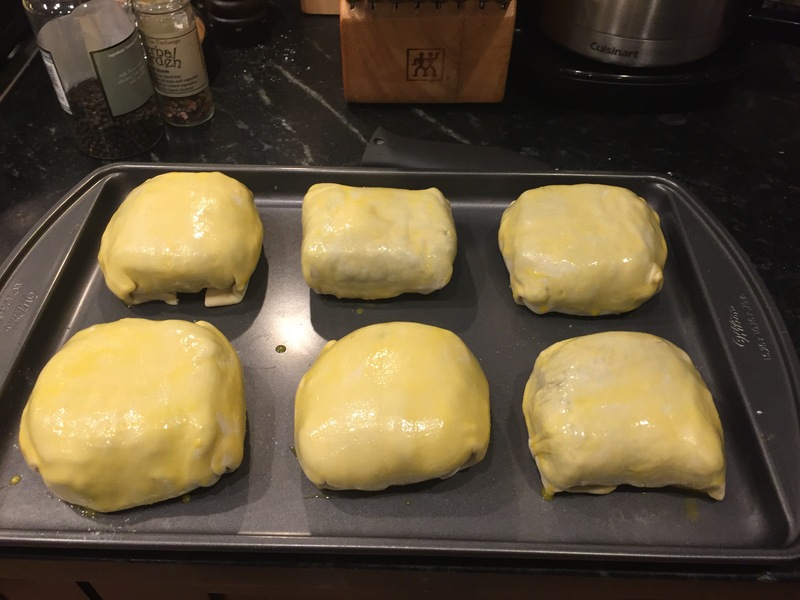 When you are ready to cook the beef wellingtons, score the pastry lightly then bake at 400°F for 15-20 minutes until the pastry is golden brown and cooked. 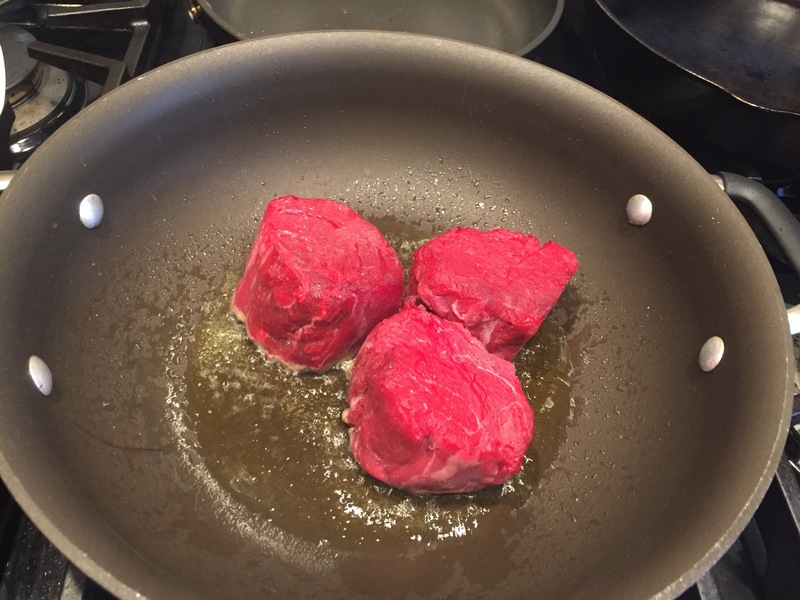 The internal temperature should be 135°F for medium rare. 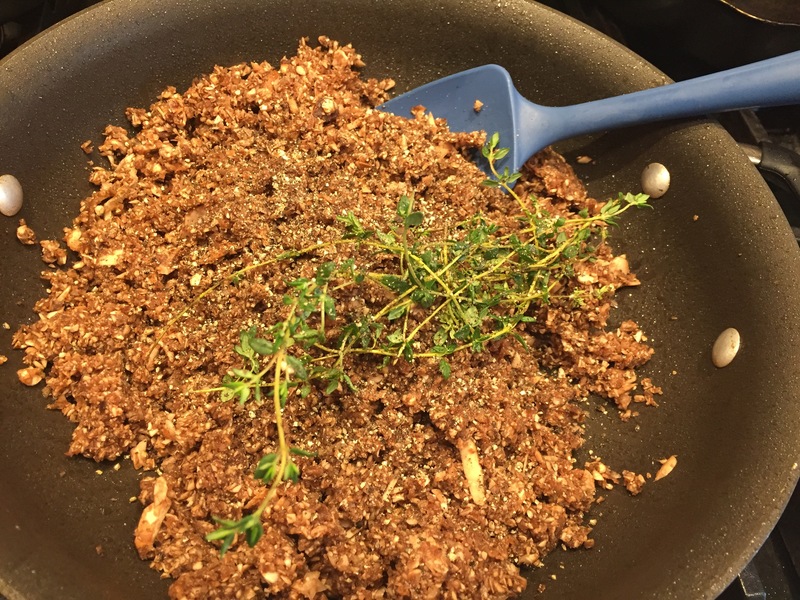 Allow to rest for 10 minutes before serving. 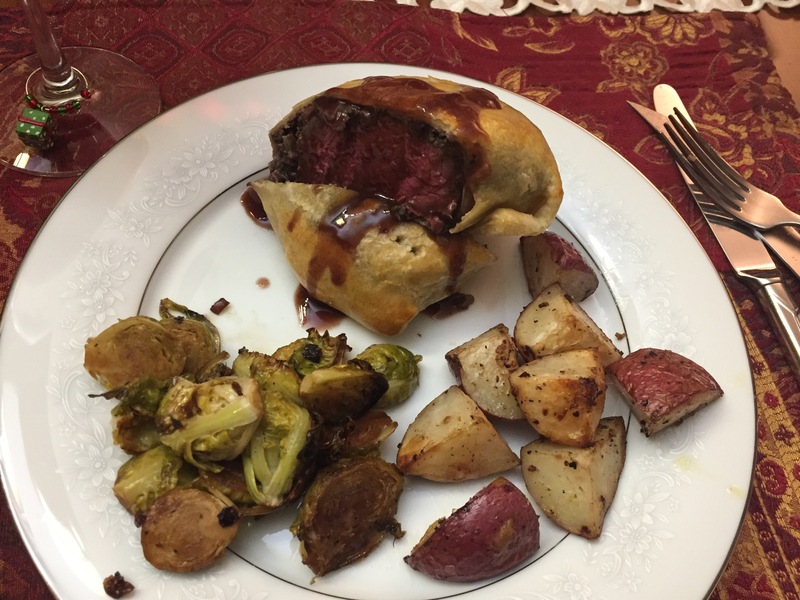 Serve the beef wellingtons, with the sauce as an accompaniment. 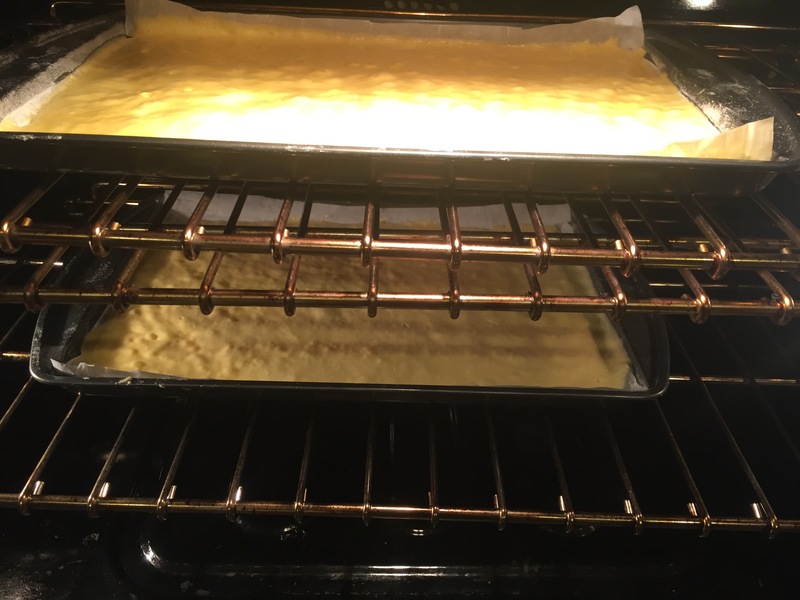 Make cake: Preheat oven to 450 degrees, with racks in upper and lower thirds. 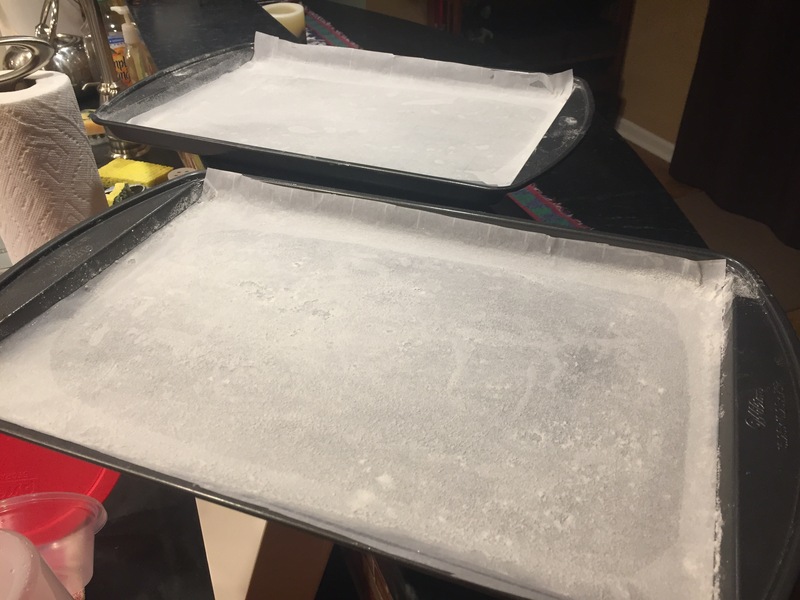 Coat two 10 1/2-by-15 1/2-inch jelly-roll baking pans with cooking spray. 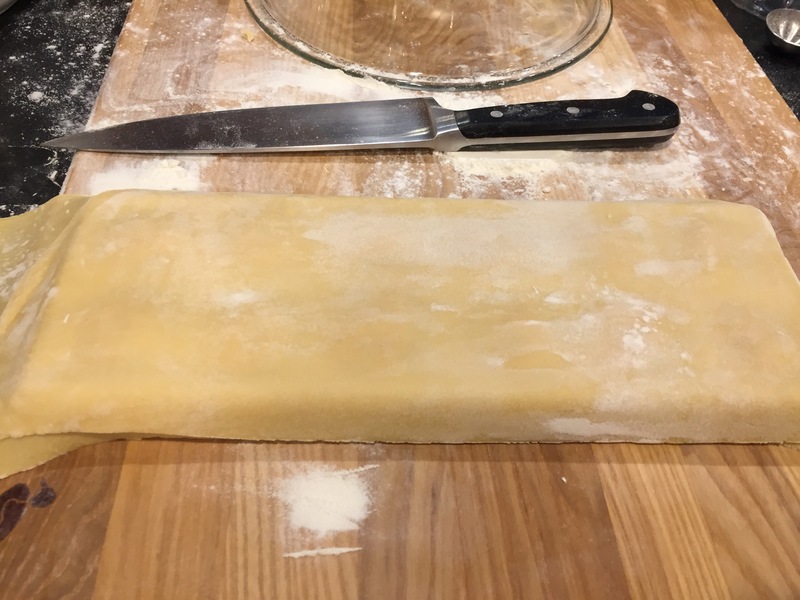 Line with parchment paper; coat with cooking spray. 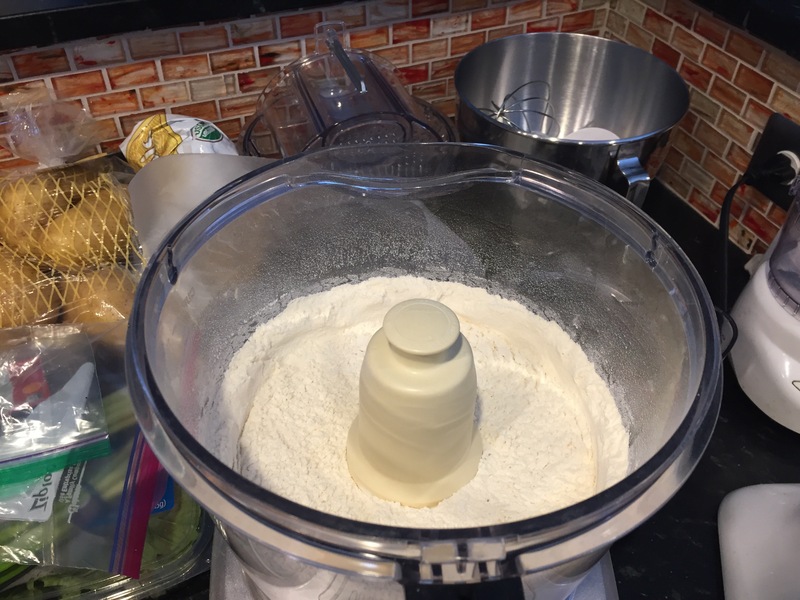 Dust with flour, tapping out excess. 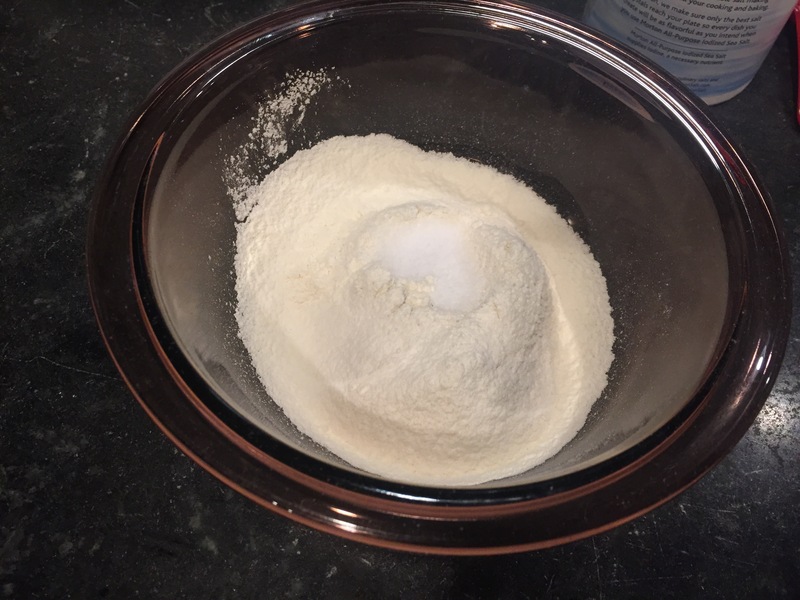 In a bowl, whisk together flour and teaspoon salt. 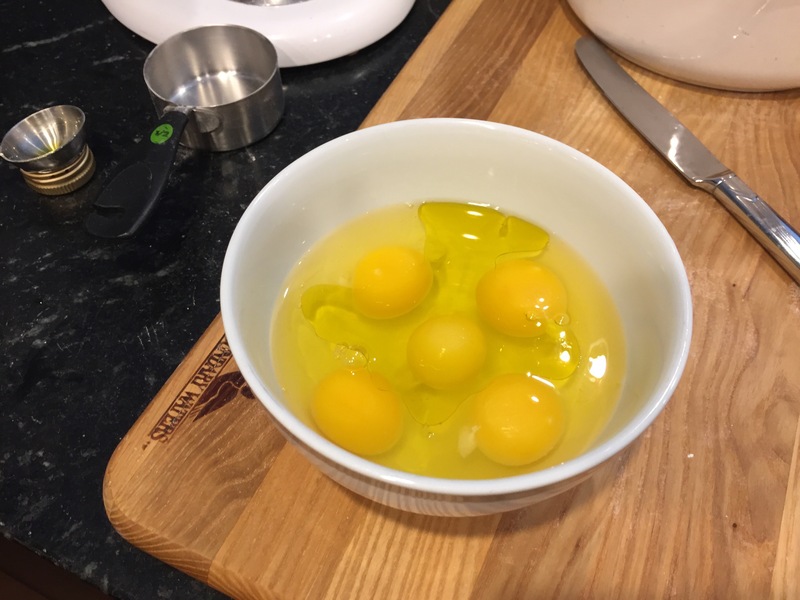 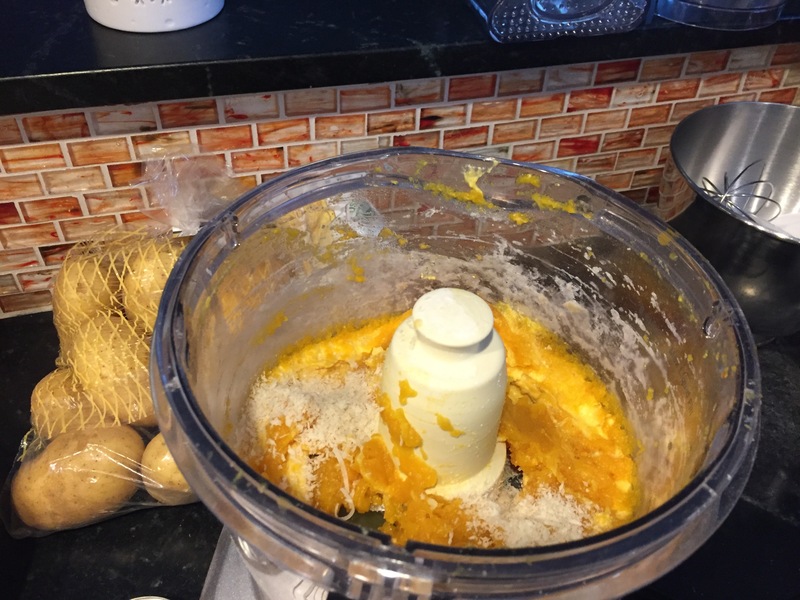 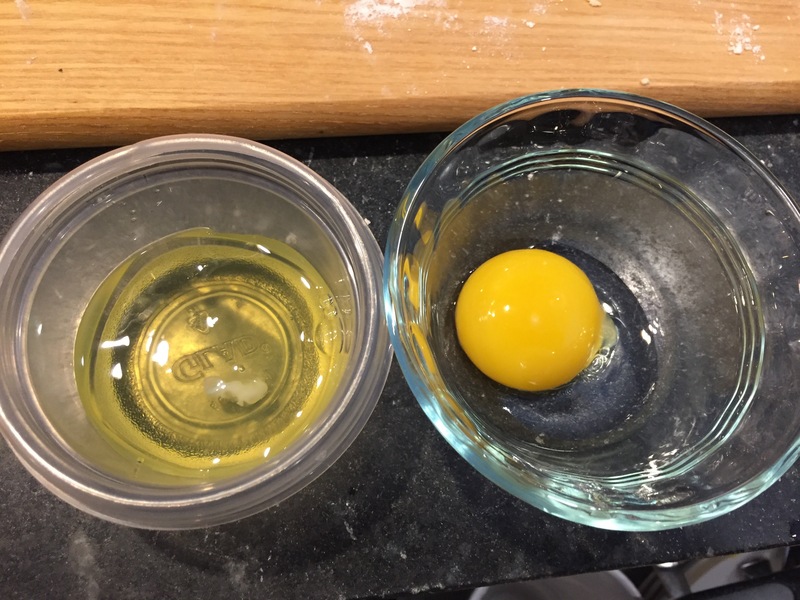 In a large bowl, using an electric mixer, beat eggs, yolks, and sugar on medium-high, 2 minutes; increase speed to high and beat until pale and thick, 5 minutes. 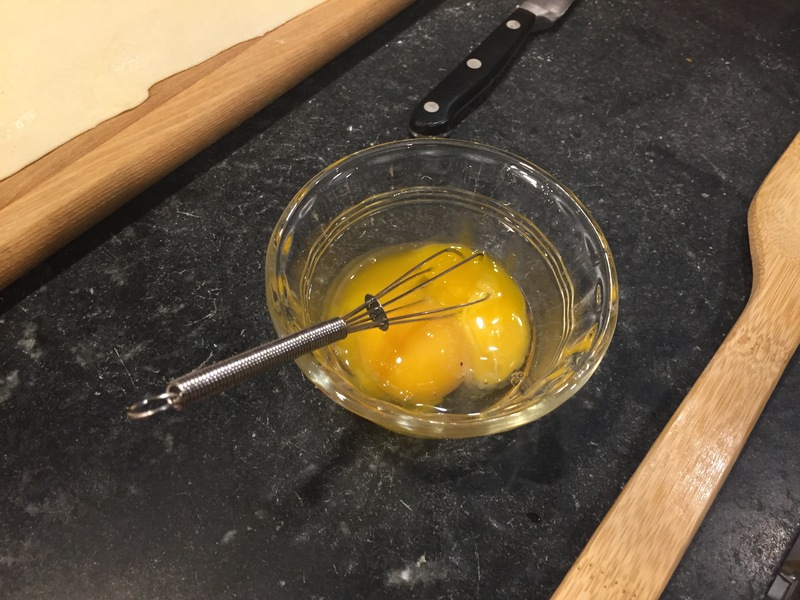 Sift flour mixture over egg mixture; with a large rubber spatula, fold together until almost blended. 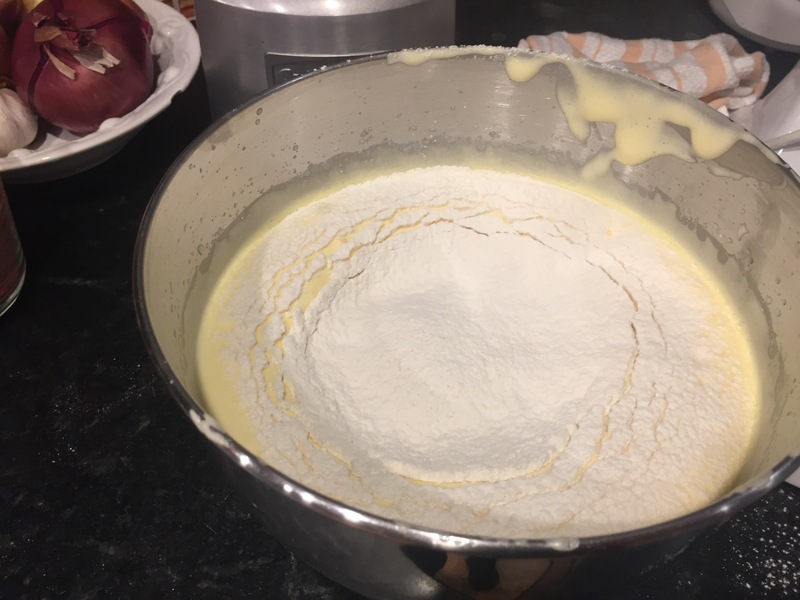 Pour butter down side of bowl, folding to combine. 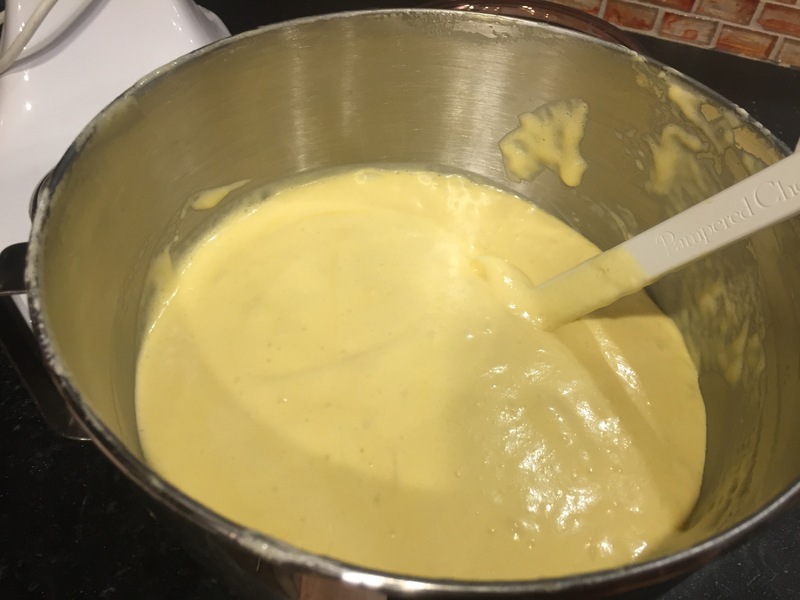 Divide batter between pans; smooth with a table knife. 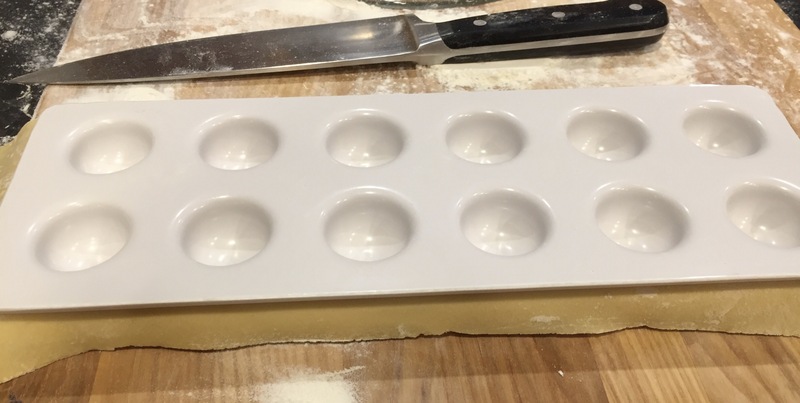 Immediately transfer pans to oven and bake until cakes are golden brown and springy when pressed, 6 to 7 minutes, rotating pans halfway through. 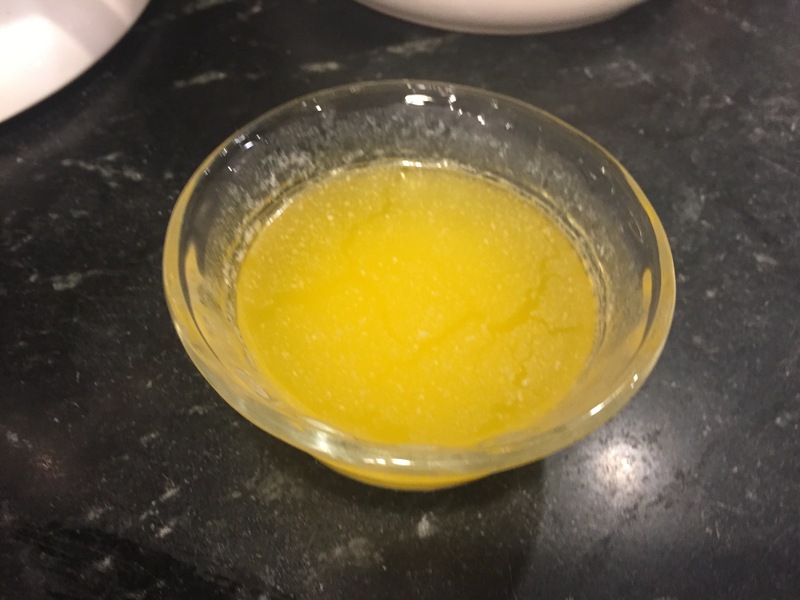 Let cool completely. 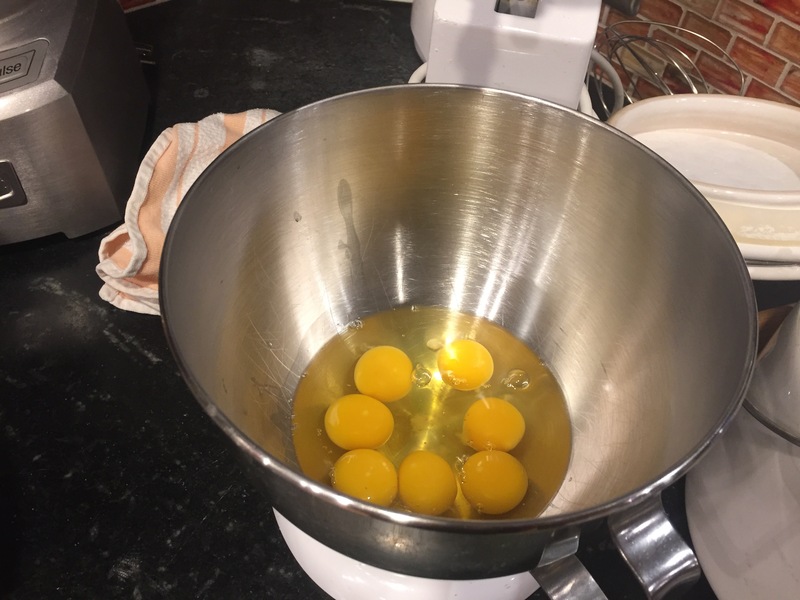 Make filling: In a large bowl, stir together egg yolks, mascarpone, sugar, cocoa, and pinch of salt. 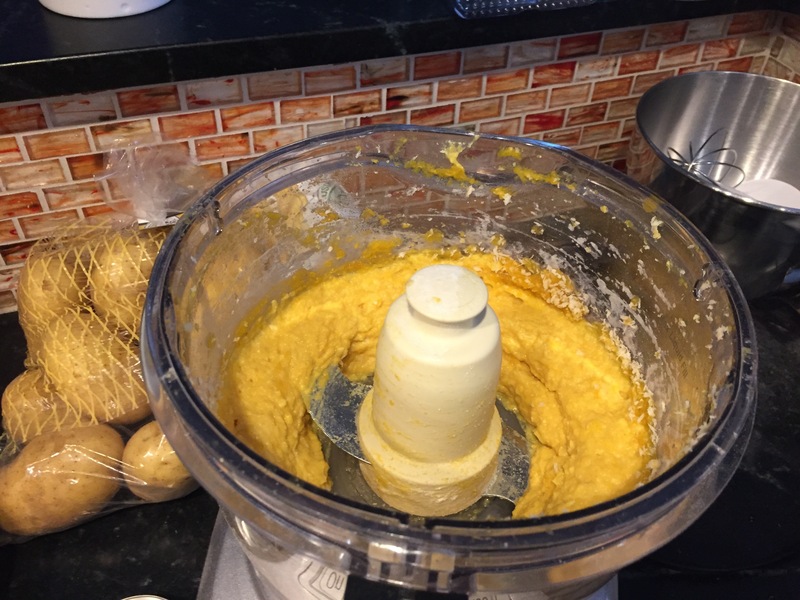 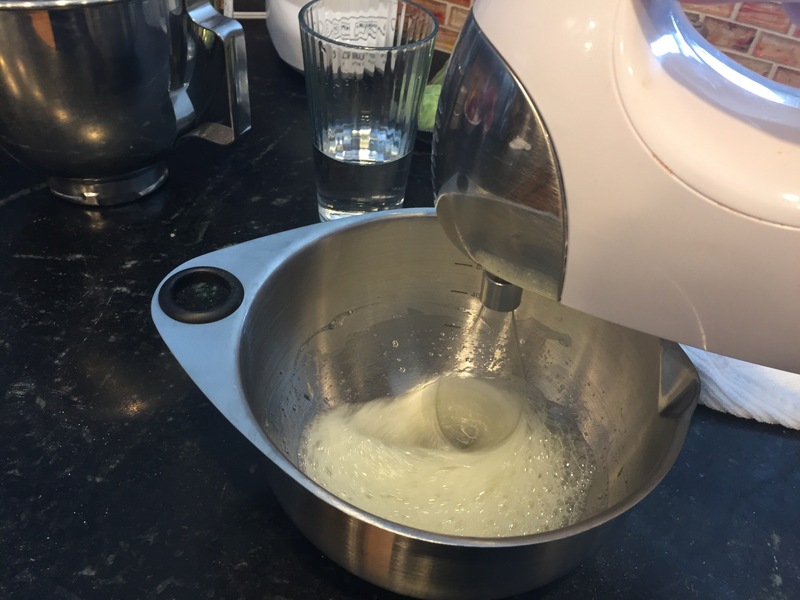 In another large bowl, using an electric mixer, beat egg whites and pinch of salt until soft peaks form. 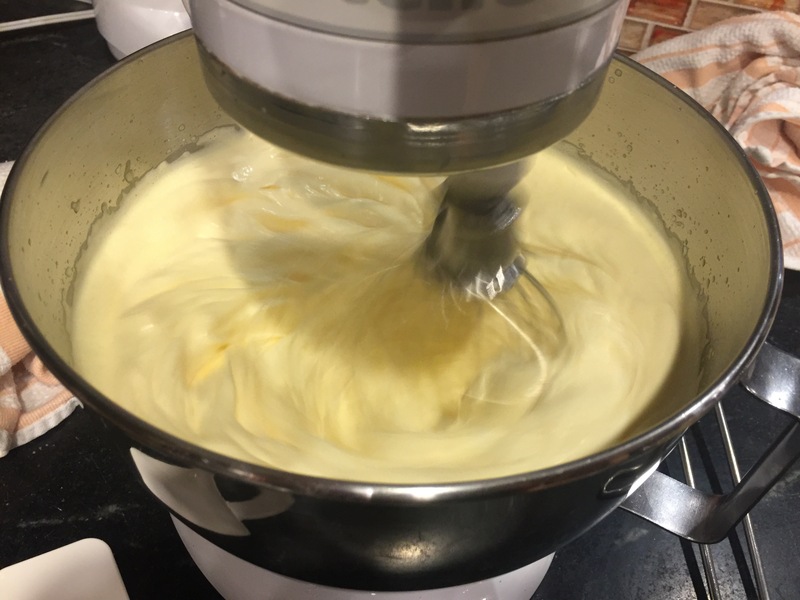 With a large rubber spatula, fold one-third whites into mascarpone mixture; fold in remainder. 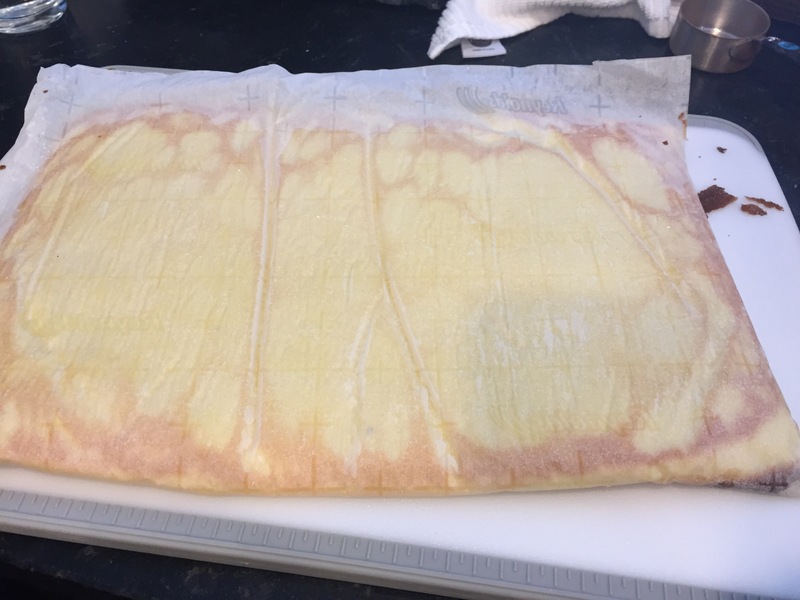 Invert cakes onto a work surface and gently peel off parchment. 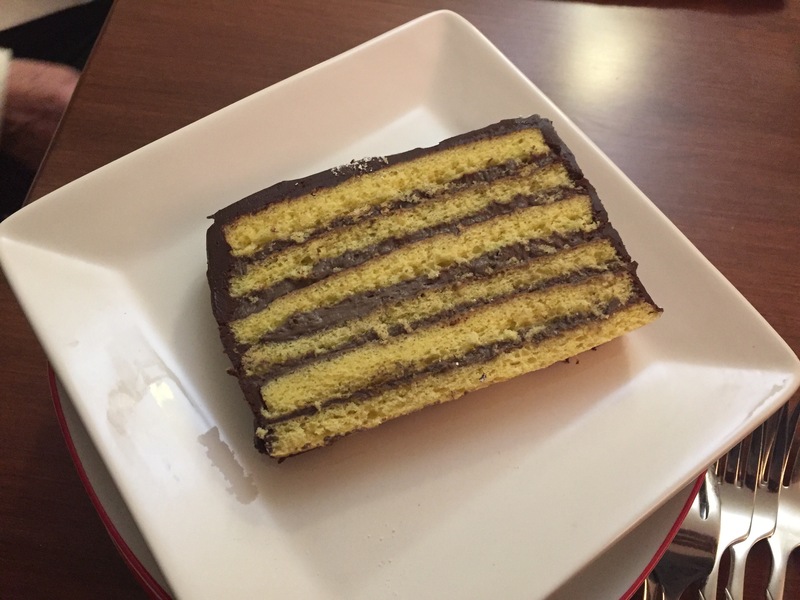 Using a serrated knife, trim cakes to measure 10 by 15 inches, then cut each crosswise into thirds. 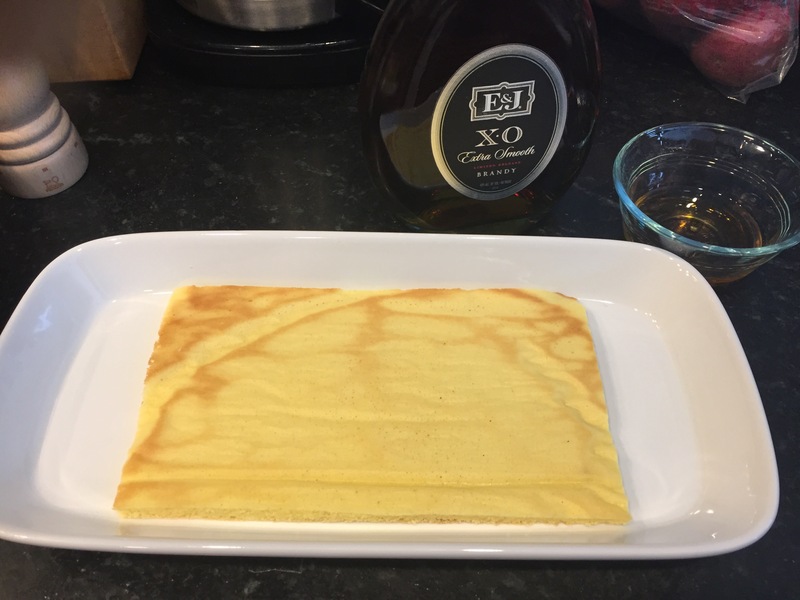 Place 1 cake layer, golden side up, on a platter; brush with brandy and spread with 1 cup filling. 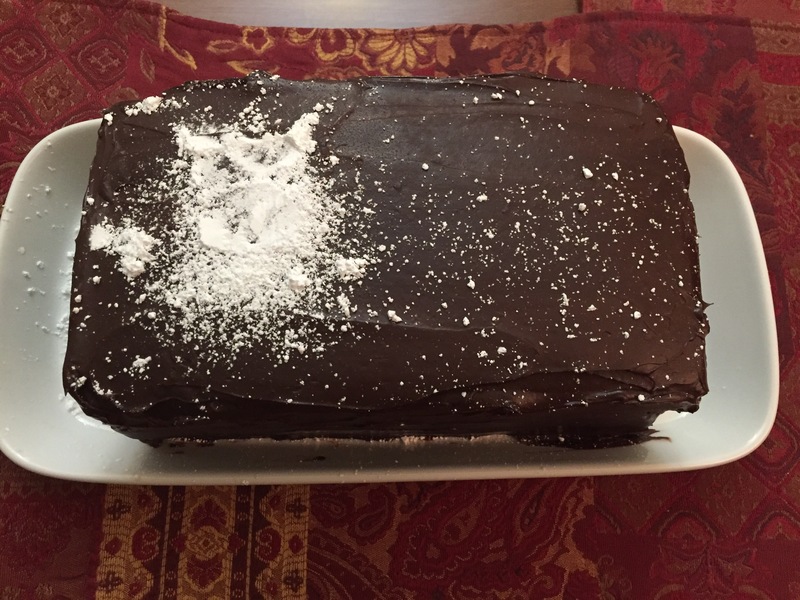 Repeat with remaining cake, brandy, and filling, ending with a layer of brandy-brushed cake. 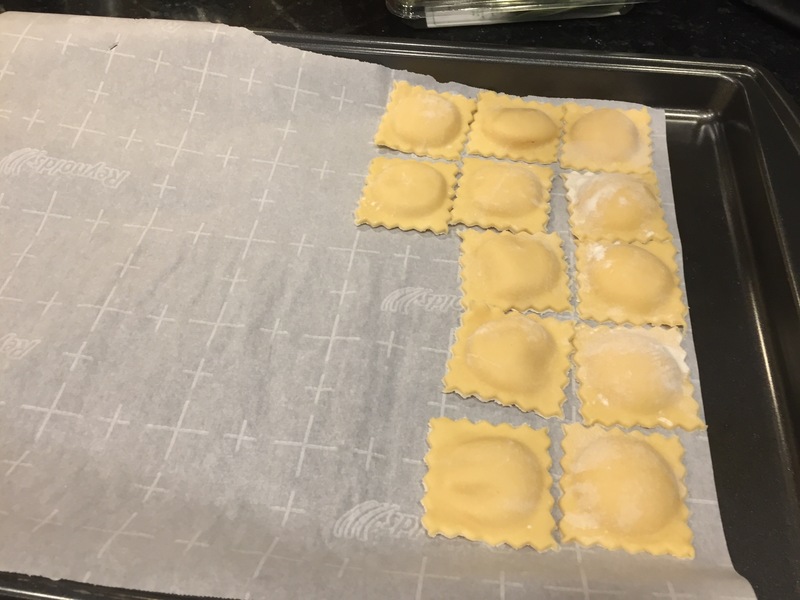 Refrigerate until set, about 30 minutes. 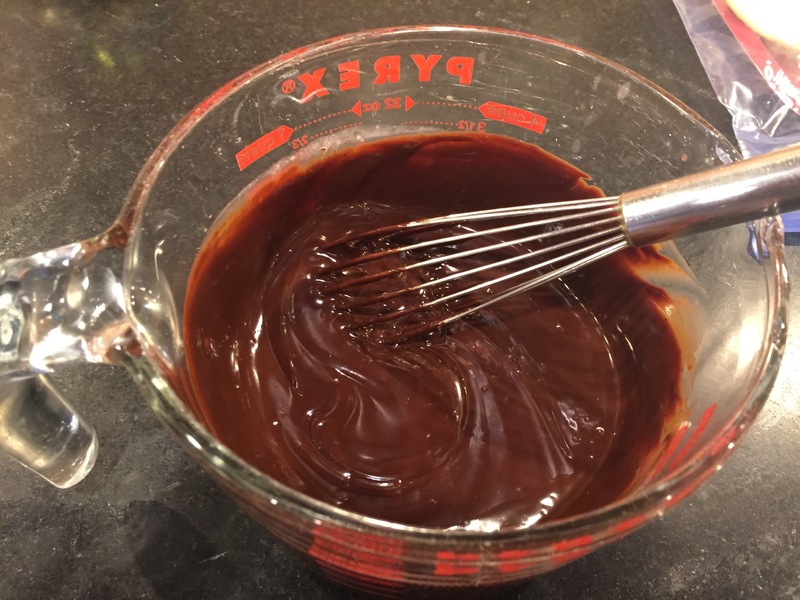 Make Chocolate Glaze. 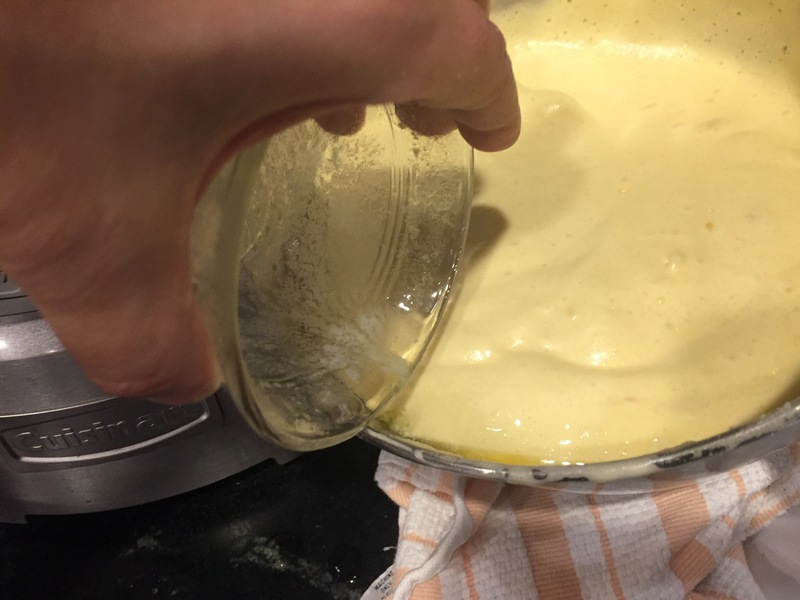 Pour over top of cake and spread so it drips down sides (or spread along sides). 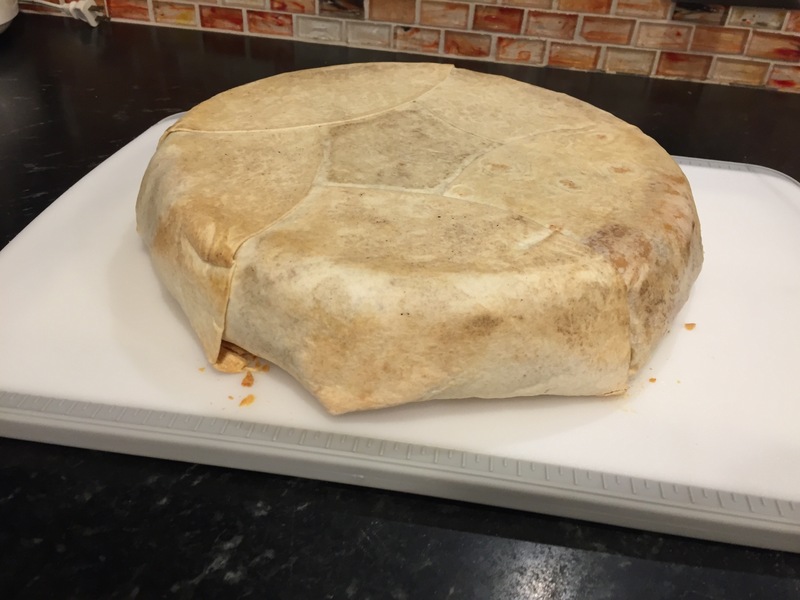 Cover and refrigerate 1 hour (or up to 2 days). 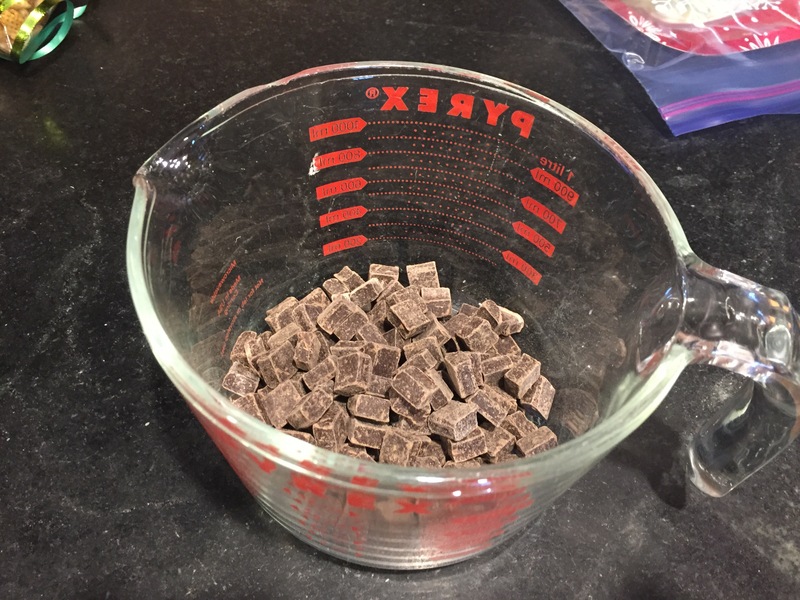 Place bittersweet chocolate, finely chopped, in a heatproof bowl. 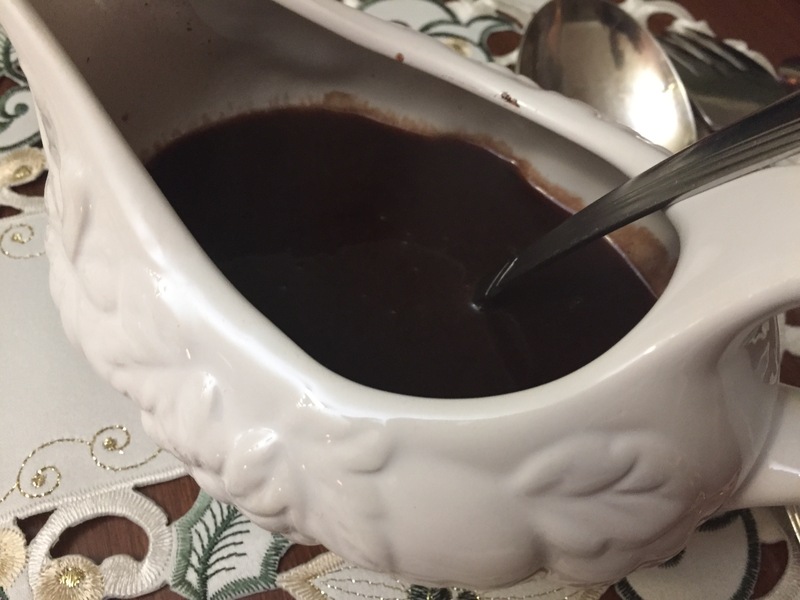 In a small saucepan, heat heavy cream over medium-high; when bubbling around edge, pour over chocolate. 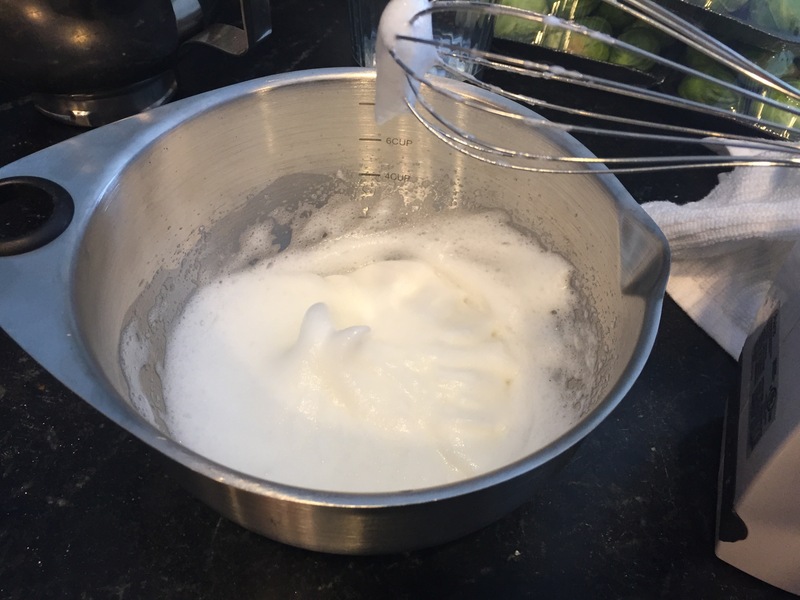 Let stand 5 minutes, then whisk until shiny and smooth.